Bad Girls Go Everywhere is inspired by the actress, Mae West. 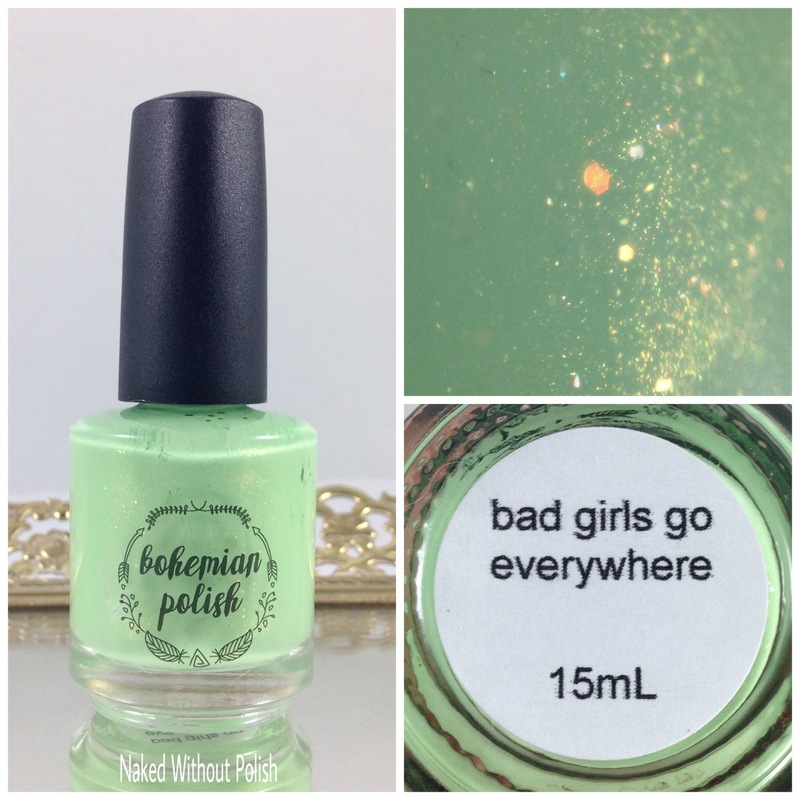 Bad Girls Go Everywhere is described as "a bold and sassy green with color shifting glitters, and gold shimmer that says 'Come up see me sometime!'". Shown is two coats of Bad Girls Go Everywhere with top coat. 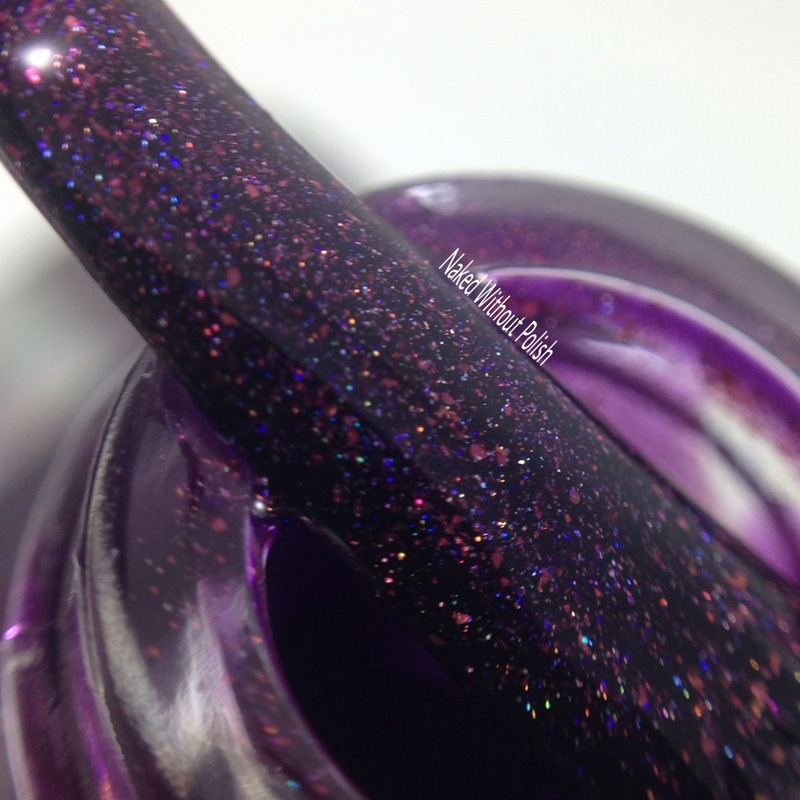 Bad Girls Go Everywhere had a smooth and creamy formula. 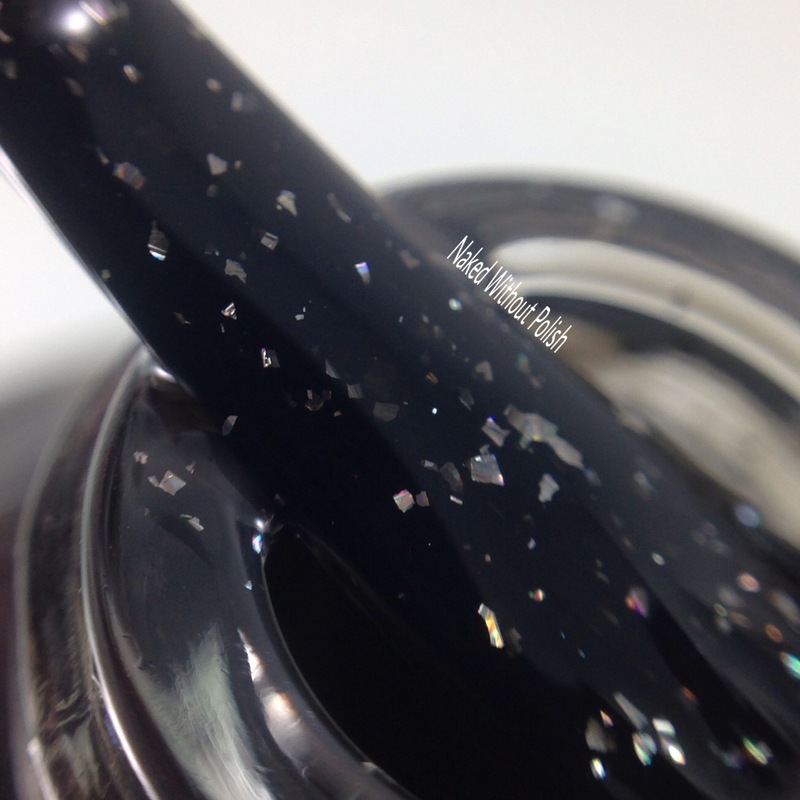 Very easy to use, and beautifully opaque in just two coats. 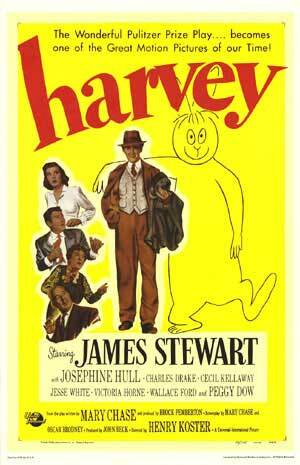 Pooka is inspired by the movie, Harvey. 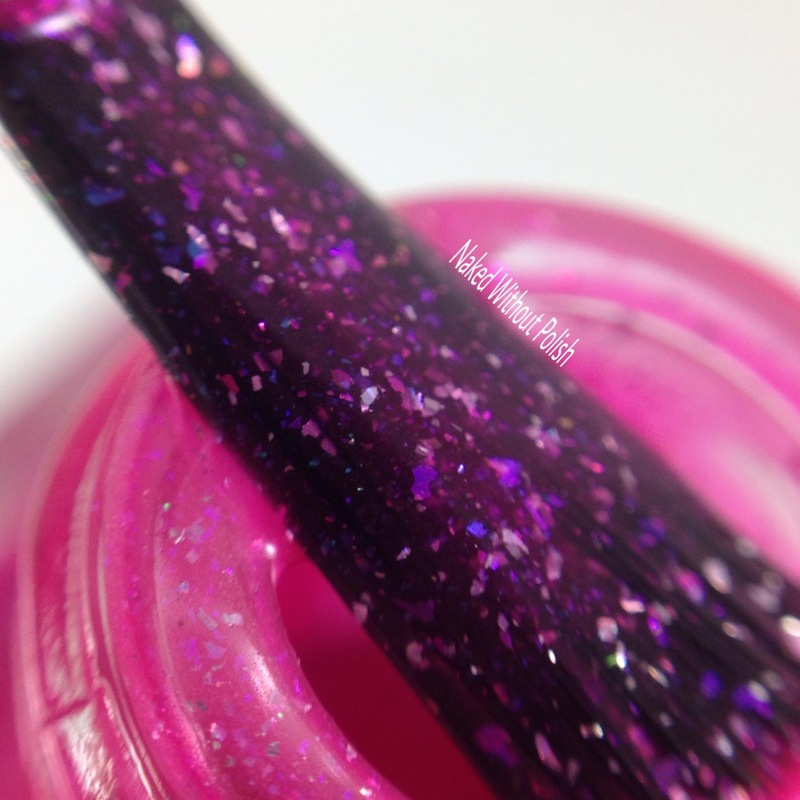 Pooka is described as "a gorgeous fuchsia jelly with a touch of flakies and holo". 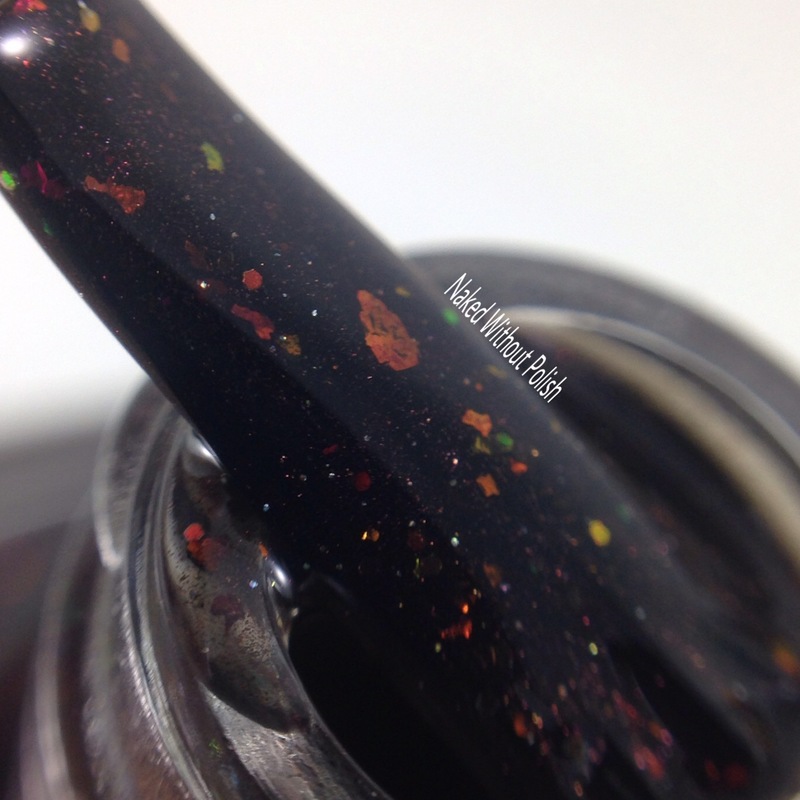 Shown is two coats of Pooka with top coat. 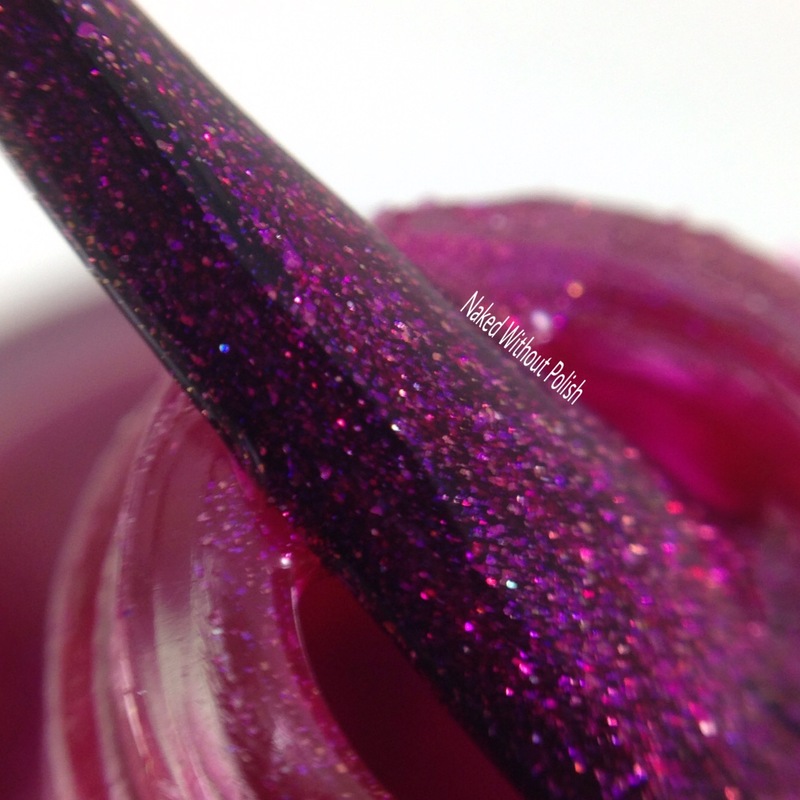 Pooka is such a gorgeous shade of fuchsia...borderline metallic. Very pigmented and almost a one coater, but two was best. 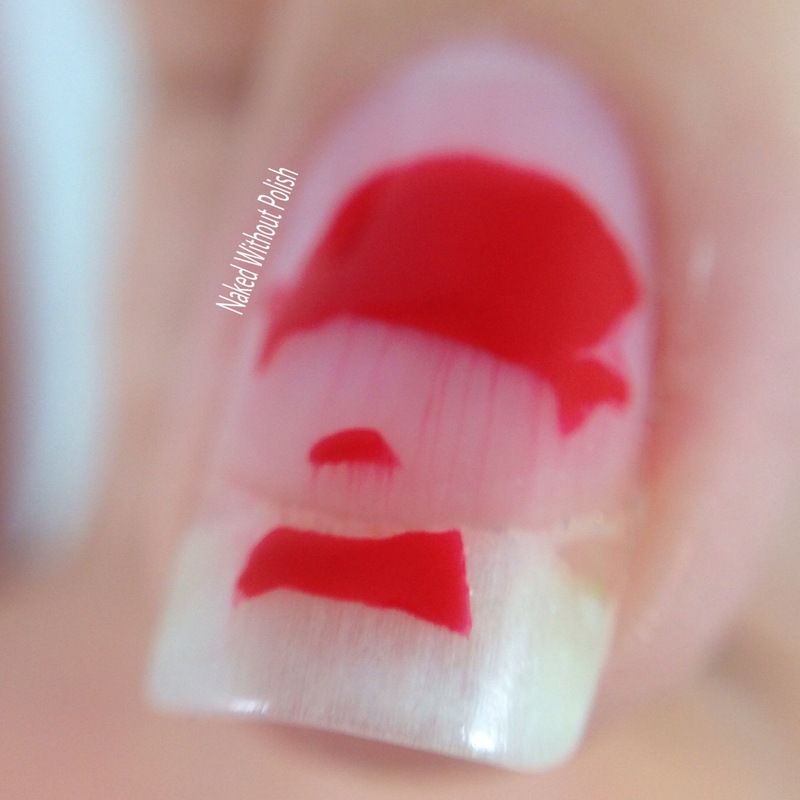 You get a great bit of depth with the flakies and a perfectly opaque mani after two flawless coats. 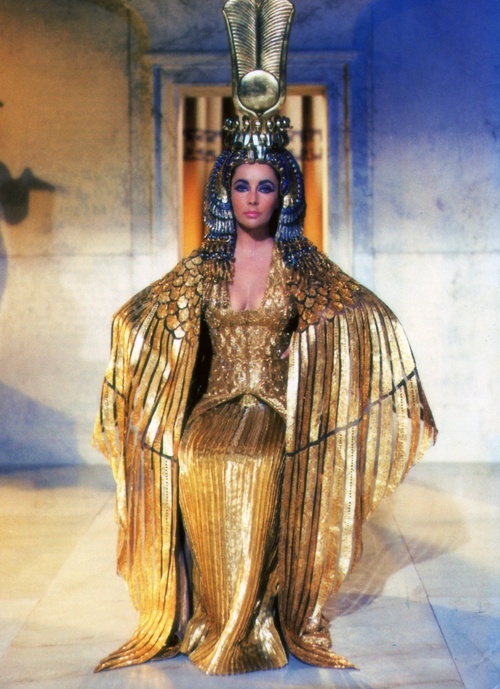 Elizabeth Taylor as Cleopatra is inspired by the movie, Cleopatra. 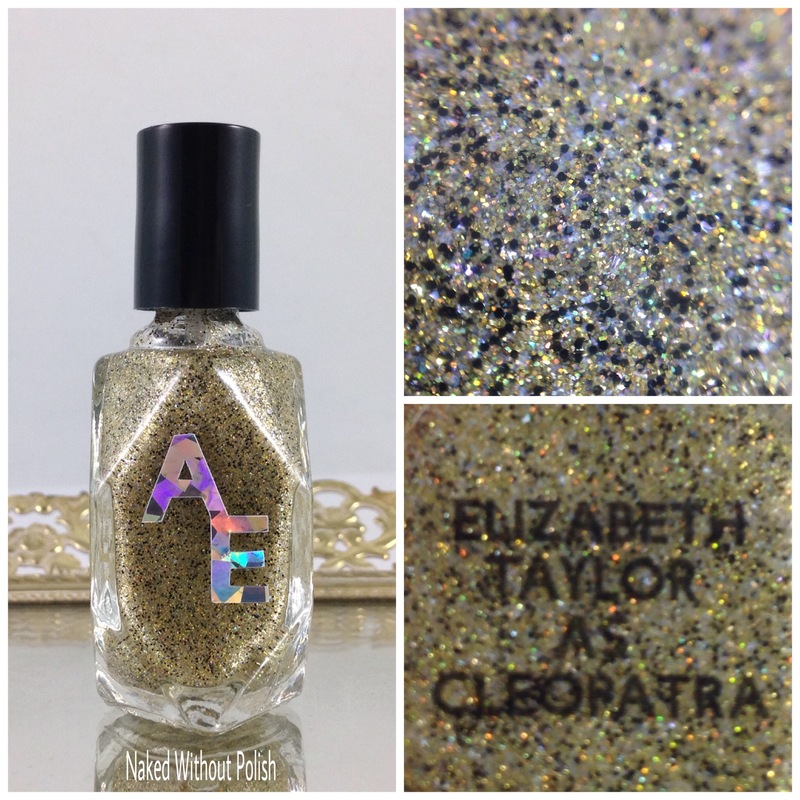 Elizabeth Taylor as Cleopatra is described as "a clear base filled with matte black micro glitter, holo and metallic gold micro glitter, and iridescent micro flakes". 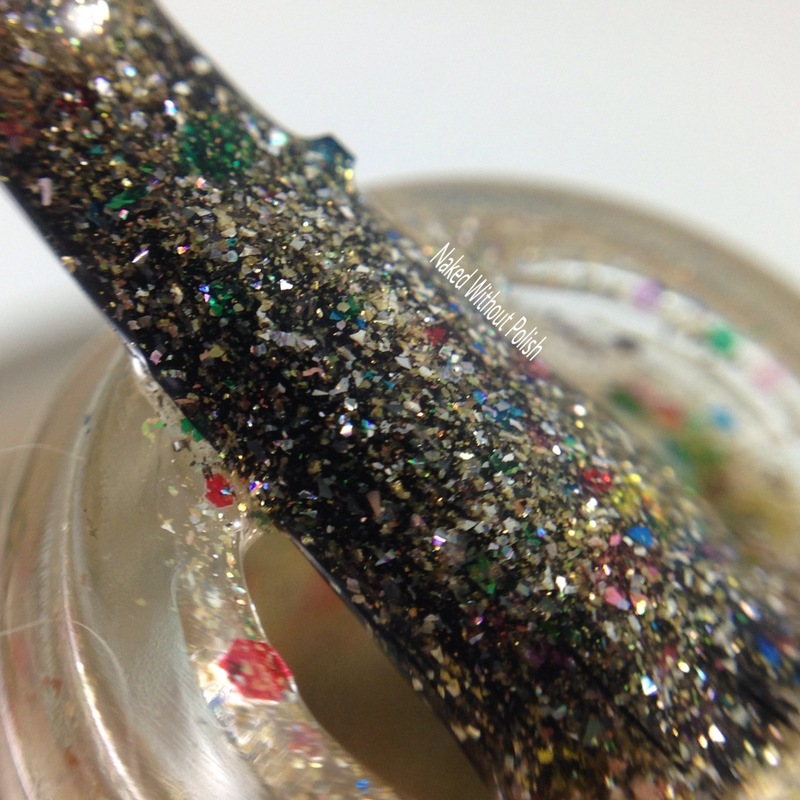 Shown is three coats of Elizabeth Taylor as Cleopatra with top coat. Elizabeth Taylor as Cleopatra would make a fantastic topper, but I chose to use it on its own to show it's true potential. It applied like a dream! No issues getting coverage. Three simple coats is all you need. It has a quick dry time so don't use thick coats trying to cut back on that. 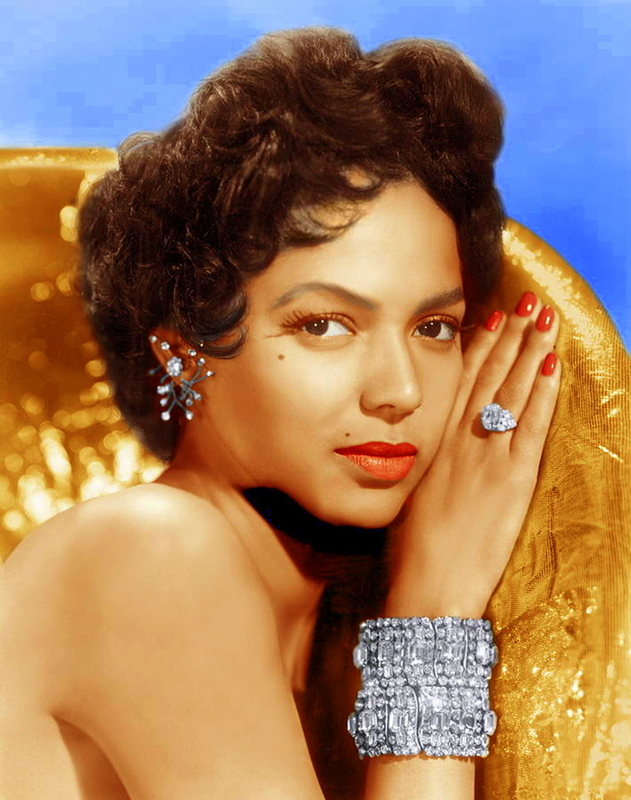 High Class Sass is inspired by the actress, Dorothy Dandridge. High Class Sass is described as "a deep purple creme based shimmer full of gold and red micro flakies, and a dusting of holo sparkle". 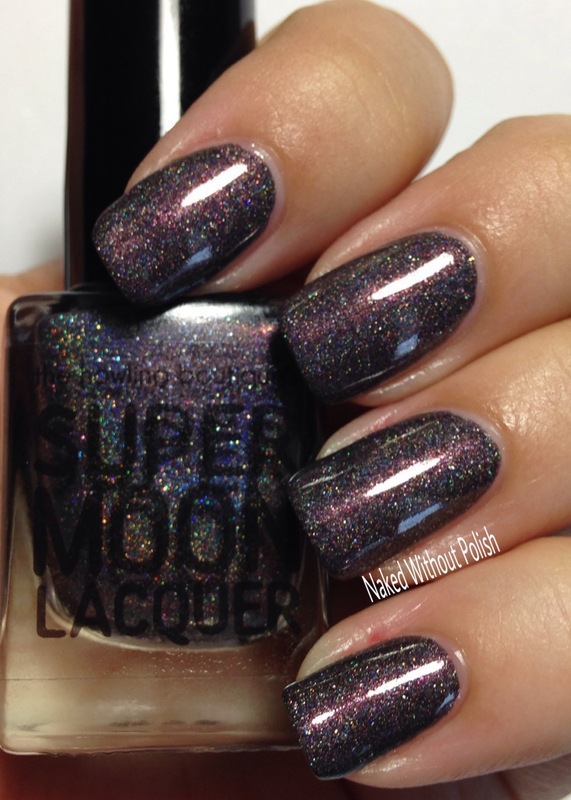 Shown is two coats of High Class Sass with top coat. High Class Sass is a beautiful, deep, dark, mystery...just like Dorothy herself. A gorgeous formula and easy application. You'll get lost in its magic for sure. 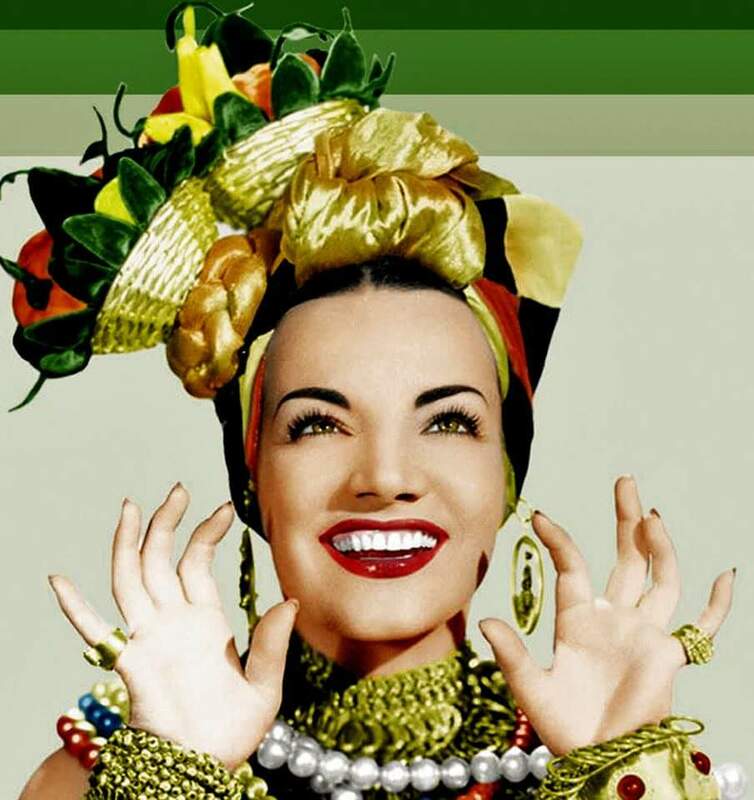 Tutti Frutti Hat is inspired by the actress and singer, Carmen Miranda. 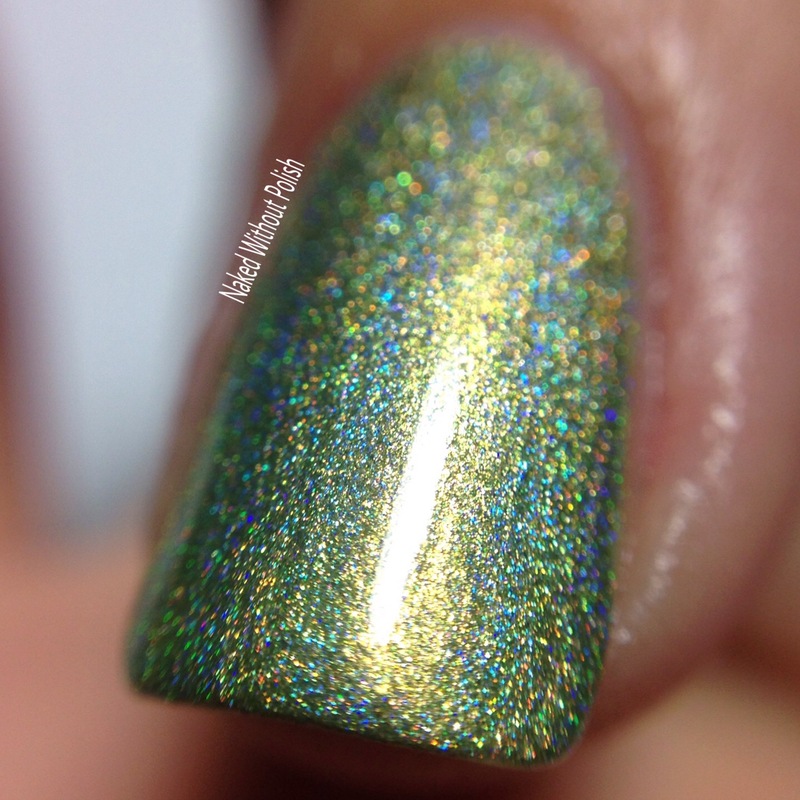 Tutti Frutti Hat is described as "a shimmery gold base full of genuine silver micro flakes, scattered holo sparkle, silver holo micro flakes, and a rainbow of multi-sized stained glass-esque glitter, and a smattering of green-gold ultrachrome flakies". Shown is three coats of Tutti Frutti Hat with top coat. 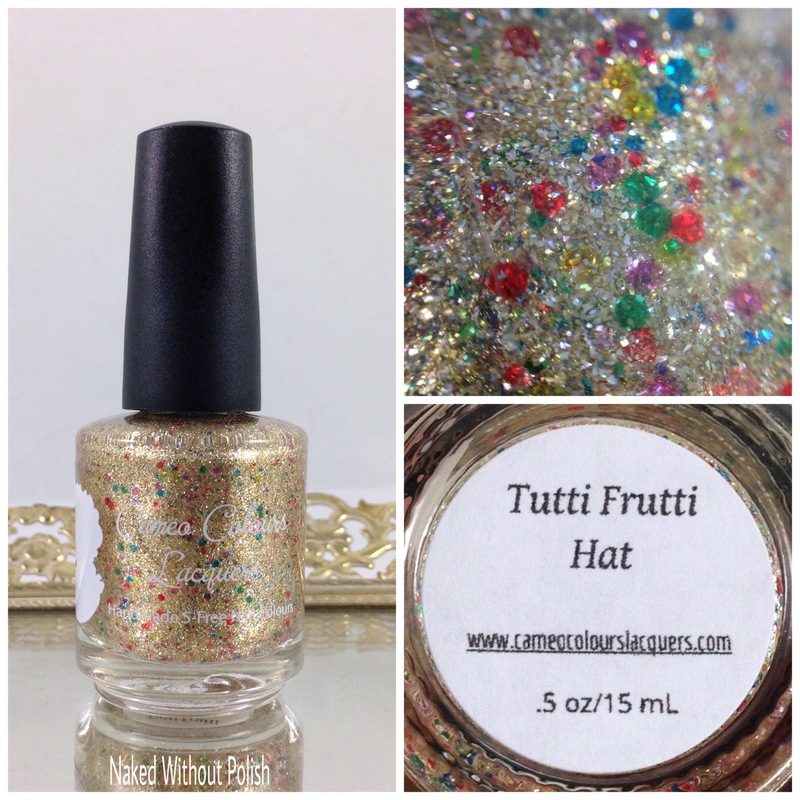 Tutti Frutti Hat is a party in a bottle! 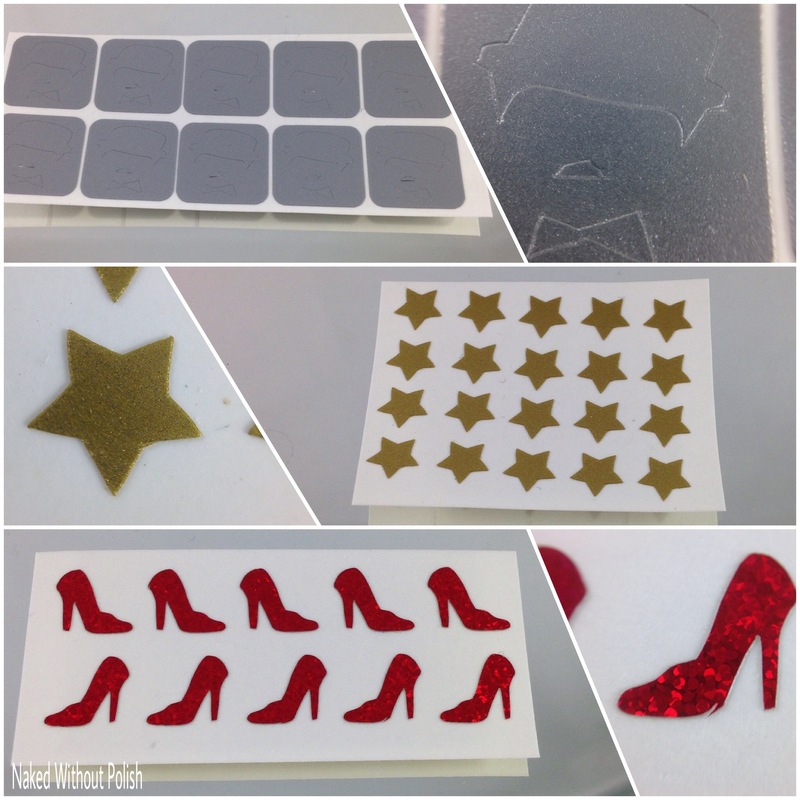 It's too packed to be used as a topper, but you'll get full opacity with three easy coats. No fishing for anything here. 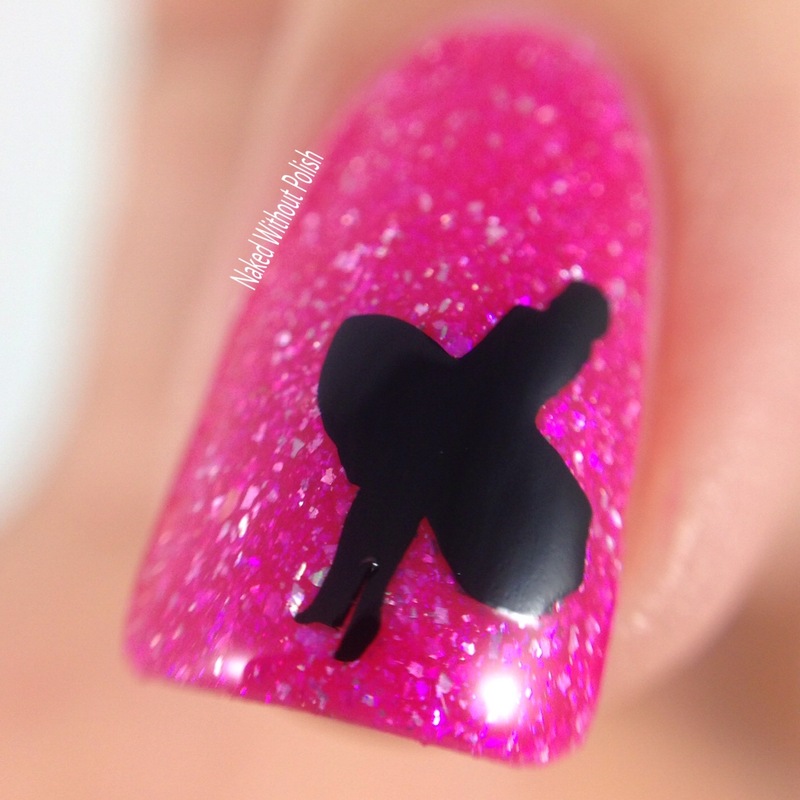 A perfect base for some stamping or nail art! 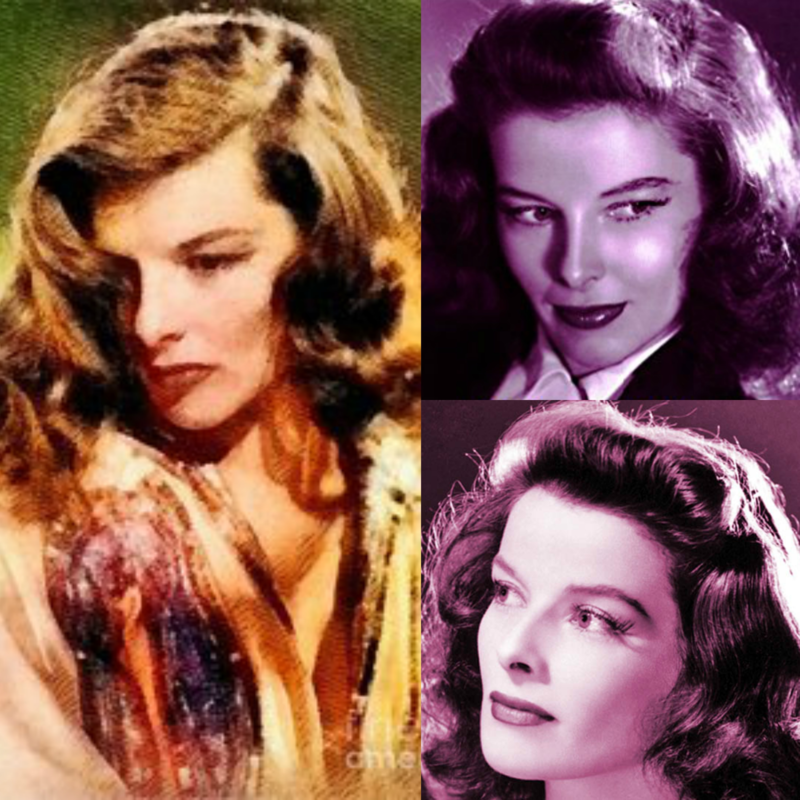 Fierce & Feisty is inspired by the actress, Katharine Hepburn. 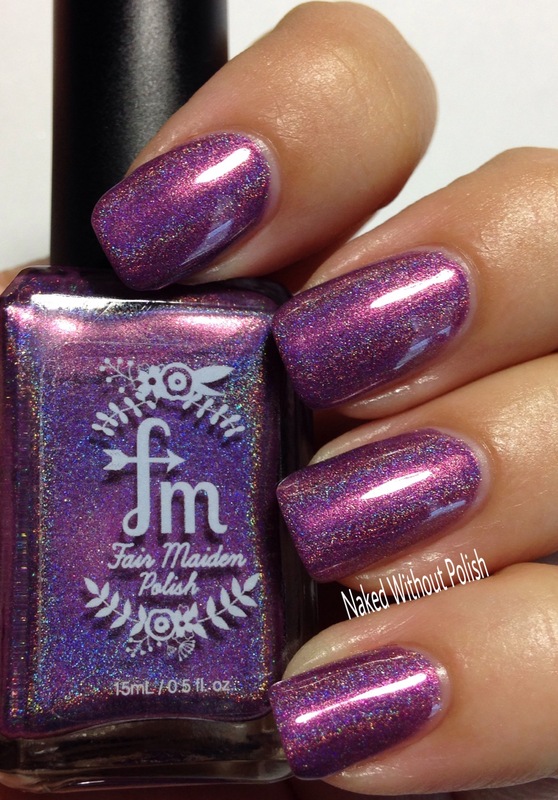 Fierce & Feisty is described as "a deep, plum purple linear holo with copper shimmer, and reddish pink iridescent flakies". 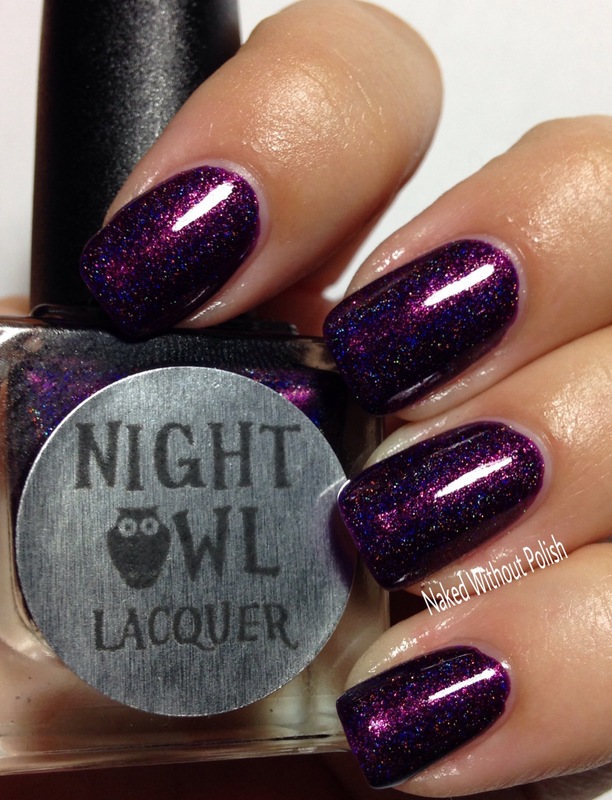 Shown is two coats of Fierce & Feisty with top coat. 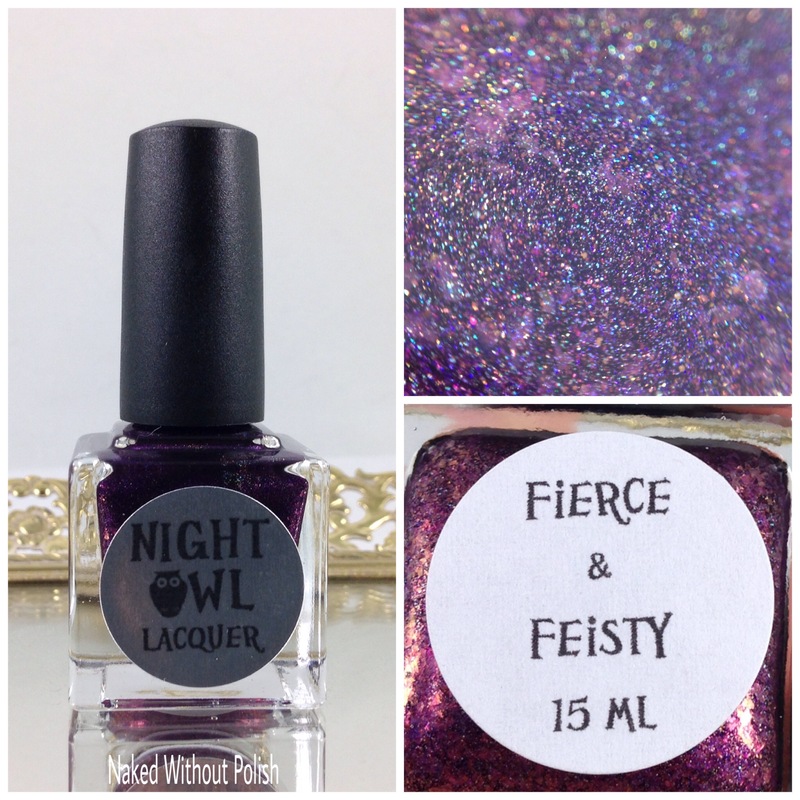 Fierce & Feisty is exactly what you'll feel when wearing this beauty. The formula is smooth and applies like a dream. Zero complaints here! 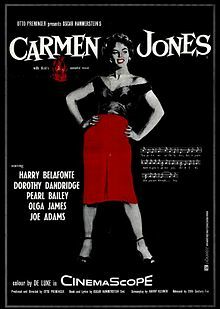 Dorothy Dandridge is inspired by the actress, Dorothy Dandridge. 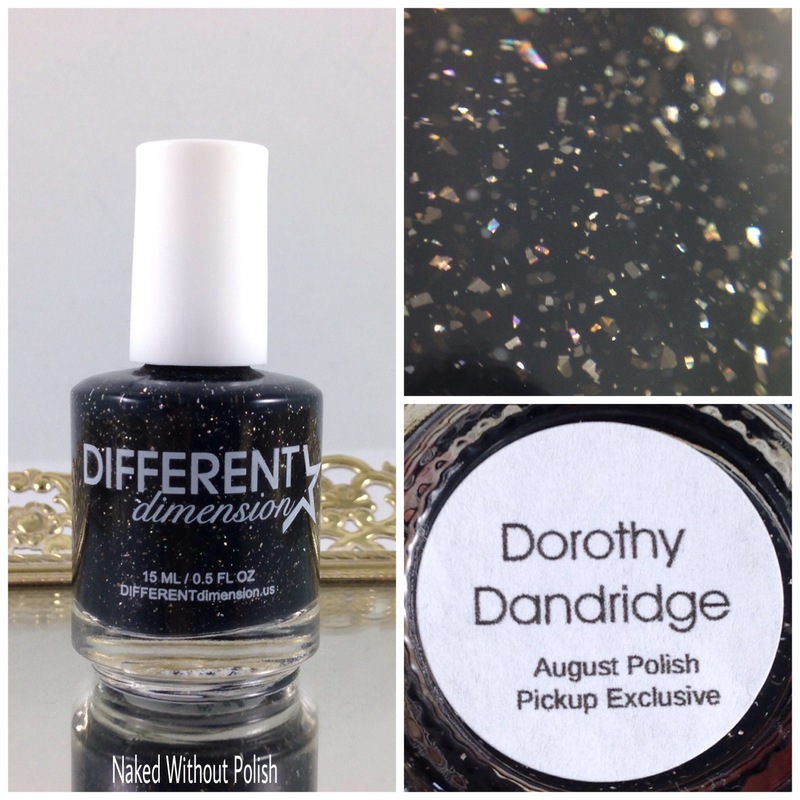 Dorothy Dandridge is described as "a black jelly polish with holo microflakes". Shown is two coats of Dorothy Dandridge with top coat. Dorothy Dandridge is the squishiest of black jellies! A bit patchy with the first coat, but evens out after the second. 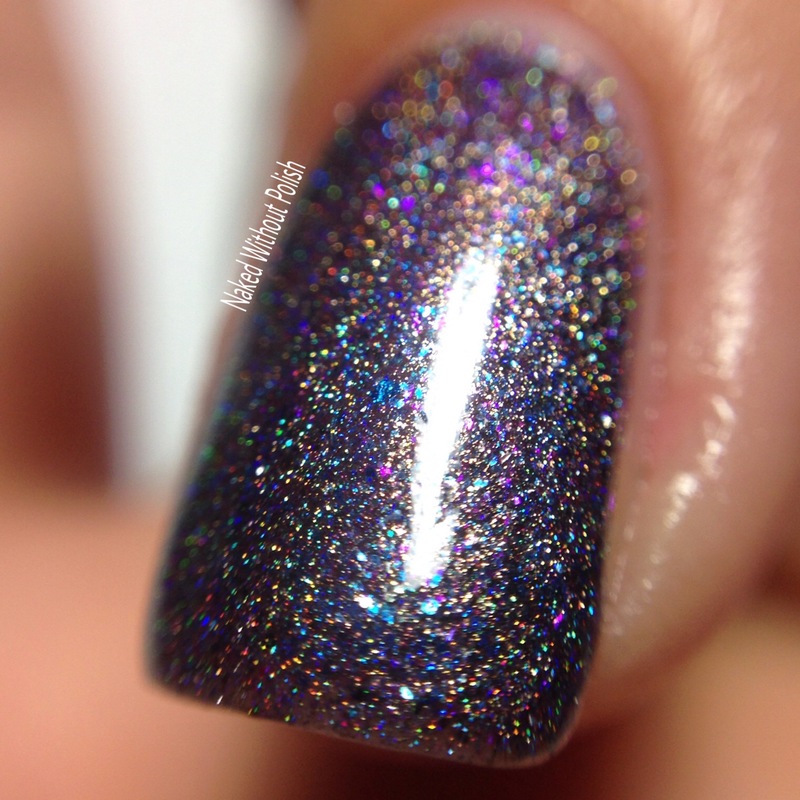 You get a gorgeous depth with the layering of the flakies. 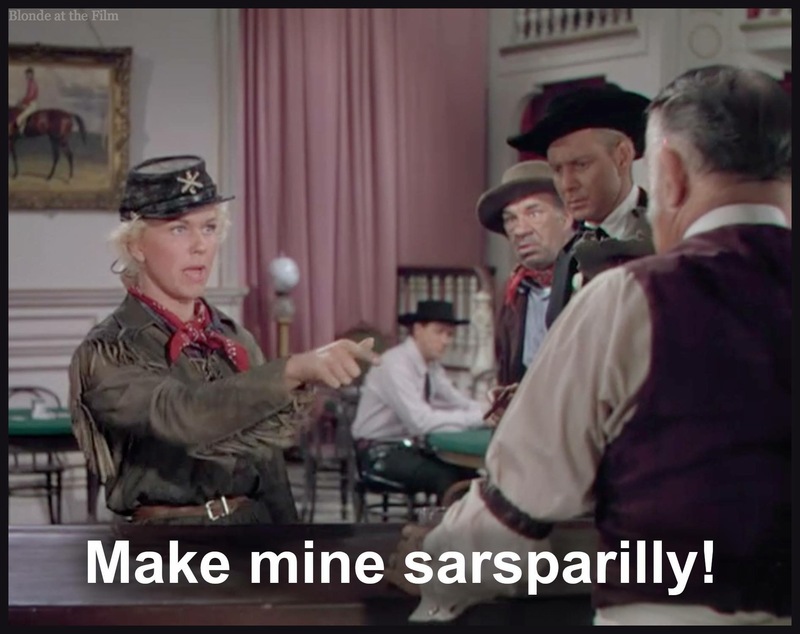 Make Mine Sarsaparilly is inspired by the actress Doris Day in the movie Calamity Jane. 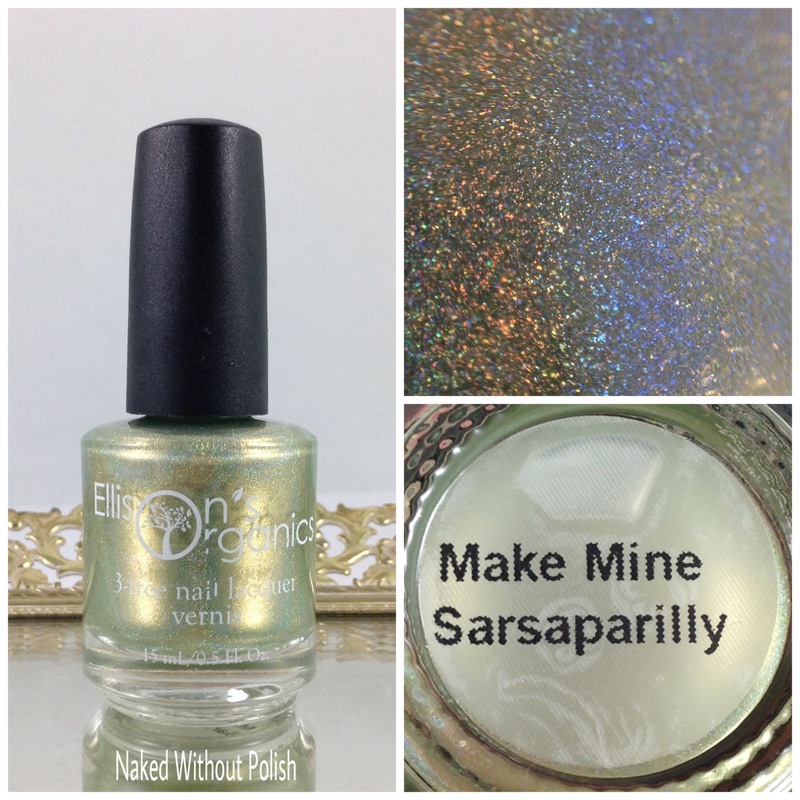 Make Mine Sarsaparilly is described as "an olive gold linear holo". 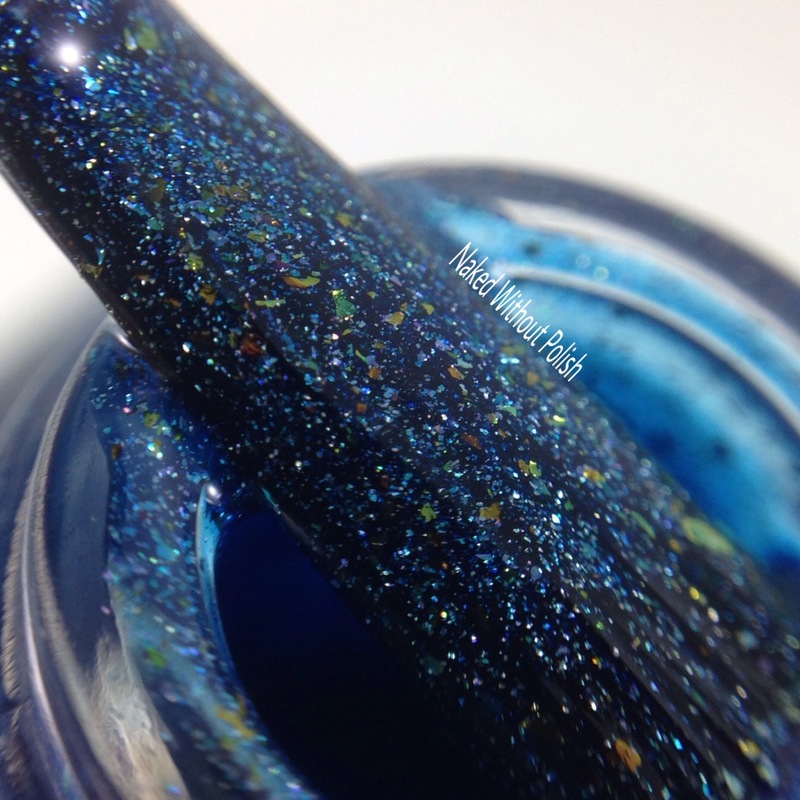 Shown is two coats of Make Mine Sarsaparilly with top coat. 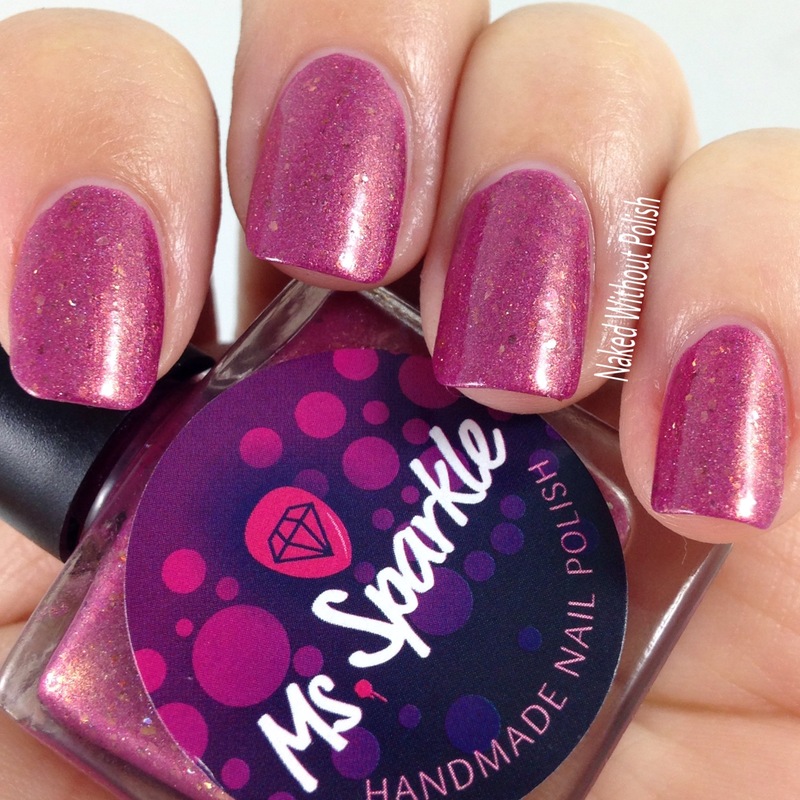 Make Mine Sarsaparilly stole my heart with this color. I love a good olive, and this is a fantastic olive! Almost a one coater but not quite. I bet this one would stamp even! 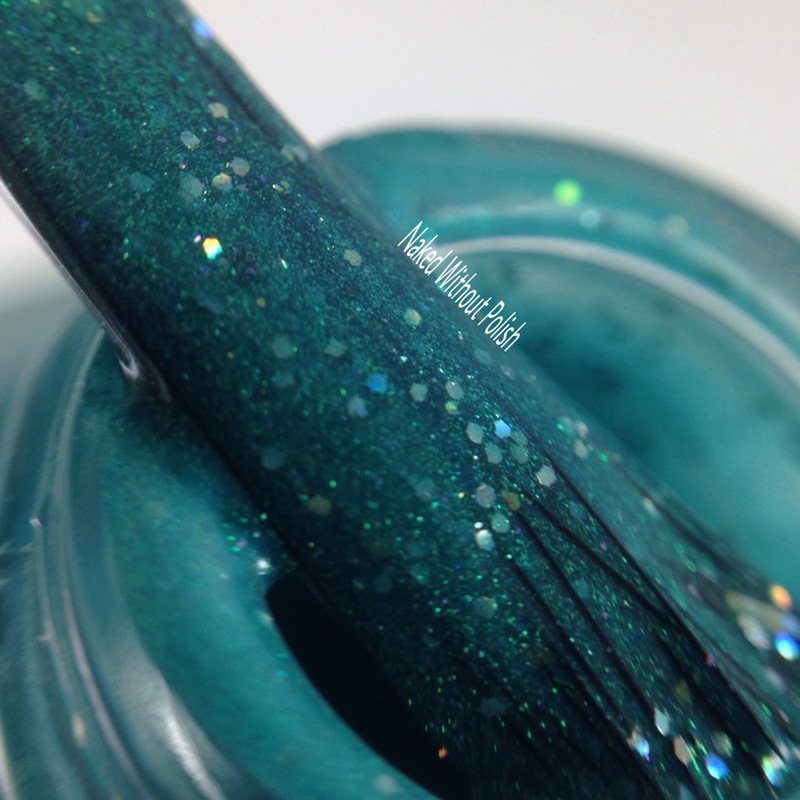 Like a Mermaid is inspired by the actress, Esther Williams. 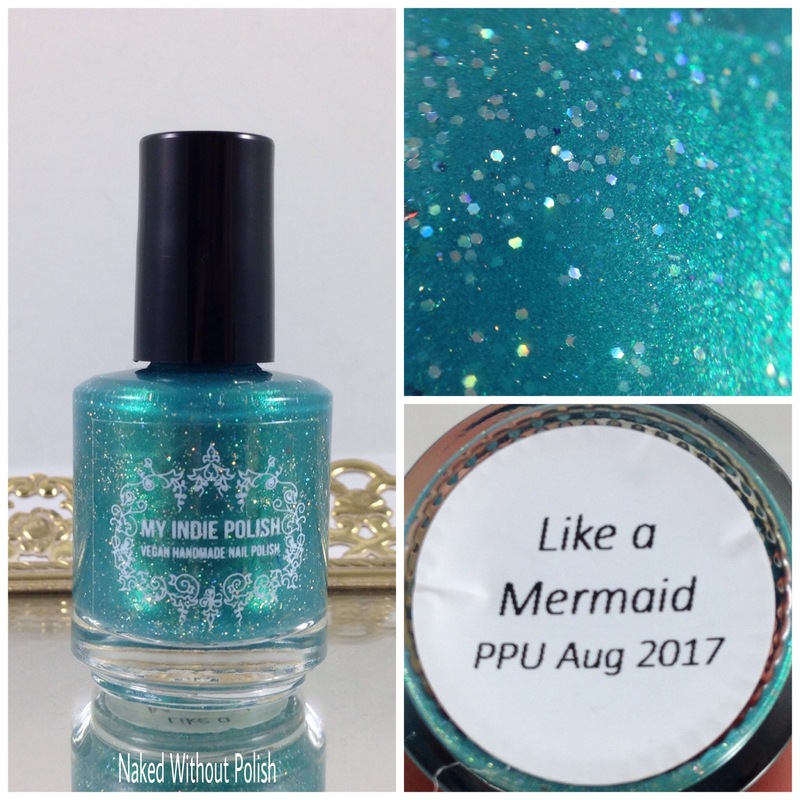 Like a Mermaid is described as "a shimmery blue-green polish with two types of holo, a lovely shimmer, and some awesome glitter". 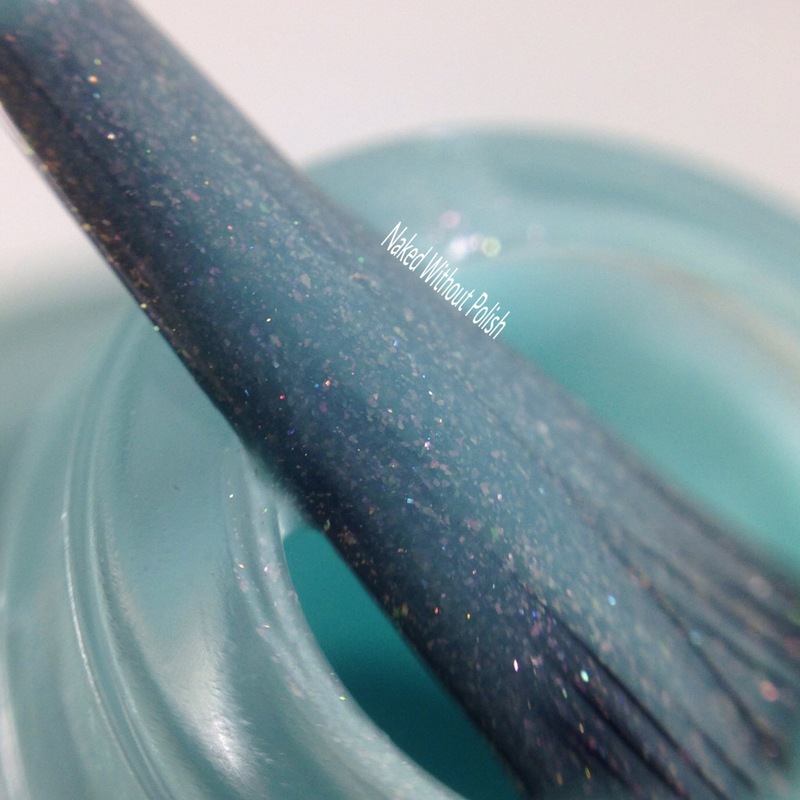 Shown is two coats of Like a Mermaid with top coat. 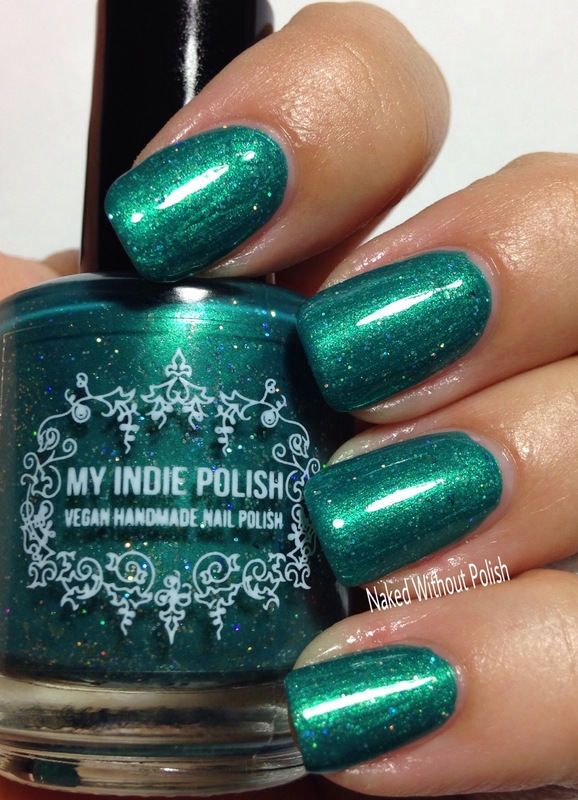 Like a Mermaid is a gorgeous shade of teal, and the perfect polish for this inspiration. 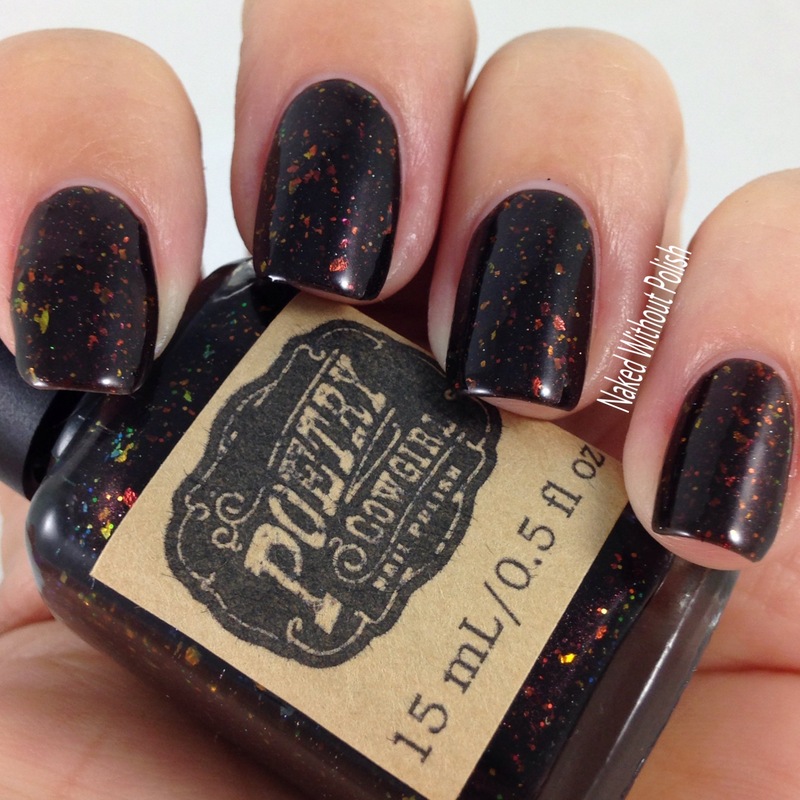 Beautiful application and formula, and only two coats for full opacity. She's in the middle of moving so there are only 13 bottles of this available. Don't miss out on this one! 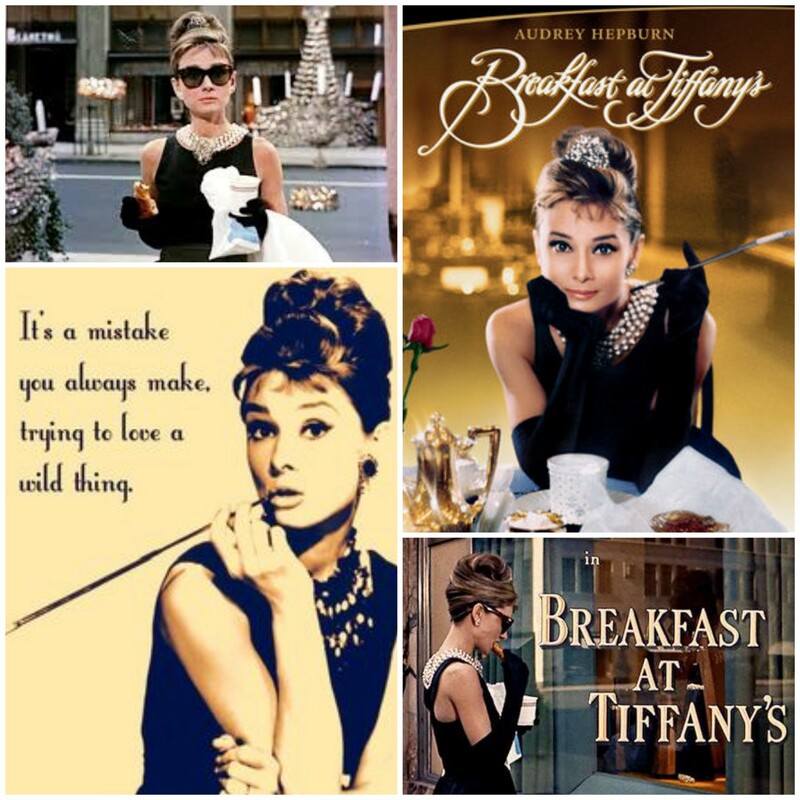 Never Love a Wild Thing is inspired by the movie, Breakfast at Tiffany's. 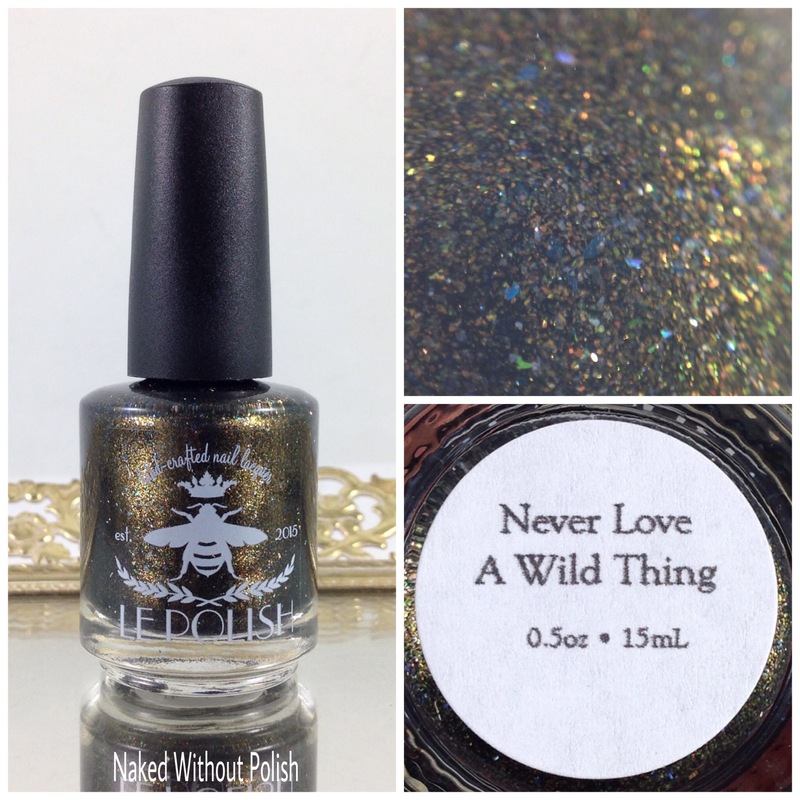 Never Love a Wild Thing is described as "a black polish full of gold shimmer, micro flakes, and holo flakes". 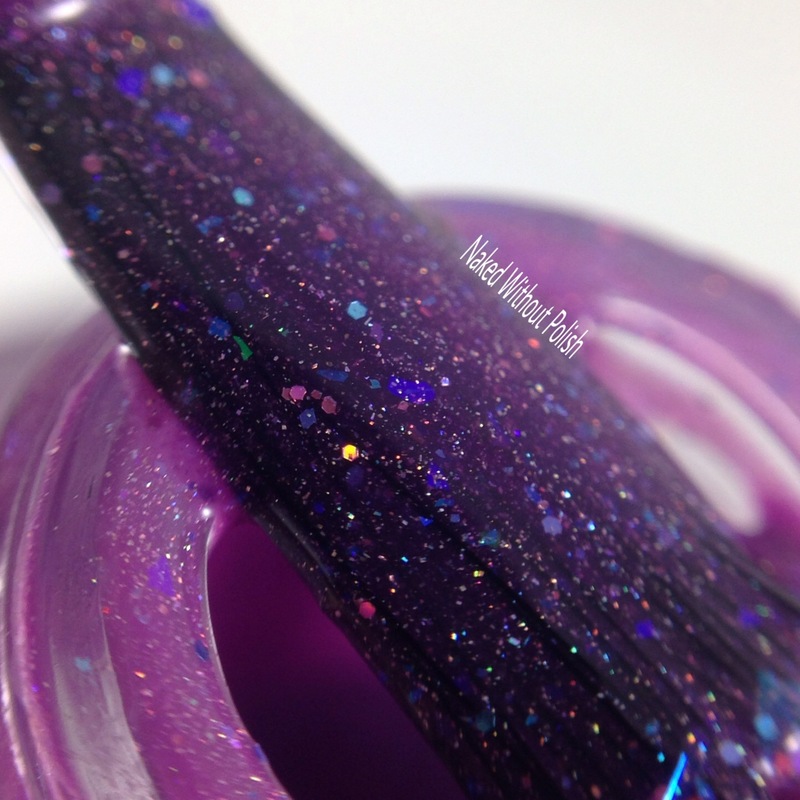 Shown is two coats of Never Love a Wild Thing with top coat. 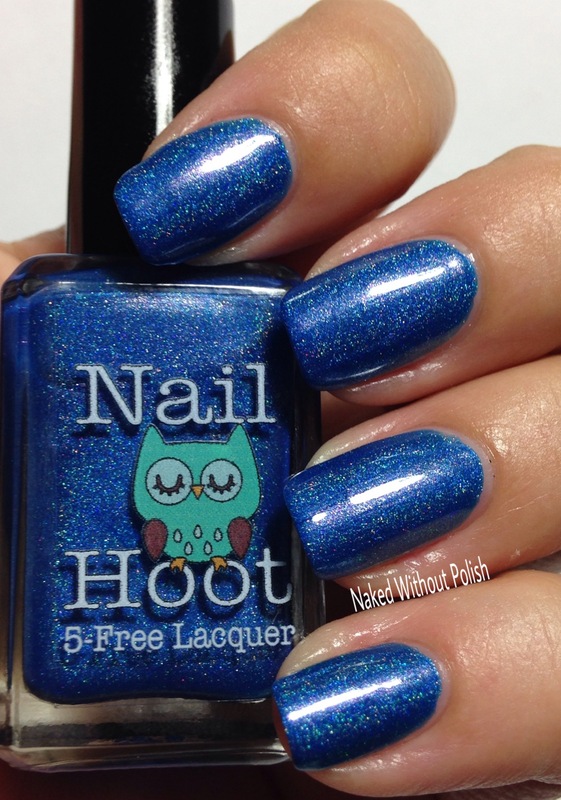 Never Love a Wild Thing is the perfect polish for this inspiration. 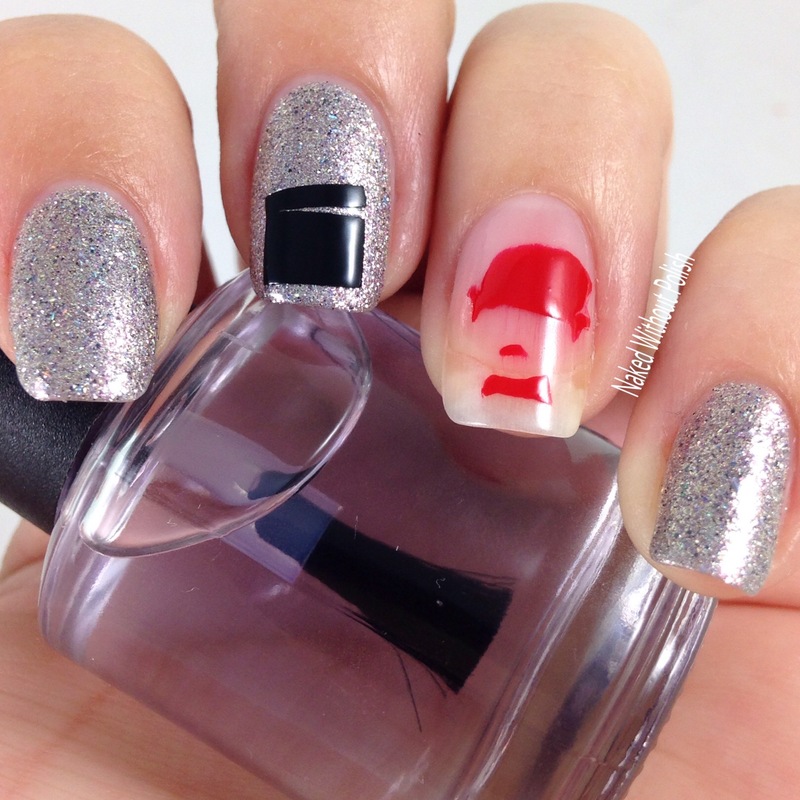 It is an intriguing polish...just like Holly Golightly. It looks simple at first glance, but it is a bunch of things brought together to make it look so perfect. Two coats is all you'll need for perfection here. I just wish I could have captured the shimmer better. No Wire Hangers! 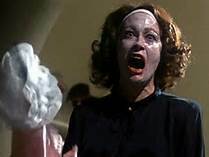 is inspired by the movie, Mommie Dearest. No Wire Hangers! 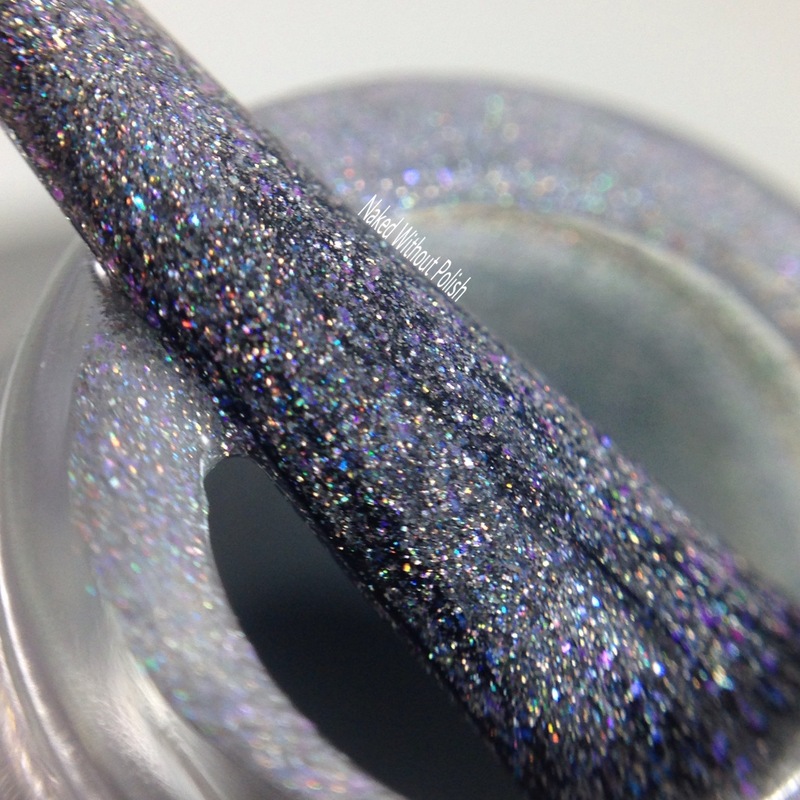 is described as "a steel grey linear holo polish with grey, pink, and blue micro flakes that make the polish shift from grey to pink to blue". Shown is three coats of No Wire Hangers! with top coat. No Wire Hangers! is sure to have you screaming for more! Fantastic formula and application. It is a little sheer so three coats is needed for full opacity. Would probably be good as a topper too! 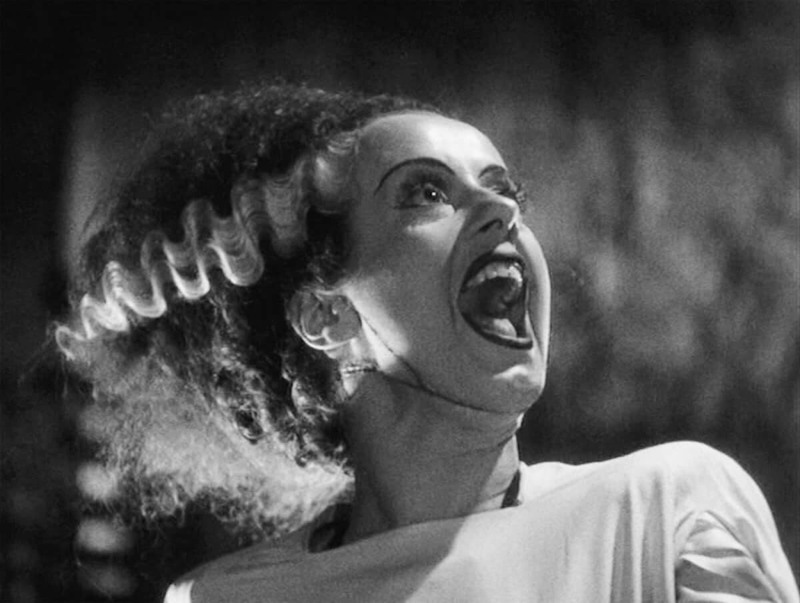 The Bride is inspired by the movie, Bride of Frankenstein. 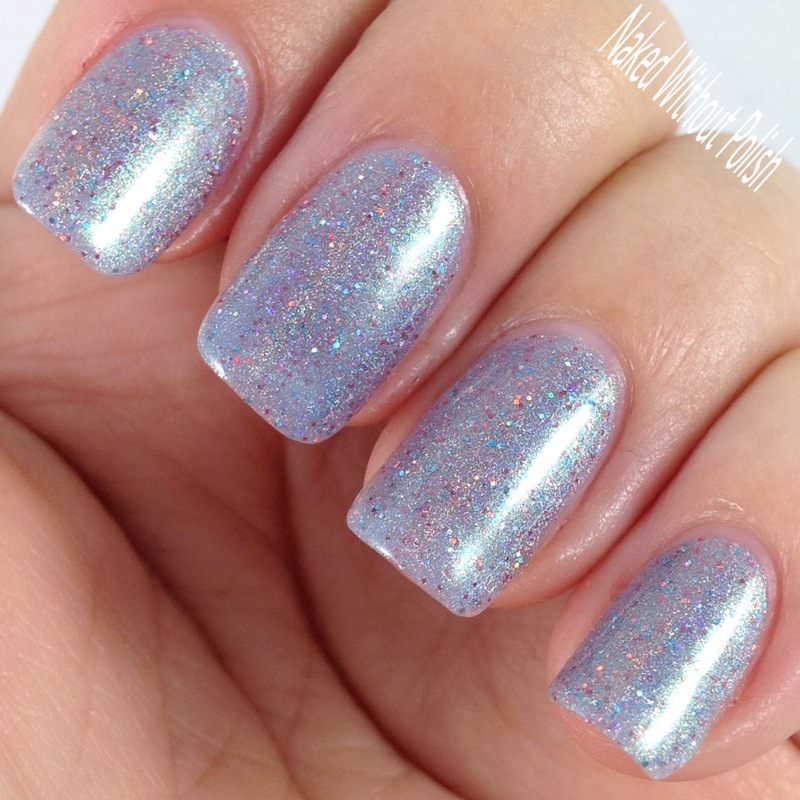 The Bride is described as "an electrifying scattered holo silver base accented with blue sparks". 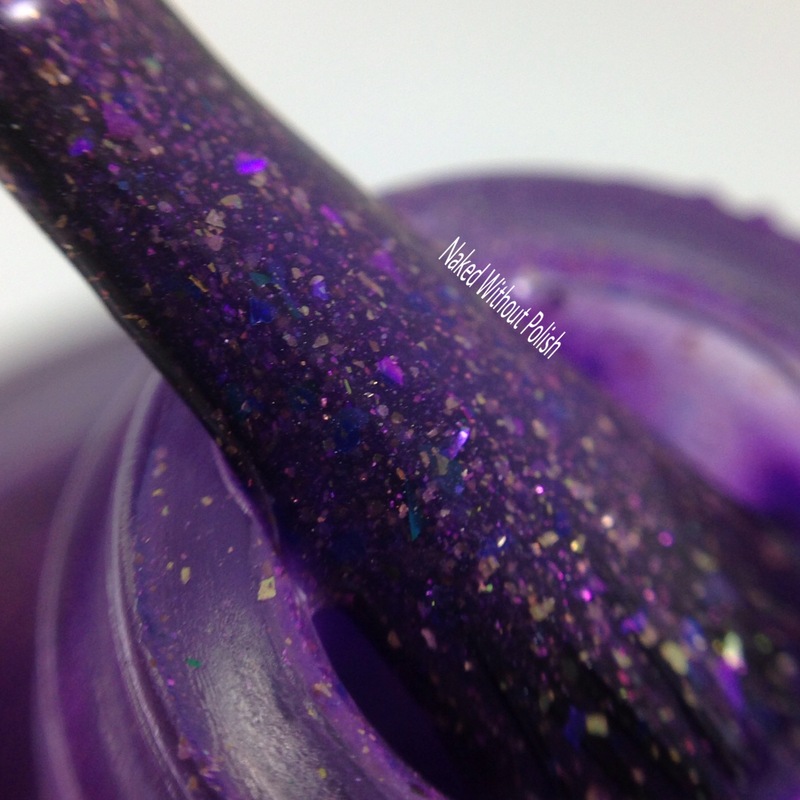 Shown is two coats of The Bride with top coat. 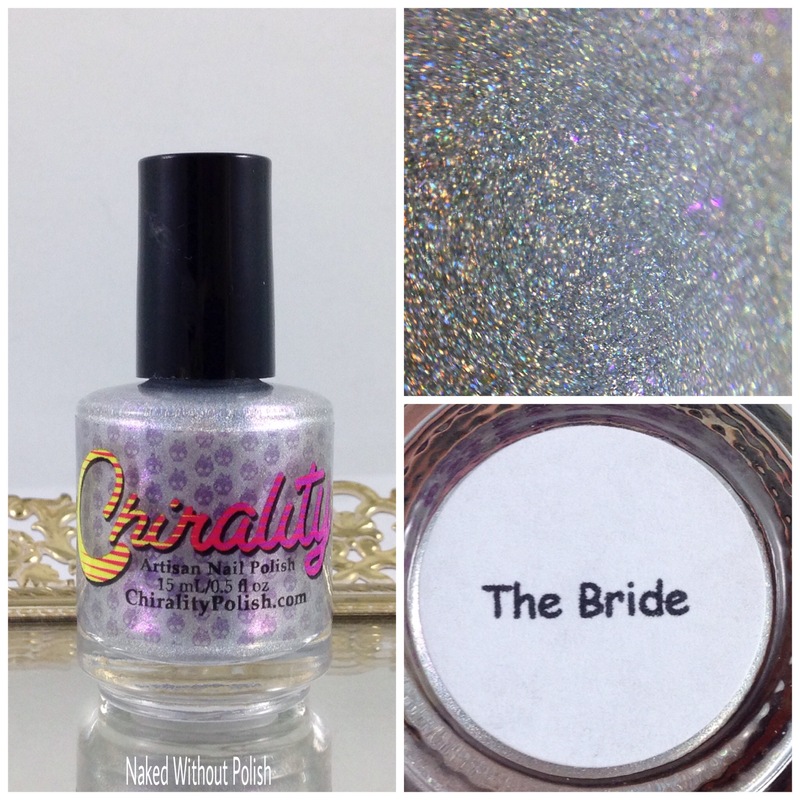 The Bride is one of the best silvers I've ever used. It was just almost a one coater, but that second coat was necessary. Perfect formula and application. Flawless polish. Nothing to scream at here. 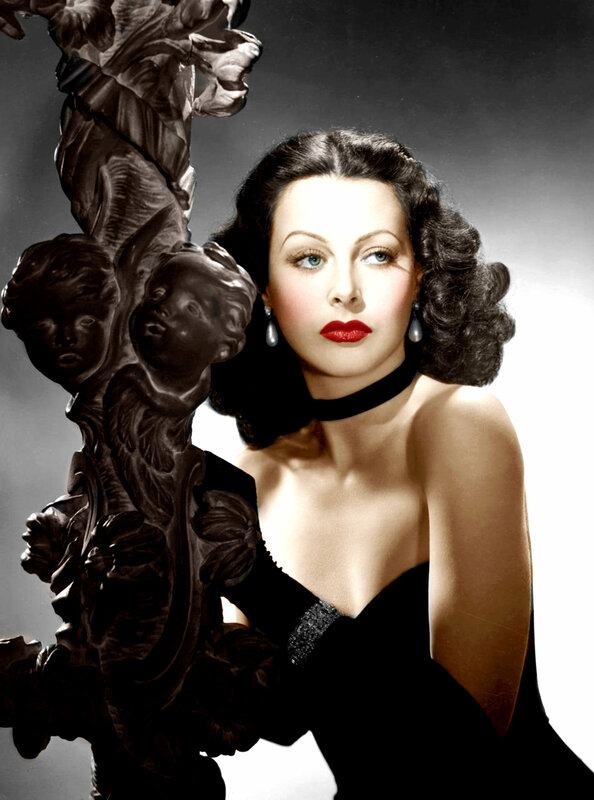 Style & Substance is inspired by the actress, Hedy Lamarr. Style & Substance is described as "a pink-leaning red base with shimmer in shades of pink, gold, and mauve". Shown is two coats of Style & Substance with top coat. Style & Substance is the perfect year round color. Beautiful formula that was a breeze to work with, and an impeccable application. She used the perfect amount of shimmer. It all balances so well together. You'll be more than happy after two coats. You're sure to feel a bit elegant while wearing this one too! 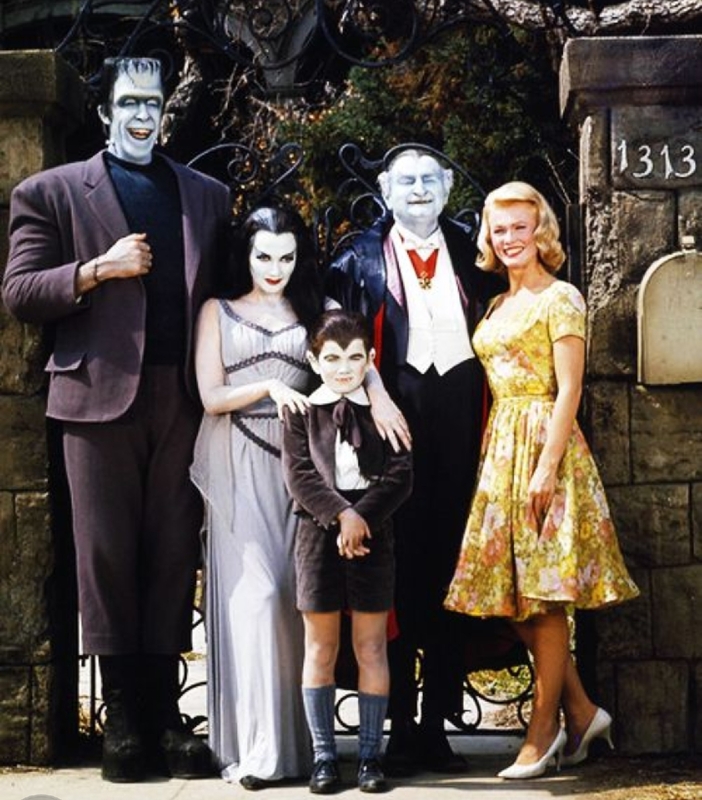 1313 Mockingbird Lane is inspired by the TV show, The Munsters. 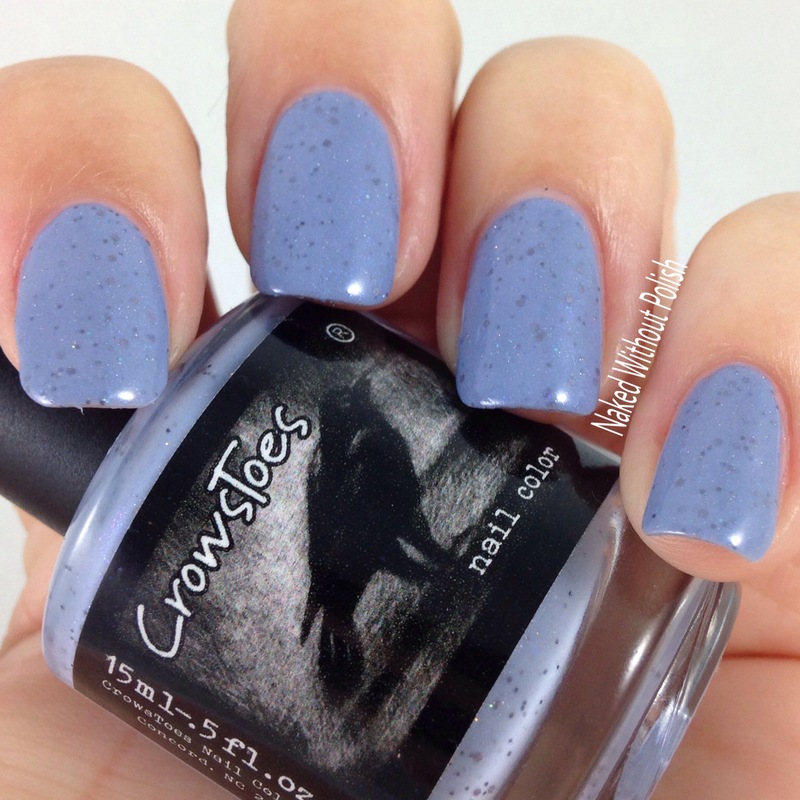 1313 Mockingbird Lane is described as "a blue grey base with a red/gold shift, and matte black and white glitter". 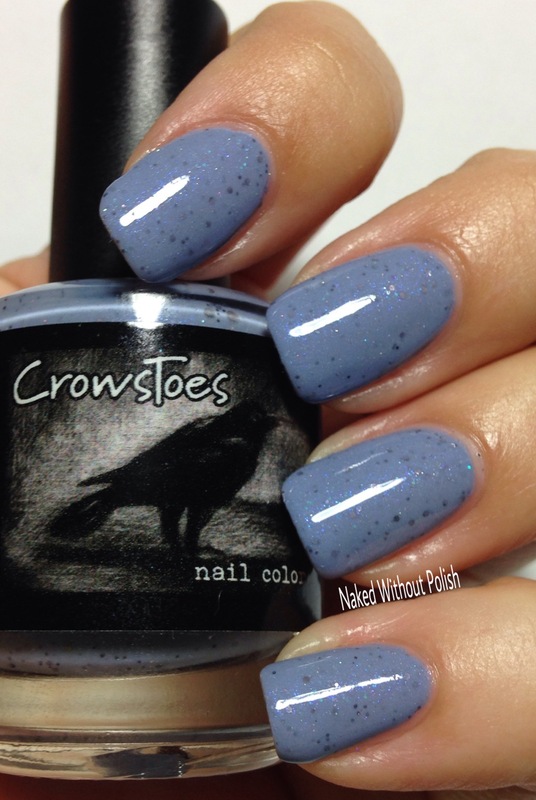 Shown is two coats of 1313 Mockingbird Lane with top coat. 1313 Mockingbird Lane absolutely blew me away! The shimmer goes crazy and pops every chance it gets. 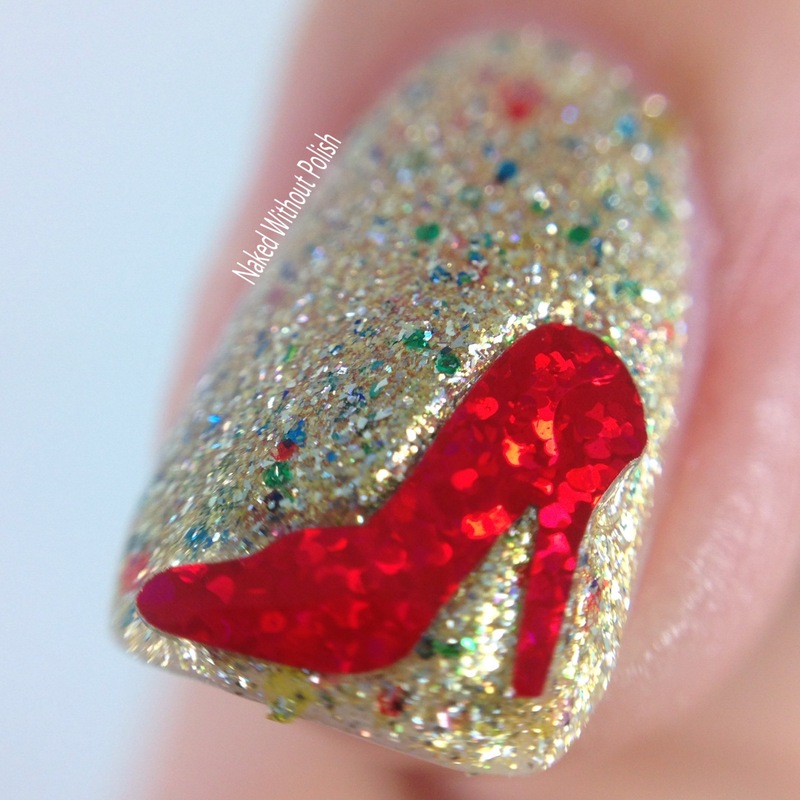 She used the perfect amount of glitter. No need to fish for it or mess with it on the nail. 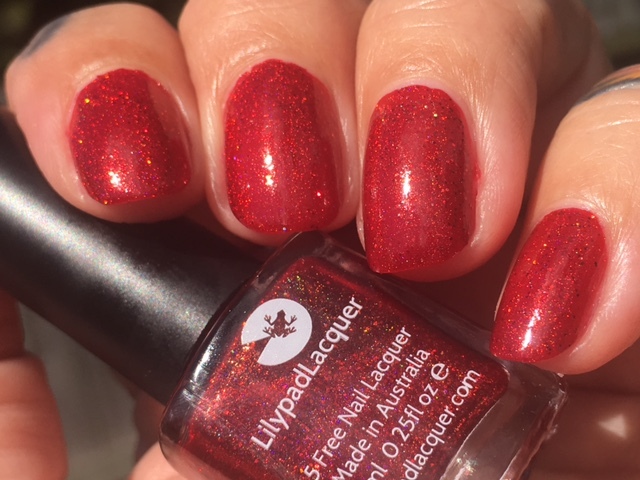 Everything about this polish is fantastic! 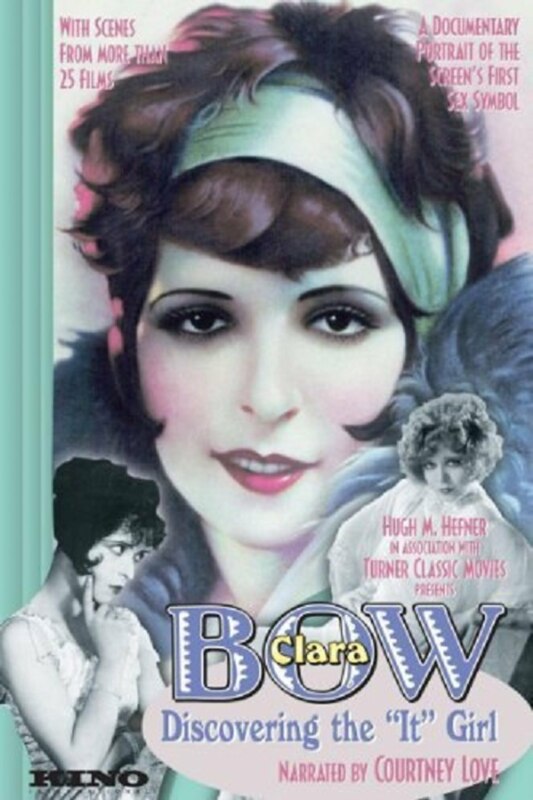 The Original "It" Girl is inspired by the actress, Clara Bow. 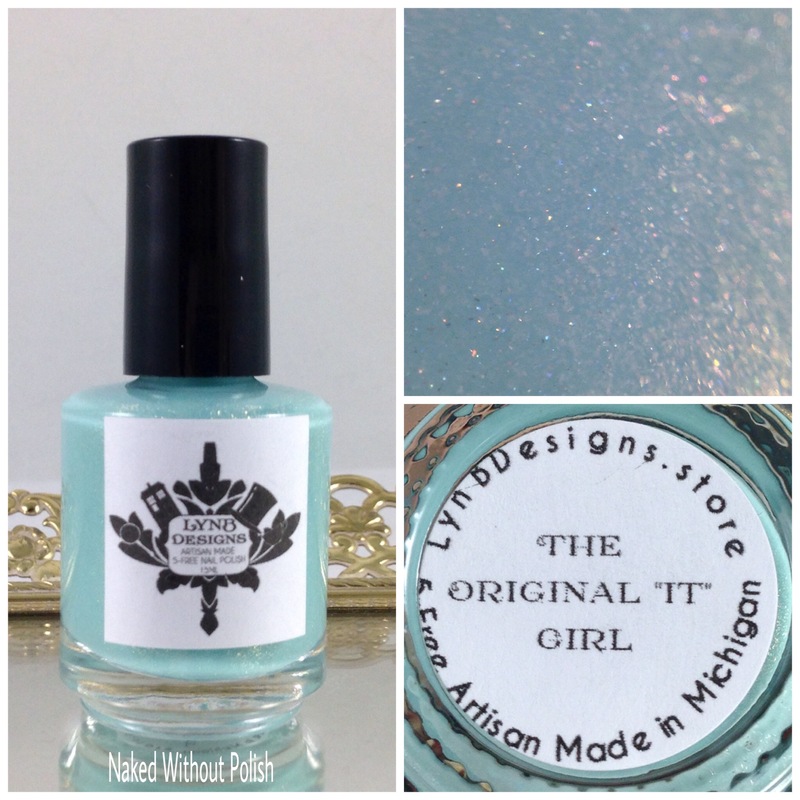 The Original "It" Girl is described as "a light teal aqua crelly base with holo shimmer, and pink to gold shifting shimmer". 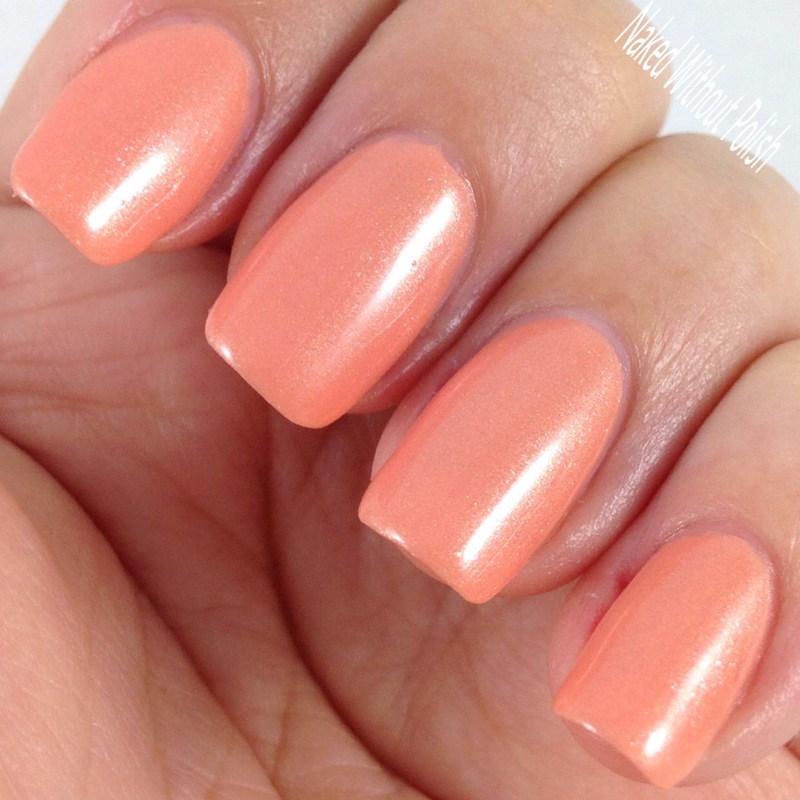 Shown is three coats of The Original "It" Girl with top coat. The Original "It" Girl is such a perfect spring-y color. The crelly was a bit streaky at first coat, but evened out and became opaque after the third coat. 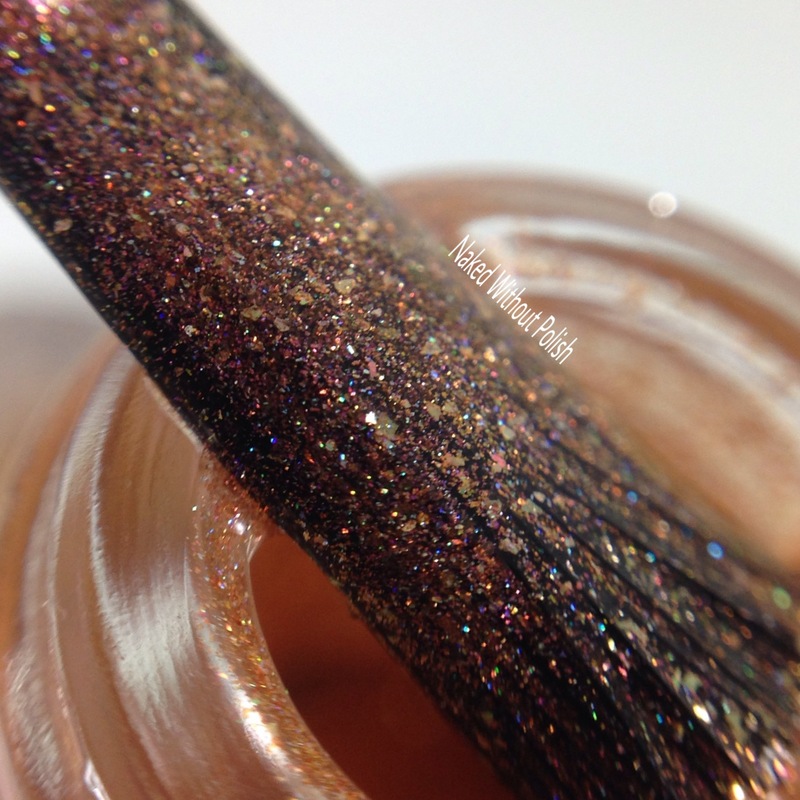 This shimmer in this is so flirty. You'll have some fun with it! 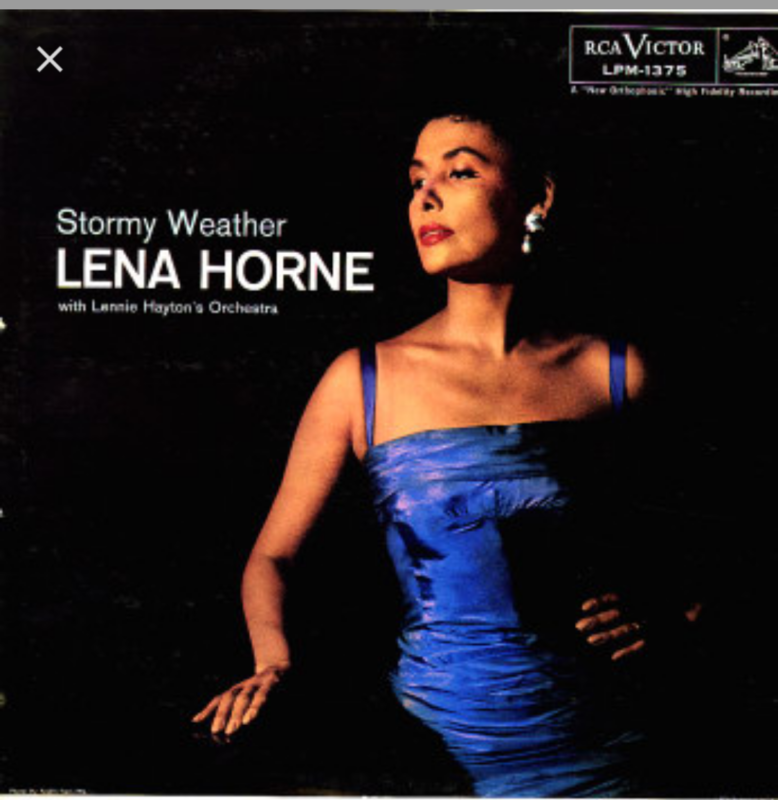 Stormy Weather is inspired by the singer/actress, Lena Horne. 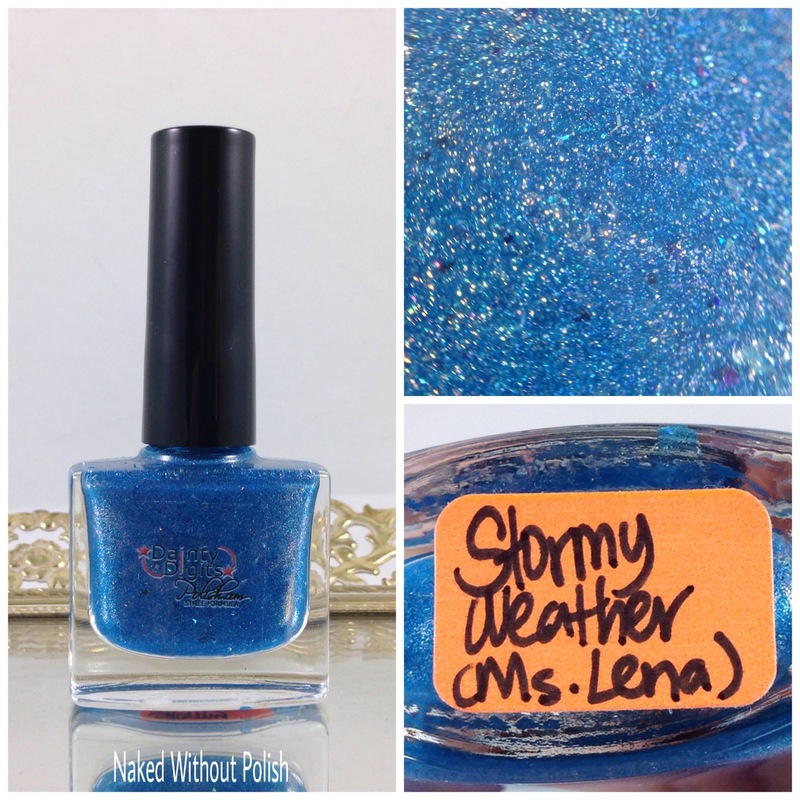 Stormy Weather is described as "a gorgeous cerulean polish with holo shimmer, blue/navy/violet UCC flakies, and silver metallic micro shimmer". Shown is two coats of Stormy Weather with top coat. Stormy Weather is a stunner!! 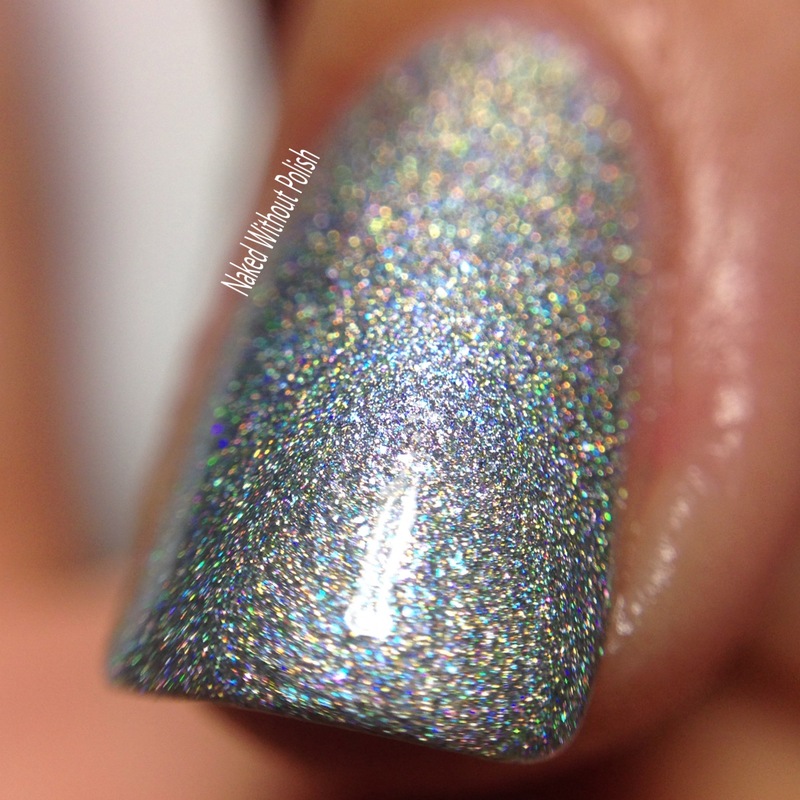 The blue is in your face and the flakies and holo just make it that much more memorable. I applied two coats, but I probably could have done a third to make it a bit more opaque. 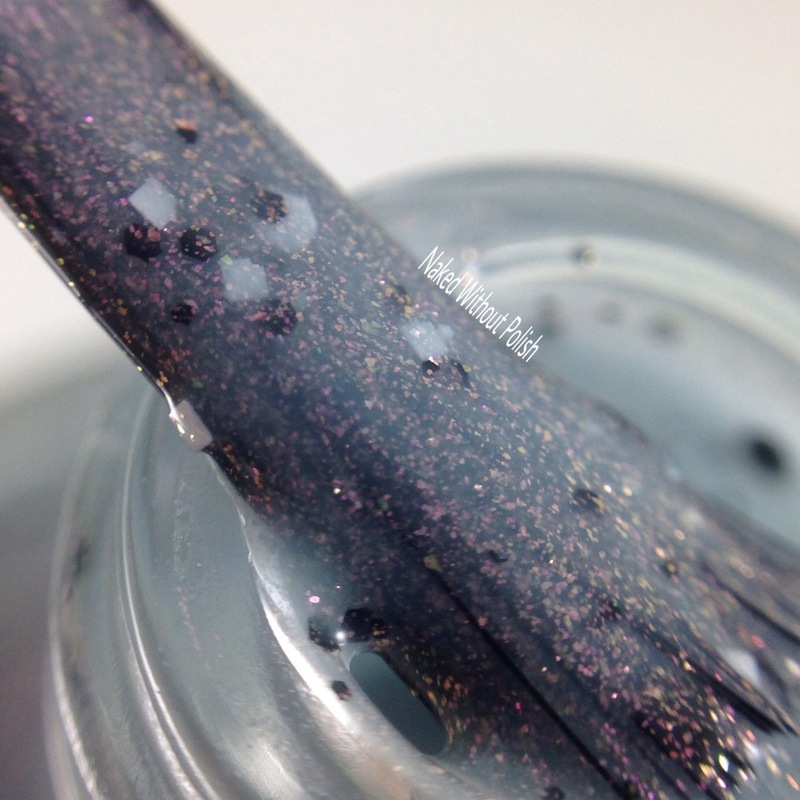 I just really liked how the flakes layered in there with two coats. 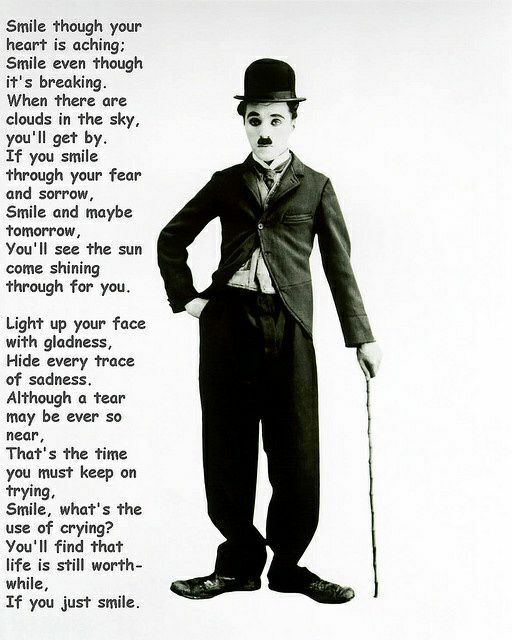 Smile is inspired by the song Smile by Charlie Chaplin. 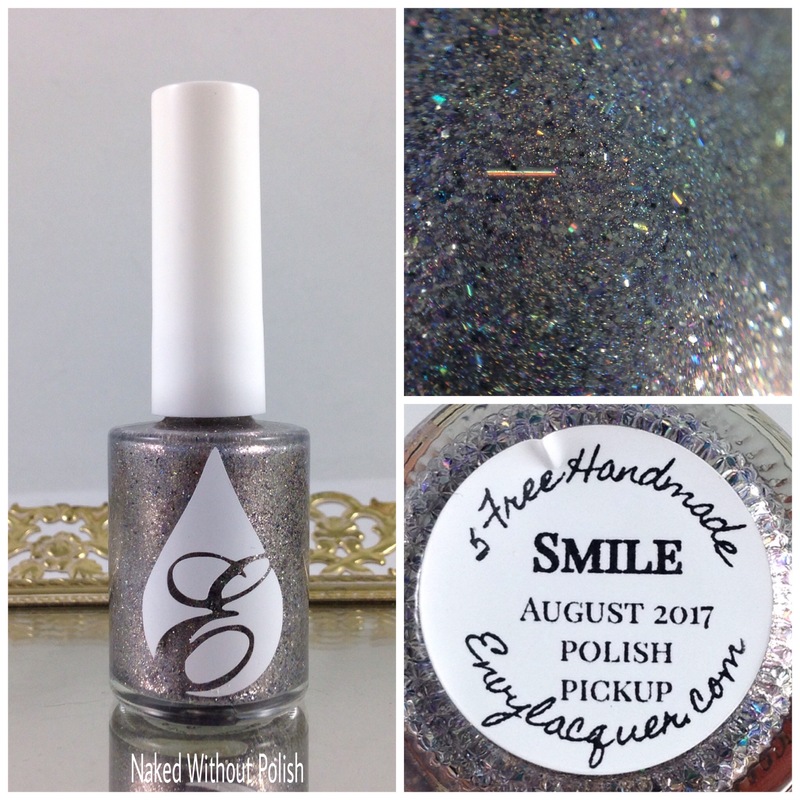 Smile is described as "a sparkly silver flakie polish, that leans taupe in dim lighting, with a mix of scattered and linear holo". Shown is two coats of Smile with top coat. Smile is the perfect polish to represent this actor. It looks simple at first glance, then you get a closer look and see how much is actually going on. Two easy coats is all you'll need. Be prepared to be humming this song for days! Don't Call Me Sugar is inspired by a dress from the movie, Gone With the Wind. 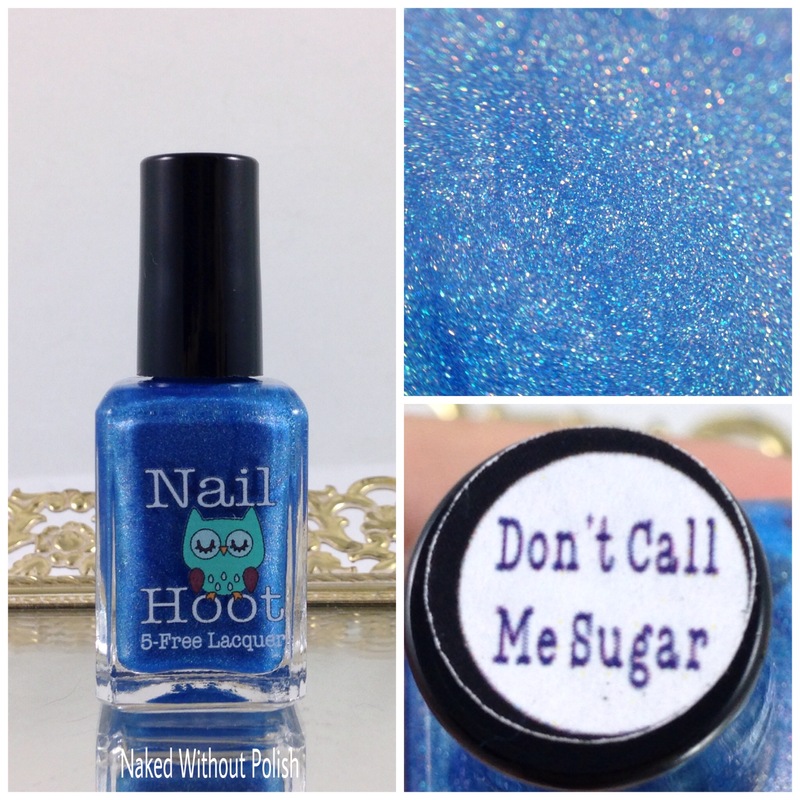 Don't Call Me Sugar is described as "a soft and beautiful cobalt blue holo with a slight pink flash". 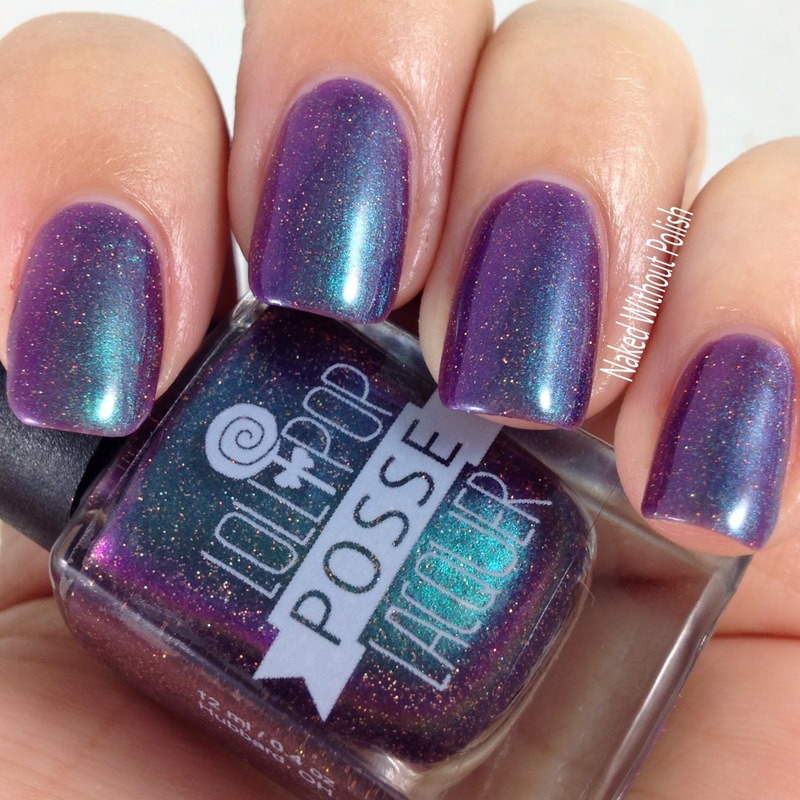 Shown is two coats of Don't Call Me Sugar with top coat. 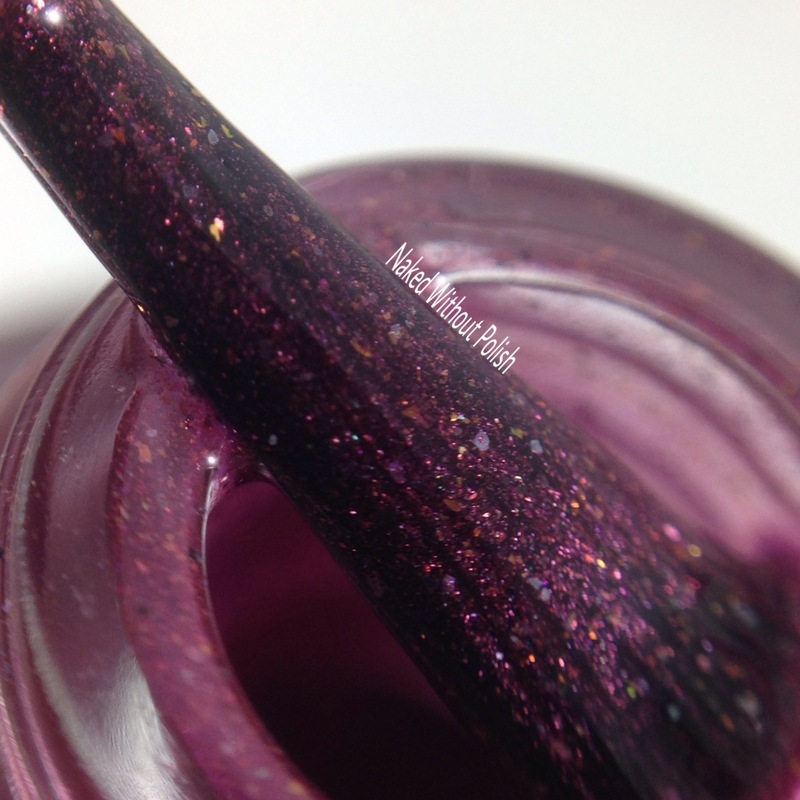 Don't Call Me Sugar had an impressively smooth formula and application. I thought it was going to be a one coater, but a second coat was required. 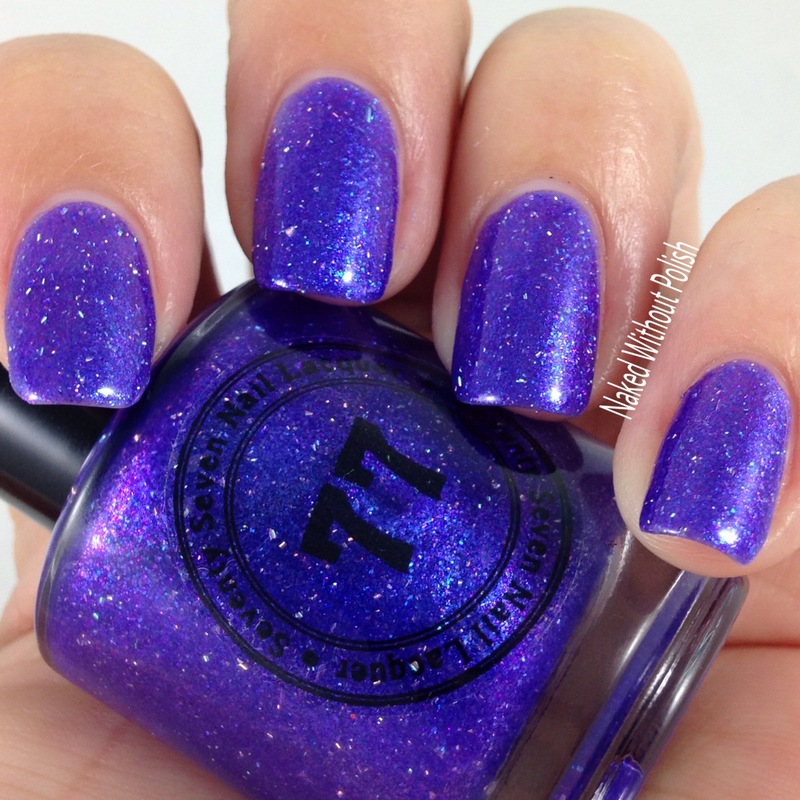 My goodness is this a gorgeous polish though! 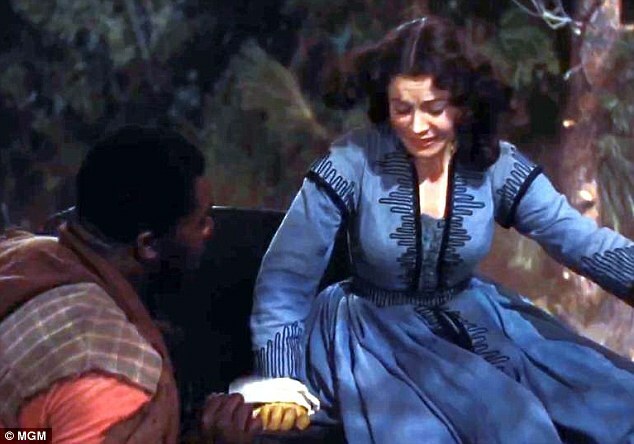 Frankly, My Dear is inspired by the movie, Gone With the Wind. 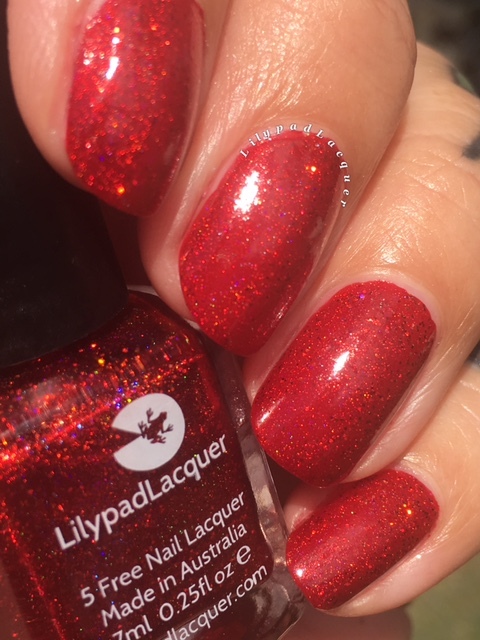 Frankly, My Dear is described as "a black based polish packed with red/orange/gold UCC flakies, iridescent chameleon glitters, silver holo micro glitters, and a red flash". 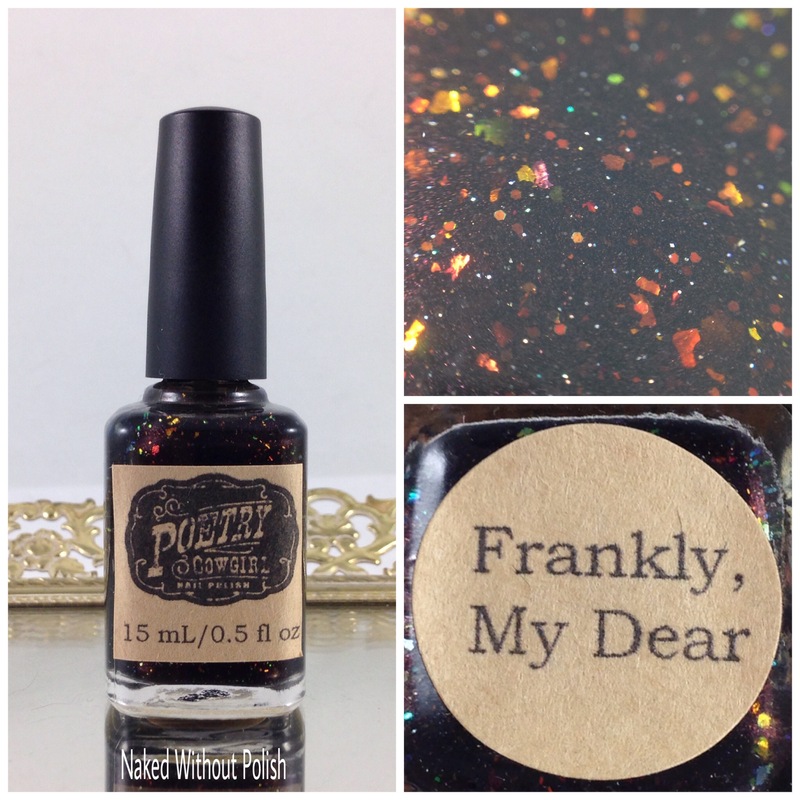 Shown is two coats of Frankly, My Dear with top coat. 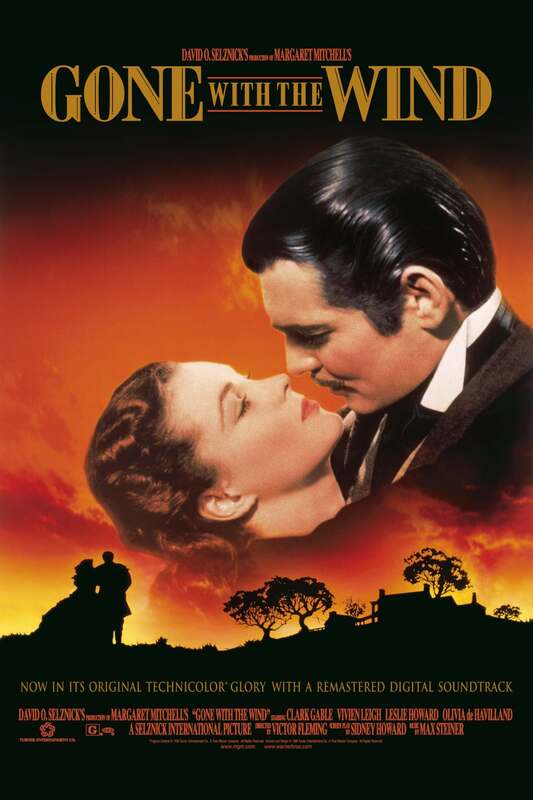 Frankly, My Dear completely stole my heart! 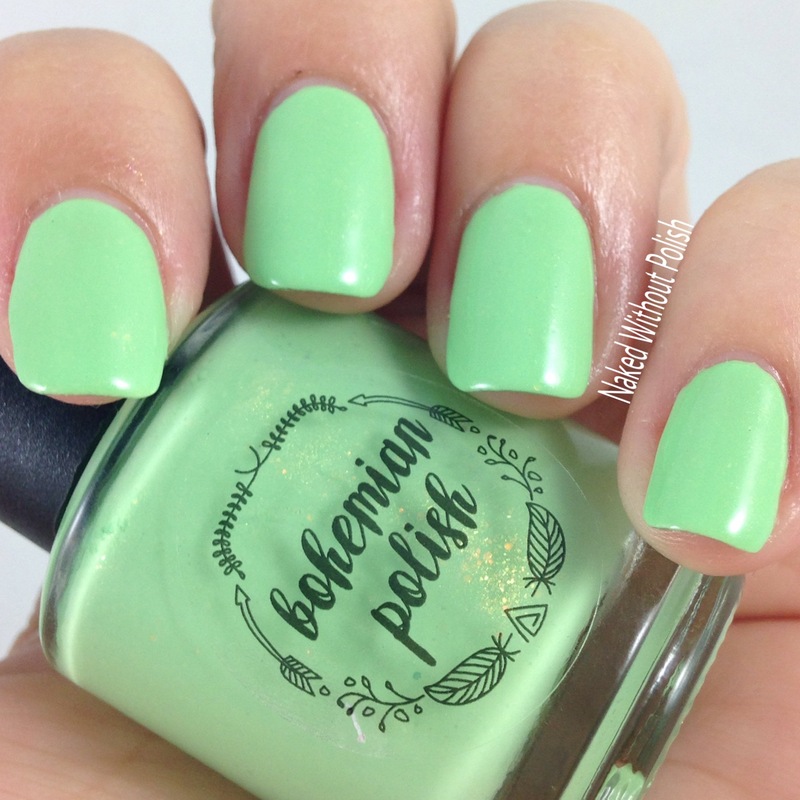 This is polish is one of a kind. It is thicker than most polish, but applied like a dream. 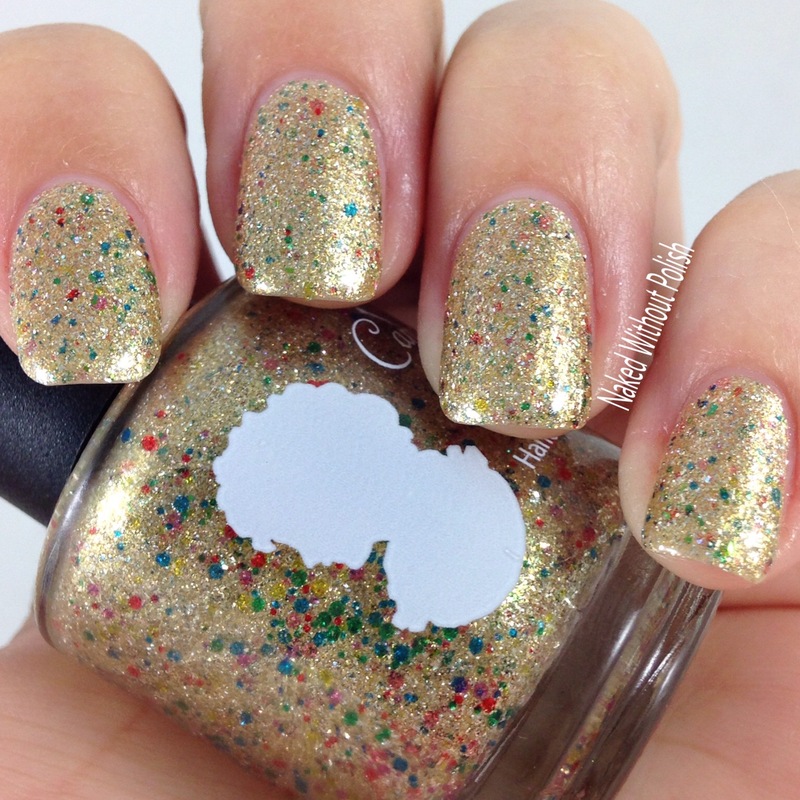 Almost a one coater, but you'll want that second coat so you can get some depth and layers with the flakes and glitter. You've been warned...you're going to fall in love! 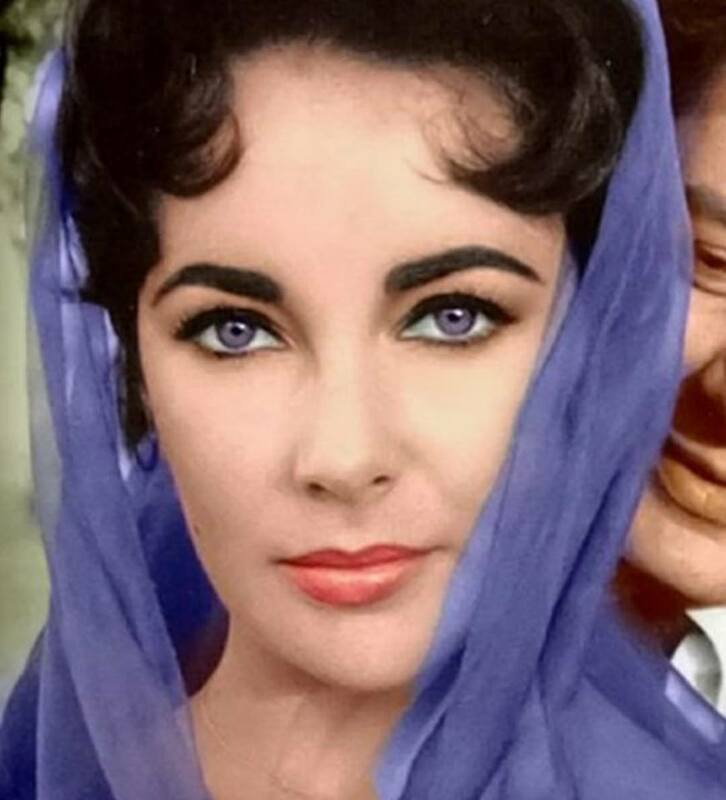 Taylor is inspired by the actress, Elizabeth Taylor. 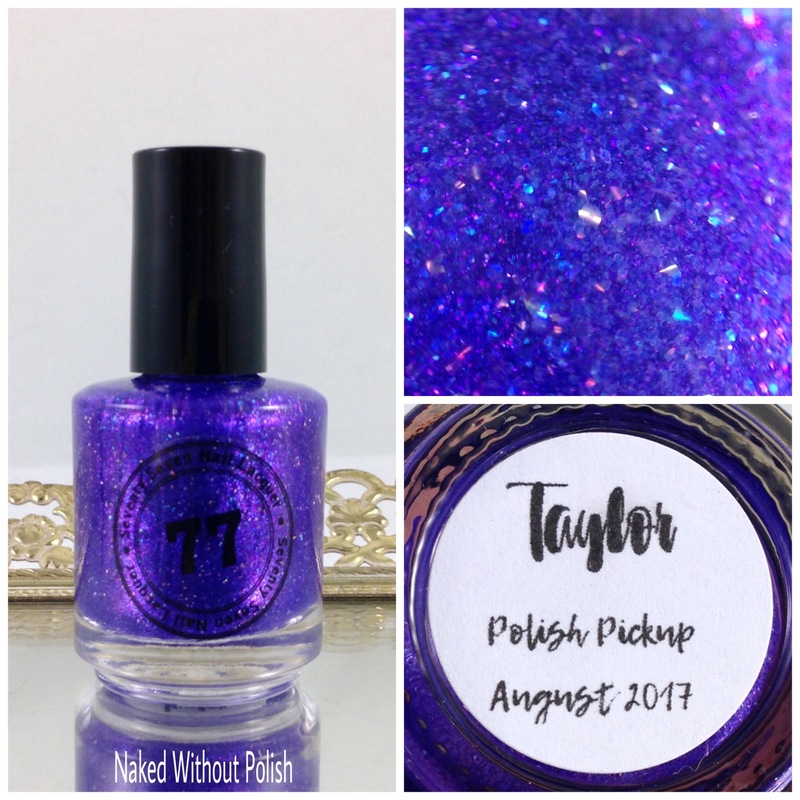 Taylor is described as "a violet base with purple/blue micro flakes, purple and lavender sparks, and silver holo flakes". Shown is three coats of Taylor with top coat. 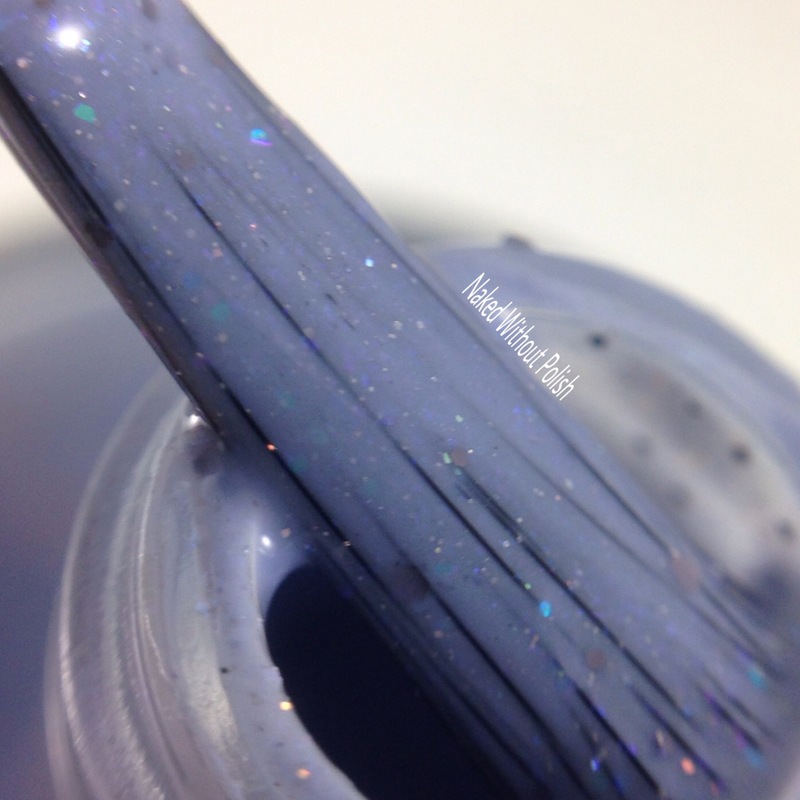 Taylor is a gorgeous squishy jelly that took three coats to reach full opacity. But once you see the dimension you get with all the flakes and shimmer you won't complain one bit! Fear is Stupid, So are Regrets! Fear is Stupid, So are Regrets! is inspired by a quote by Marilyn Monroe. Fear is Stupid, So are Regrets! 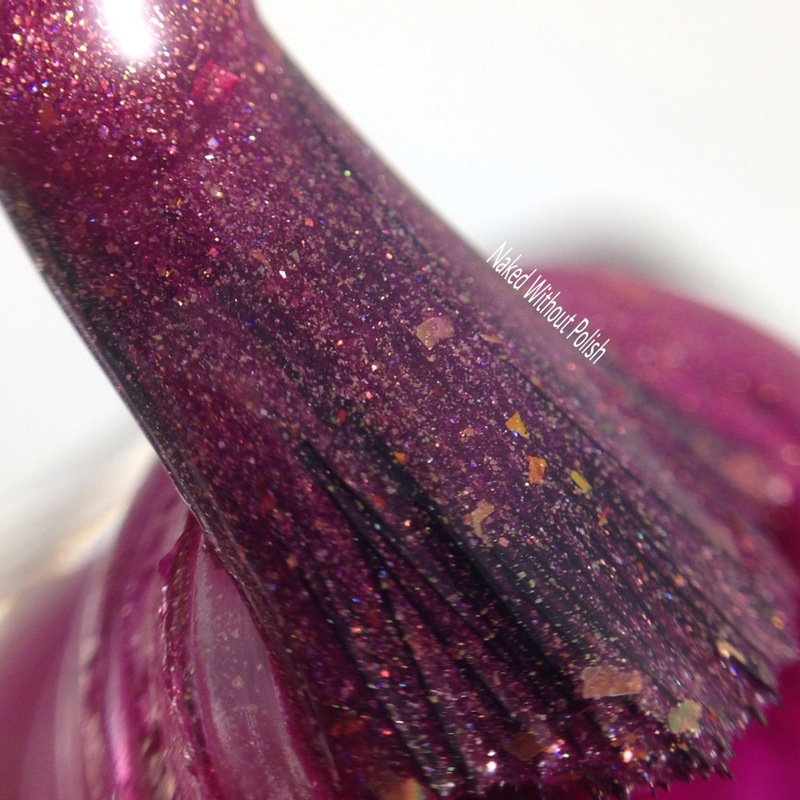 is described as "a fuchsia pink crelly with gold shimmer, splash of holo, gold galaxy holo glitters, UCC flakies, and gold holo flakes and shreds". 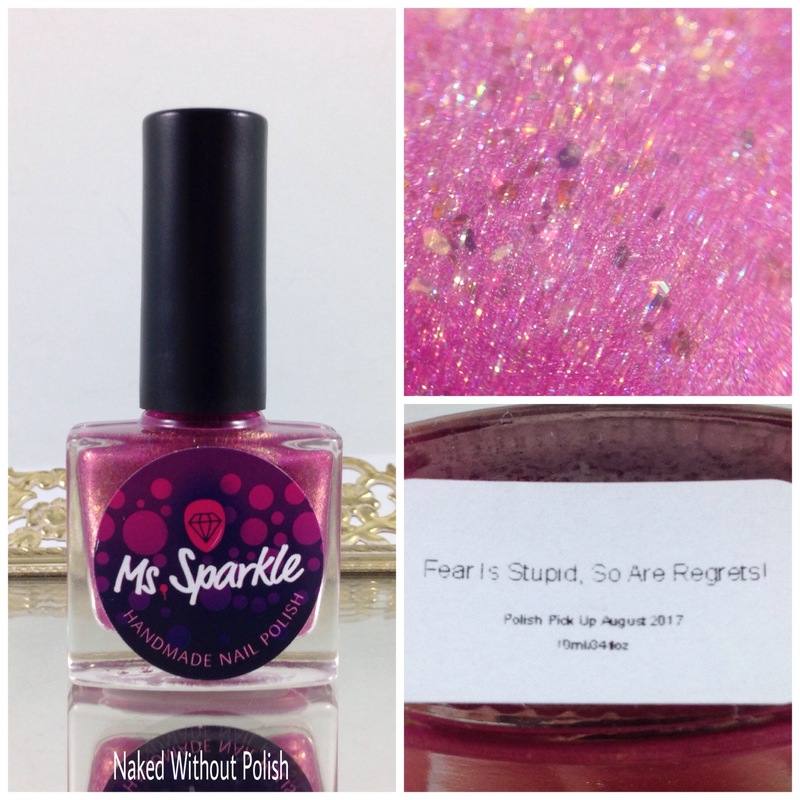 Shown is two coats of Fear is Stupid, So are Regrets! with top coat. Fear is Stupid, So are Regrets! is one gorgeous pink! So much depth and dimension in this one. Easy to work with formula, smooth application, and only two coats for a fully opaque manicure. 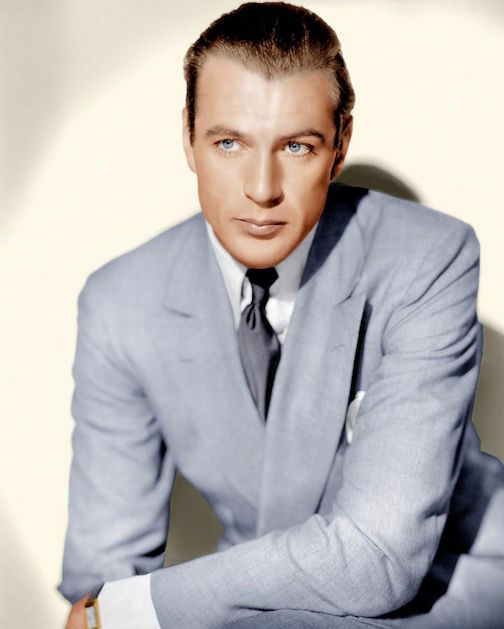 Mr. Average Joe American is inspired by the actor, Gary Cooper. 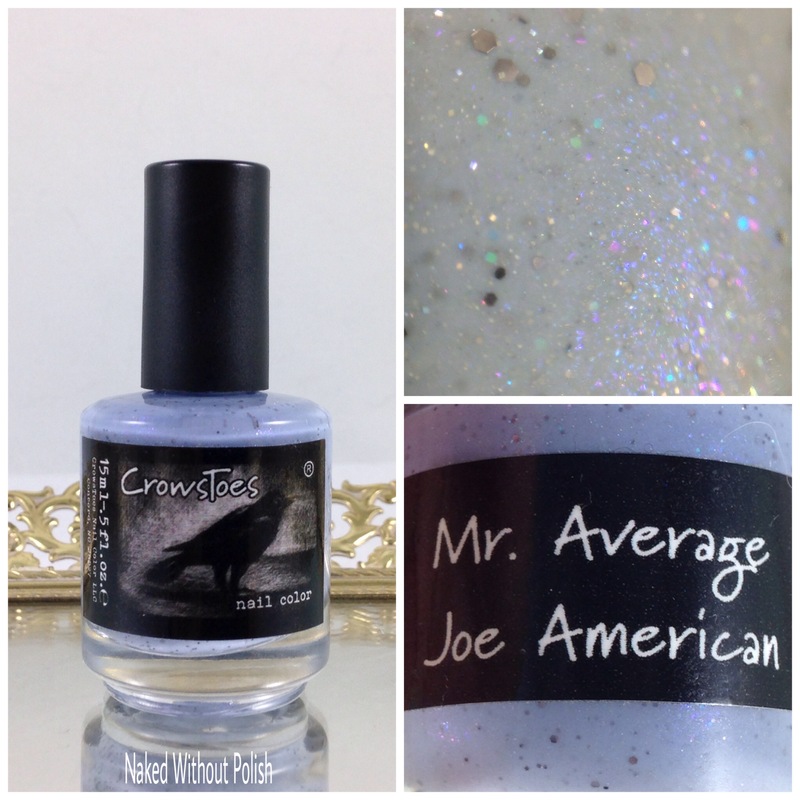 Mr. Average Joe American is described as "a medium blue leaning slate scattered with a mix of tiny gunmetal, iridescent blue glitters, and a dusting of micro holo topped off with a tint of purple shimmer for good measure". Shown is two coats of Mr. Average Joe American with top coat. Mr. Average Joe American is such a lovely shade of blue. 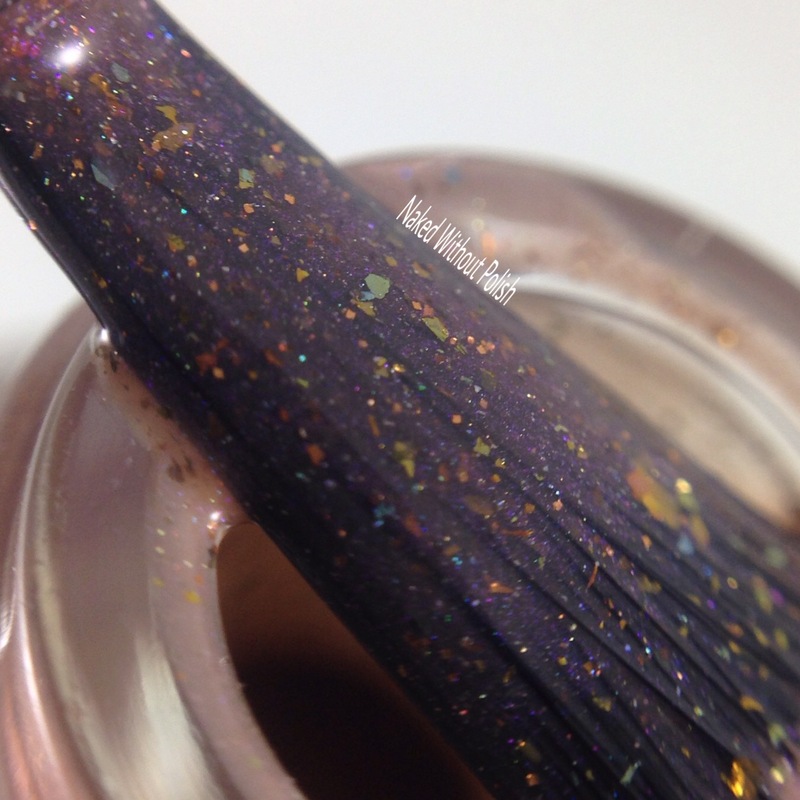 Only two coats for full opacity, and a shimmer that goes on for days. 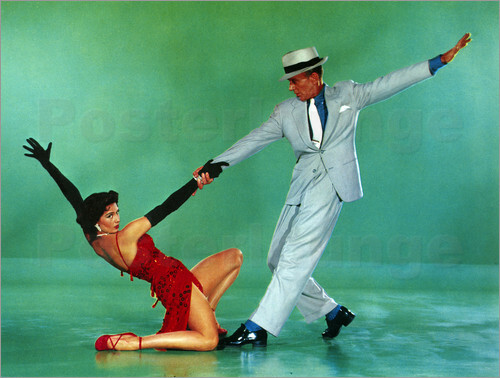 Singin' in the Rain is inspired by the movie, Singin' in the Rain. 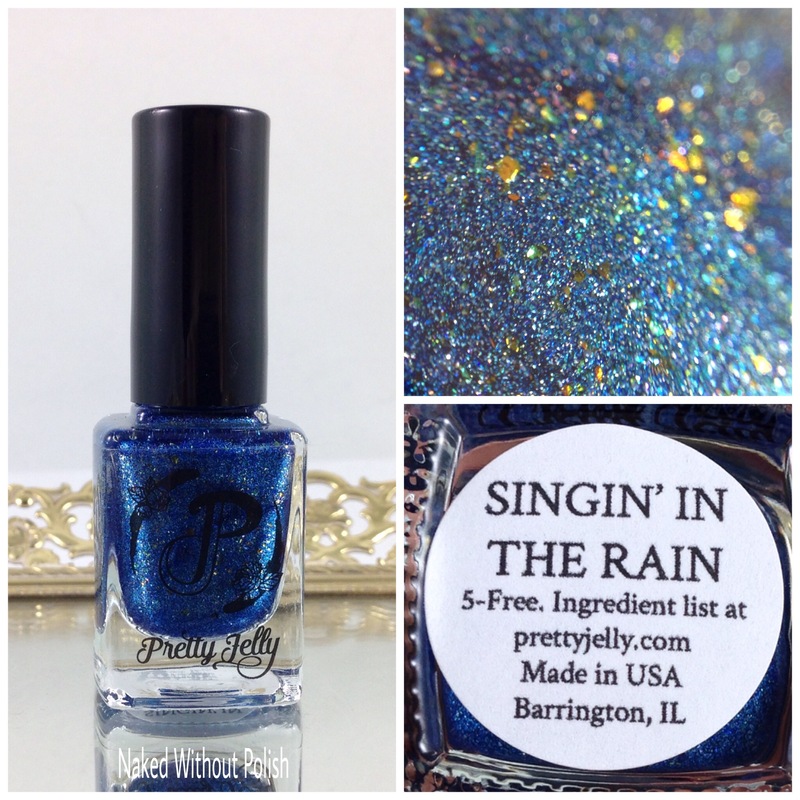 Singin' in the Rain is described as "a shimmery, scattered holo blue with gold to green color shifting flakes". 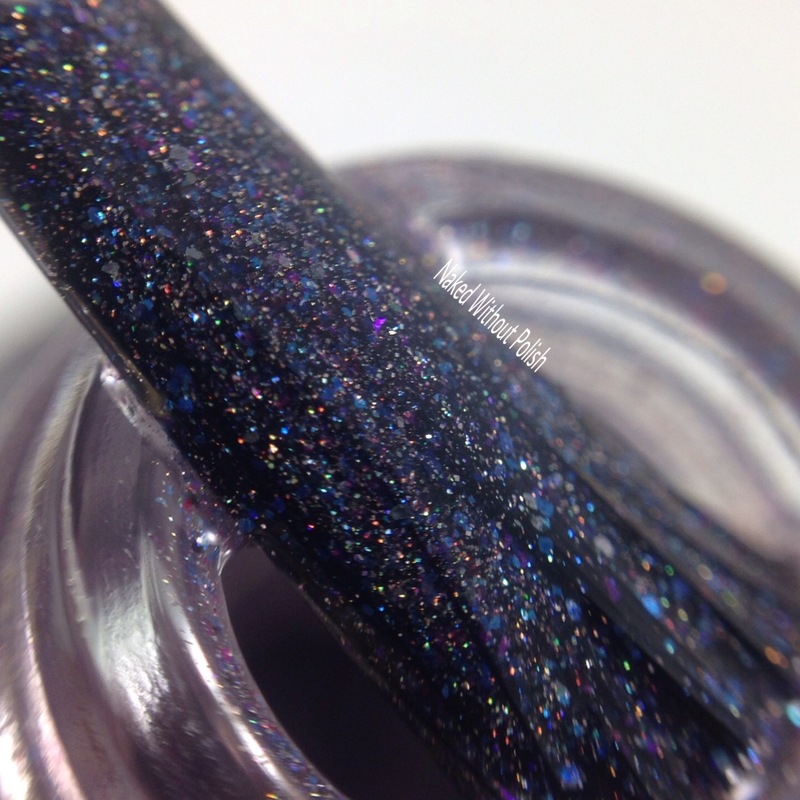 Shown is two coats of Singin' in the Rain with top coat. 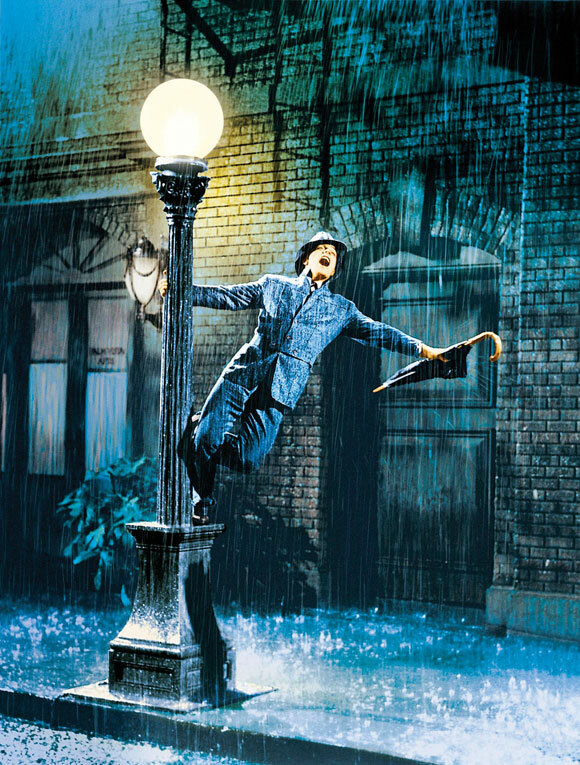 Singin' in the Rain is so unique and enchanting. You'll never be able to get this one out of your head. It applied like a dream despite it being packed with glitter and flakes. 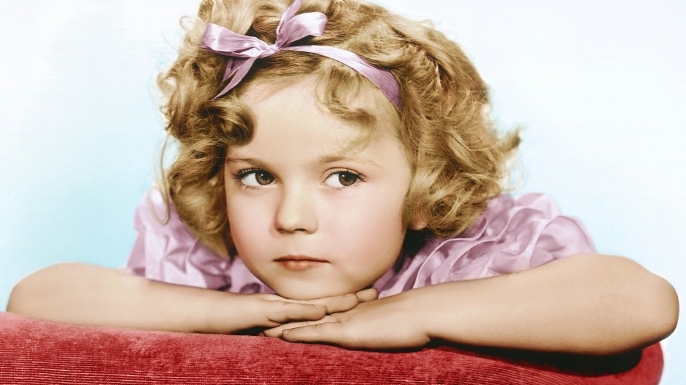 Shirley Temple is inspired by the actress, Shirley Temple. 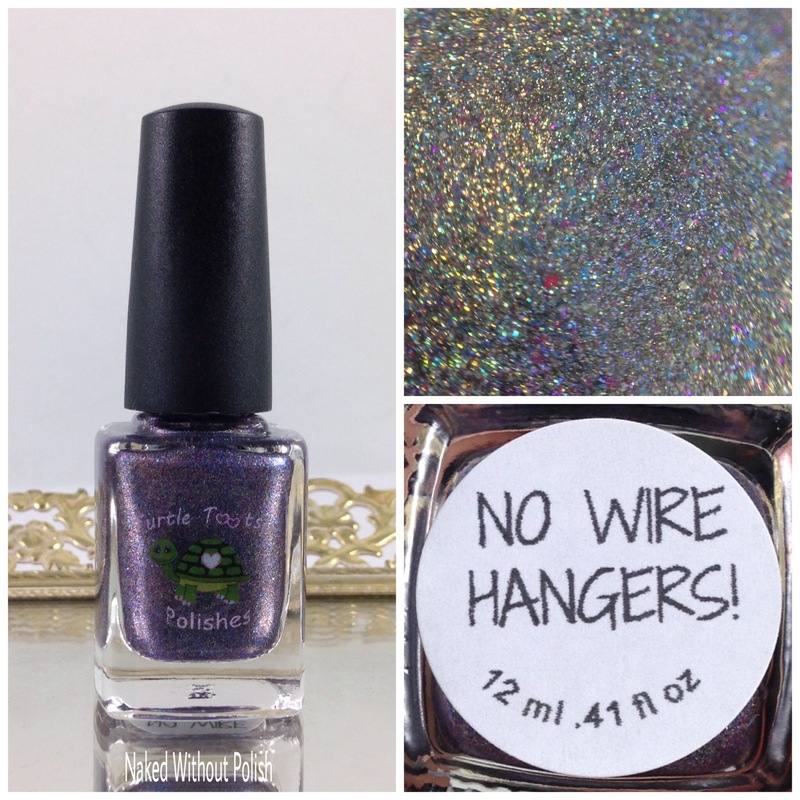 Shirley Temple is described as "a silver linear holo polish with a strong purple shift, and loaded with color shifting flakies that change from purple to blue to teal to green". 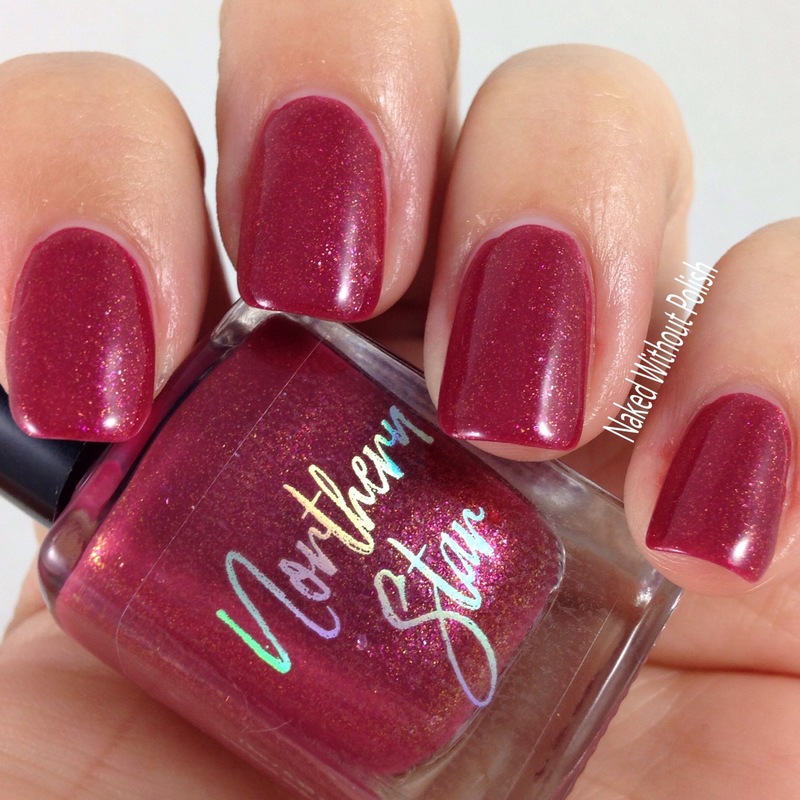 Shown is two coats of Shirley Temple with top coat. Shirley Temple is so sweet that you're sure to get a toothache. 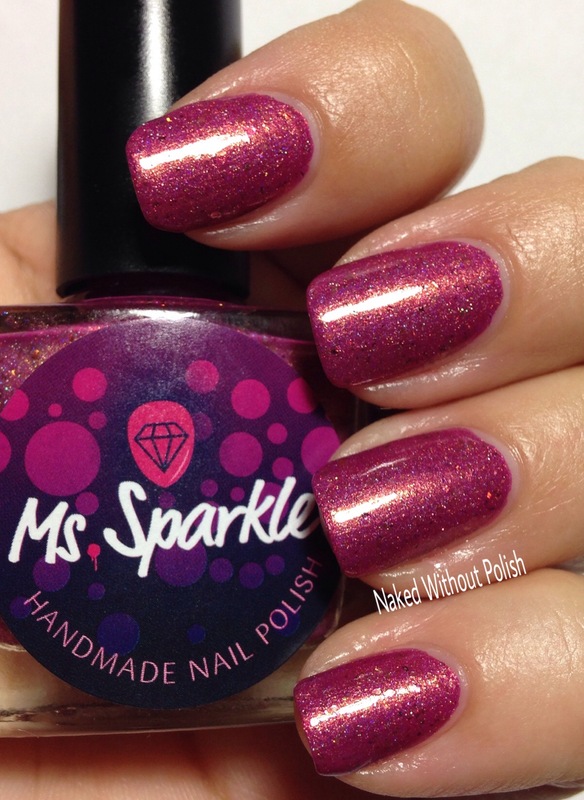 This perky polish will keep you grinning from ear to ear with it's perfect formula and application. 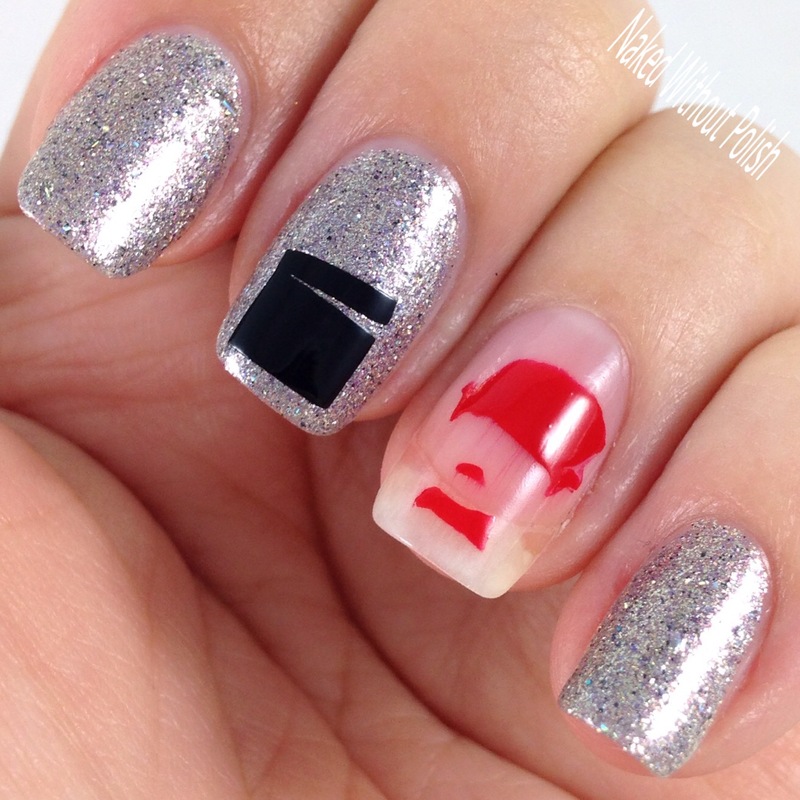 The way it dances across your nails will keep you coming back for more. 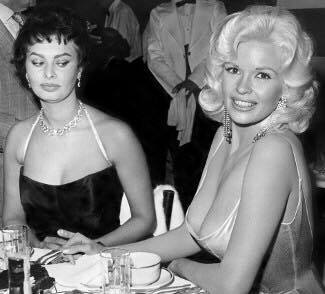 Sophia, Queen of the Side Eye is inspired by the actress, Sophia Loren. 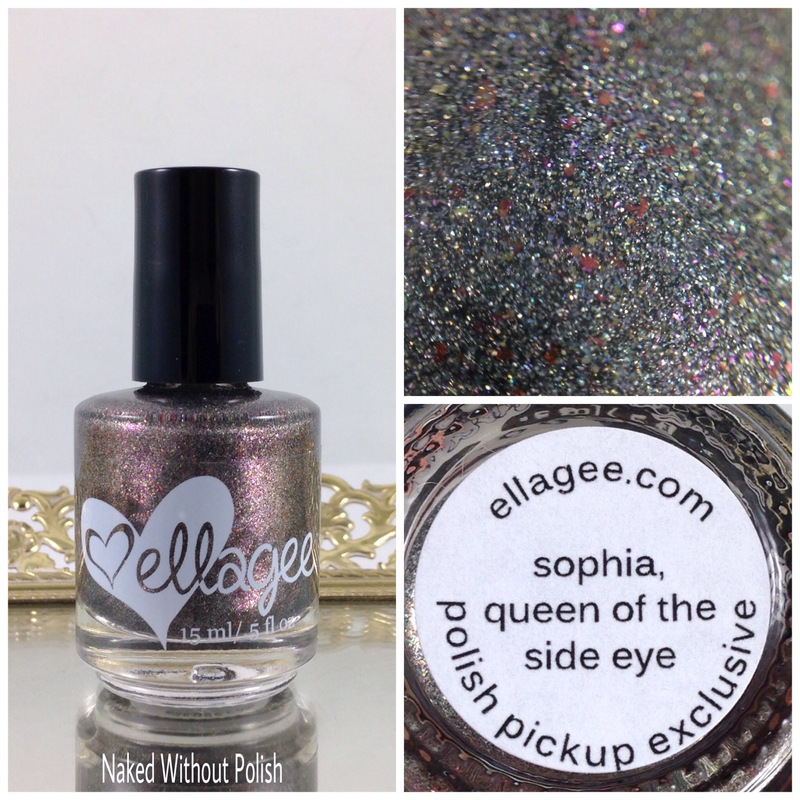 Sophia, Queen of the Side Eye is described as "a silvery, charcoal scattered holo with soft pink flash, copper mini flakes, and green shimmer". Shown is two coats of Sophia, Queen of the Side Eye with top coat. Sophia, Queen of the Side Eye is that dark beauty you won't be able to get out of your head. She makes one hell of an impression with her full and creamy formula and impressive application. 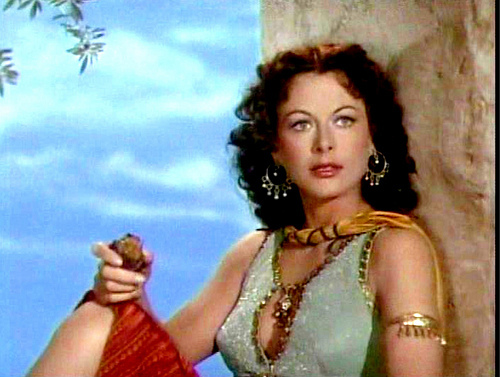 Goddess of Desire is inspired by the character Lili Von Shtüpp from the movie, Blazing Saddles. 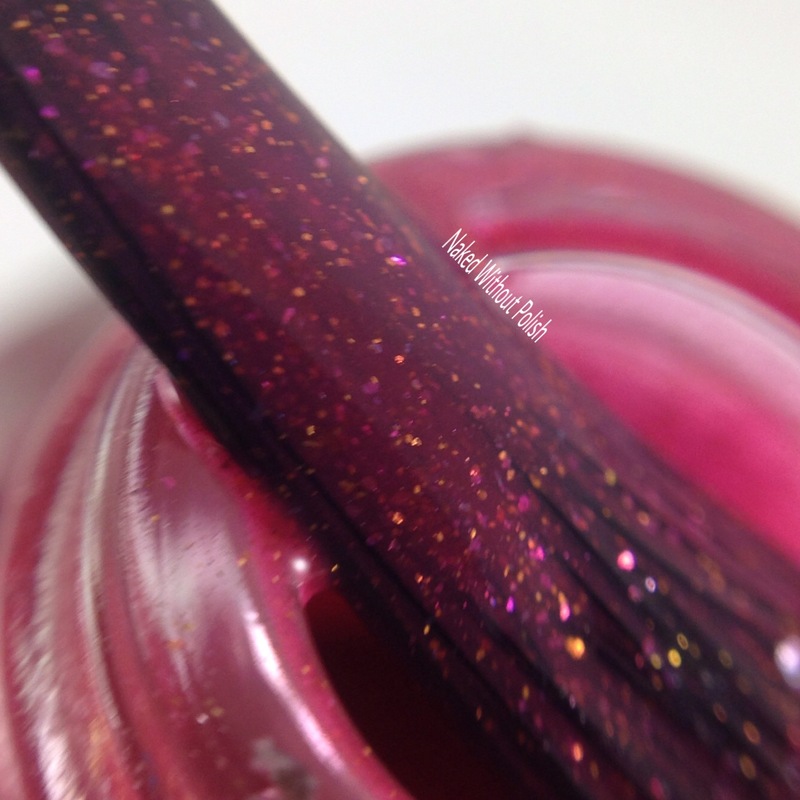 Goddess of Desire is described as "a deep raspberry jelly with scattered holo pigment, holo flakes, and light gold shimmer". 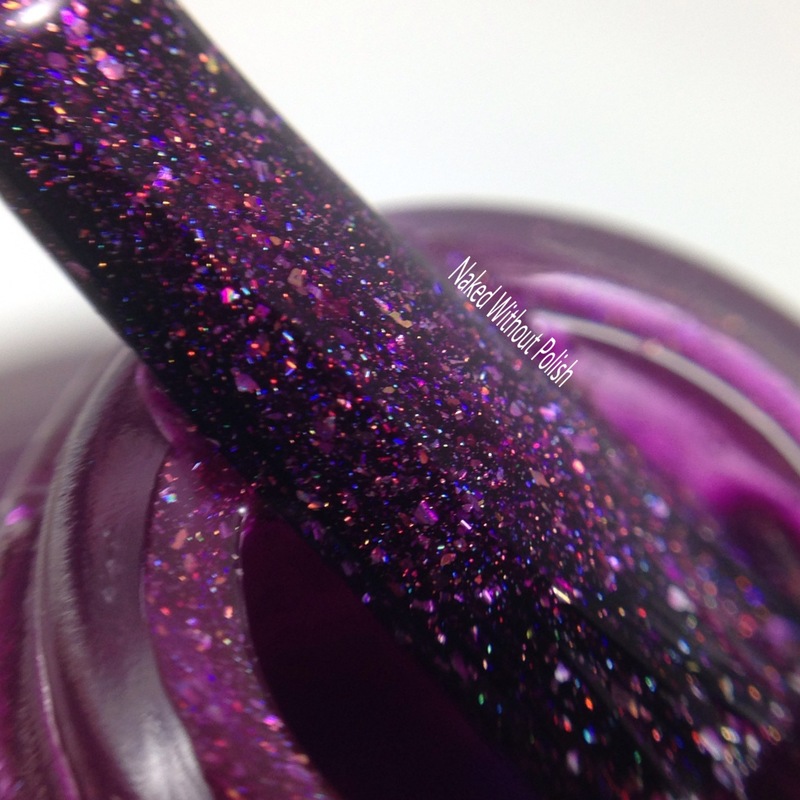 Shown is two coats of Goddess of Desire with top coat. Goddess of Desire is rich and mesmerizing. You won't be able to take your eyes off of it. Two incredibly perfect coats is all you'll need. 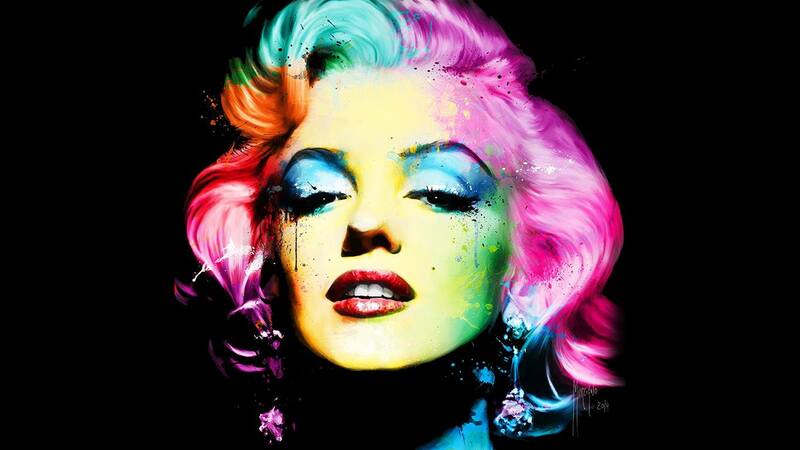 Marilyn - The Legend is inspired by the actress, Marilyn Monroe. 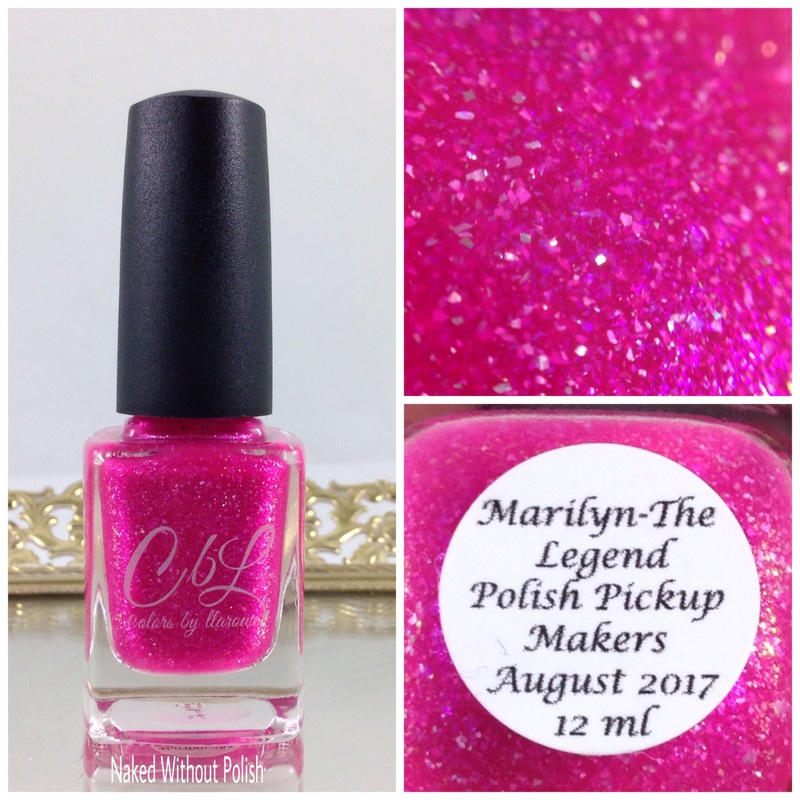 Marilyn - The Legend is described as "a bright hot pink jelly with base with blue to violet shifting shimmer and prismatic holo flake". 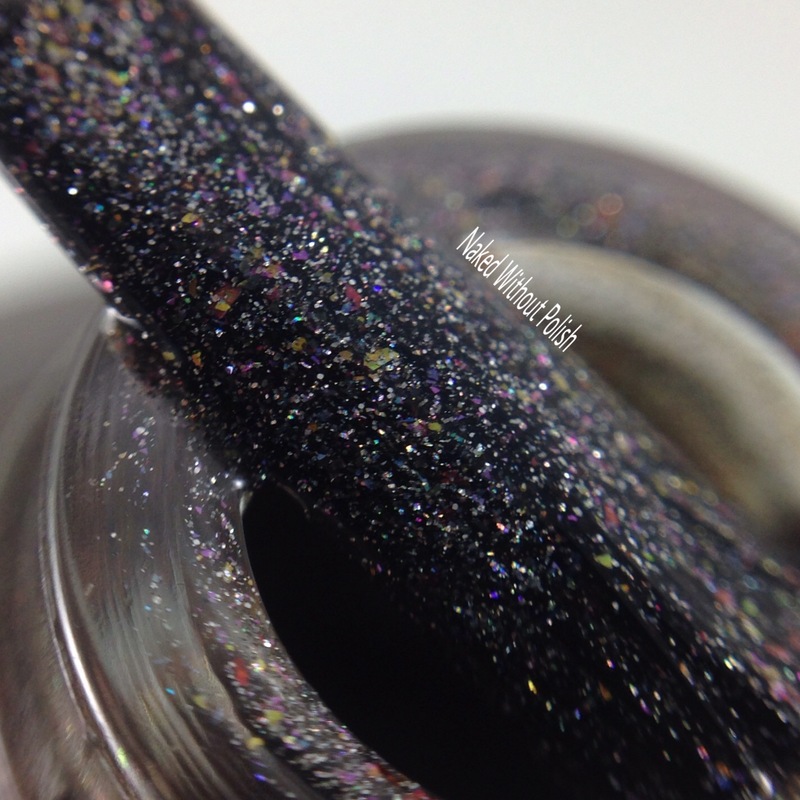 Shown is three coats of Marilyn - The Legend with top coat. Marilyn - The Legend is squishy jelly goodness in pink form! 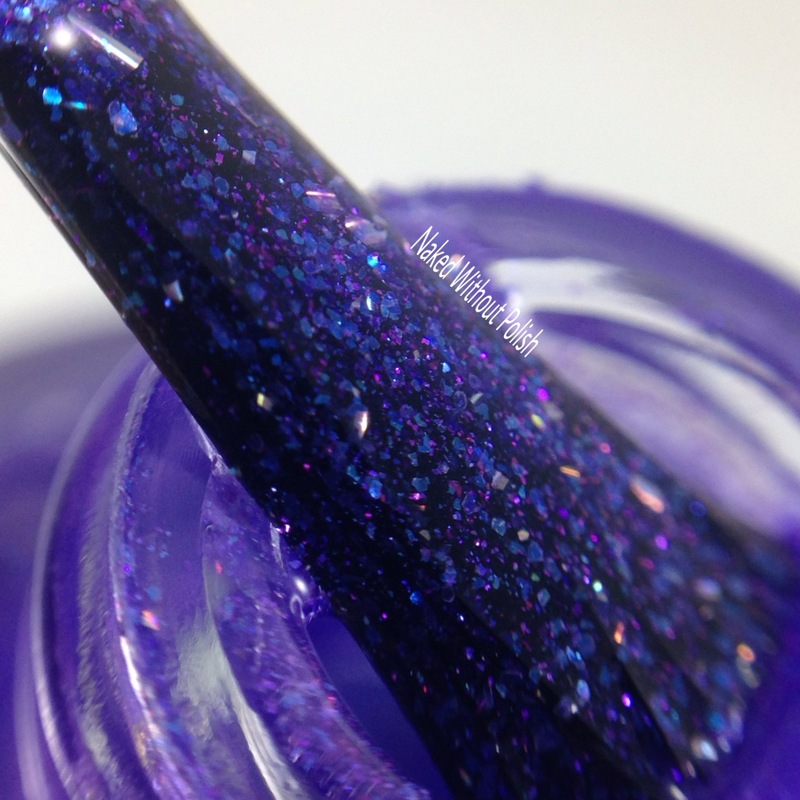 Three simple coats for a fully opaque nail, and you'll never want to take this one off! Hop on the Bandwagon is inspired by the movie, The Band Wagon. 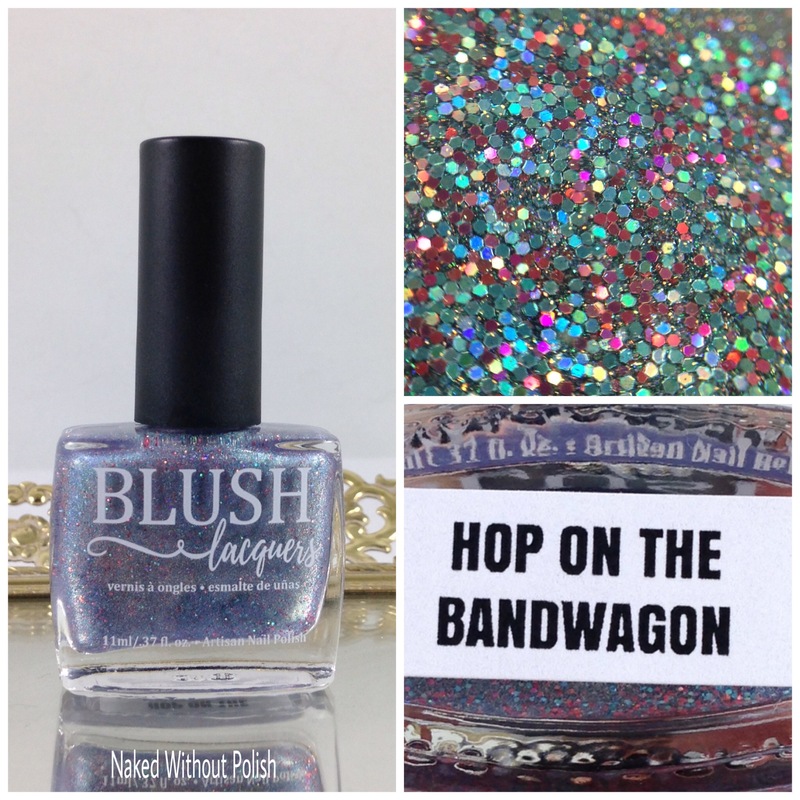 Hop on the Bandwagon is described as "a light silvery blue holo with a golden green shimmer, and holo glitters in red and blue". Shown is three coats of Hop on the Bandwagon with top coat. Hop on the Bandwagon is so much fun! It's a soft delicate color, but still seems to have a party going on. 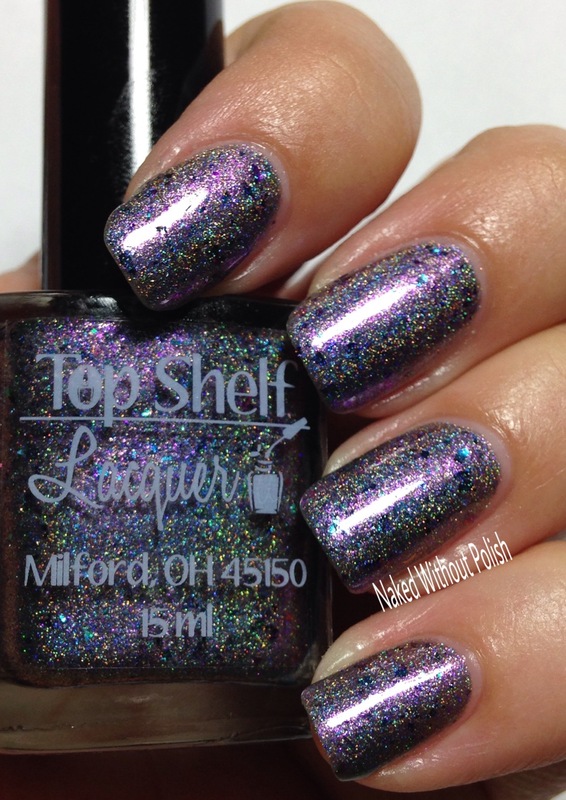 It is a little sheer, so three coats were necessary for full opacity. You could probably even use it as a topper over a nice cream. 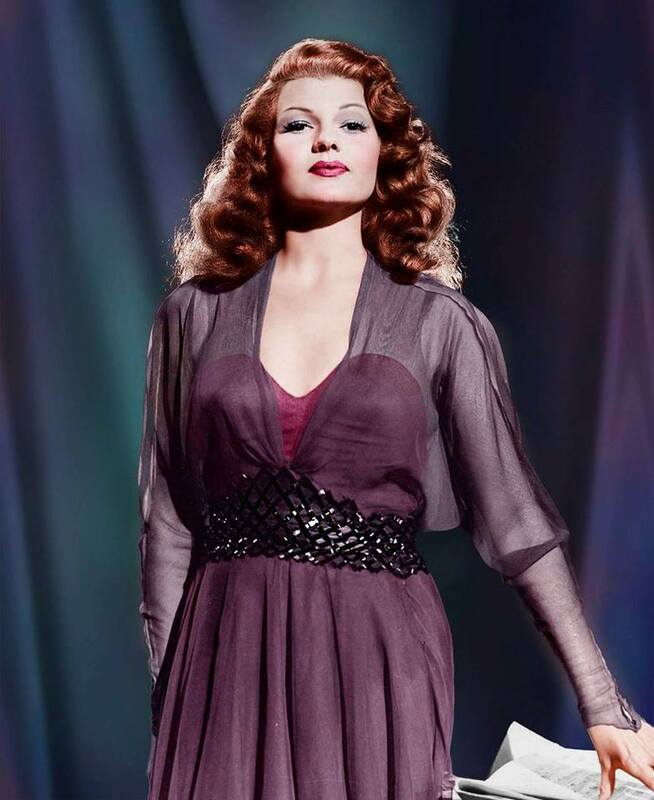 Love Goddess is inspired by the actress, Rita Hayworth. 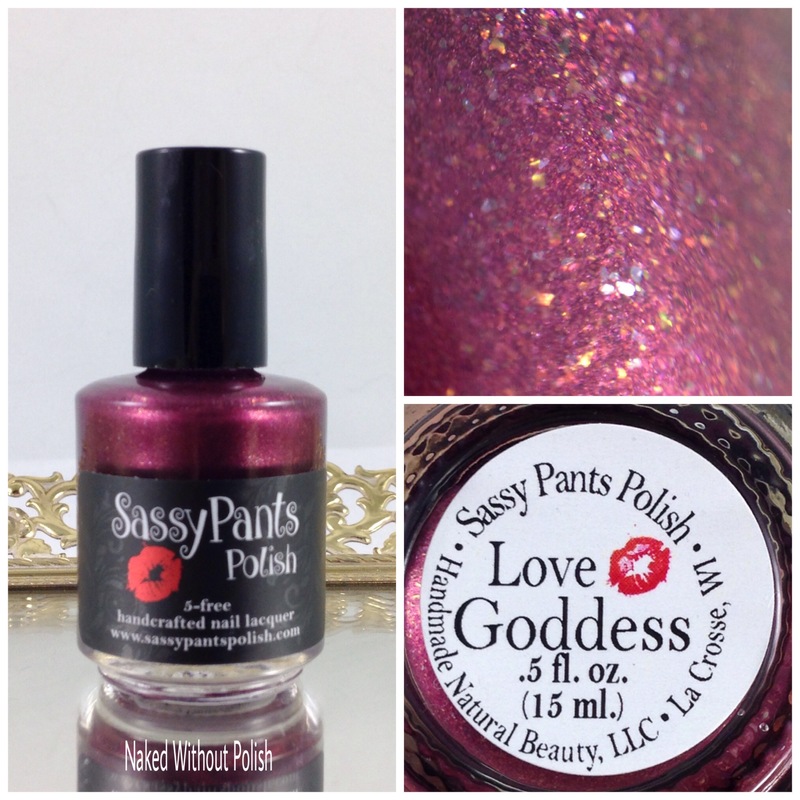 Love Goddess is described as "a sultry burgundy polish with assorted flakies and a strong copper shimmer". 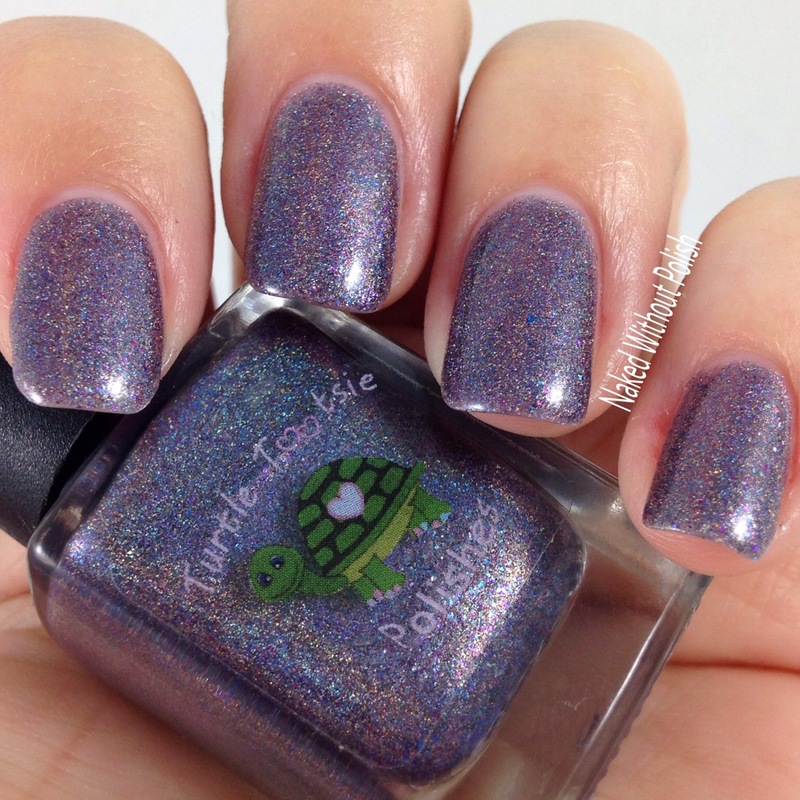 Shown is two coats of Love Goddess with top coat. 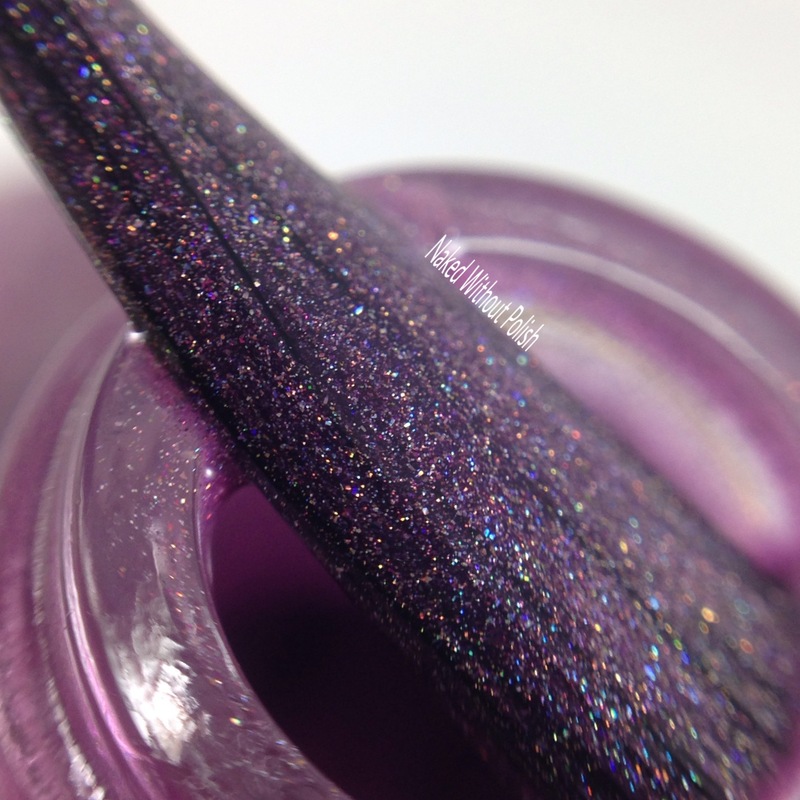 Love Goddess is going to be a go to polish for this fall! This color is so rich and cozy. 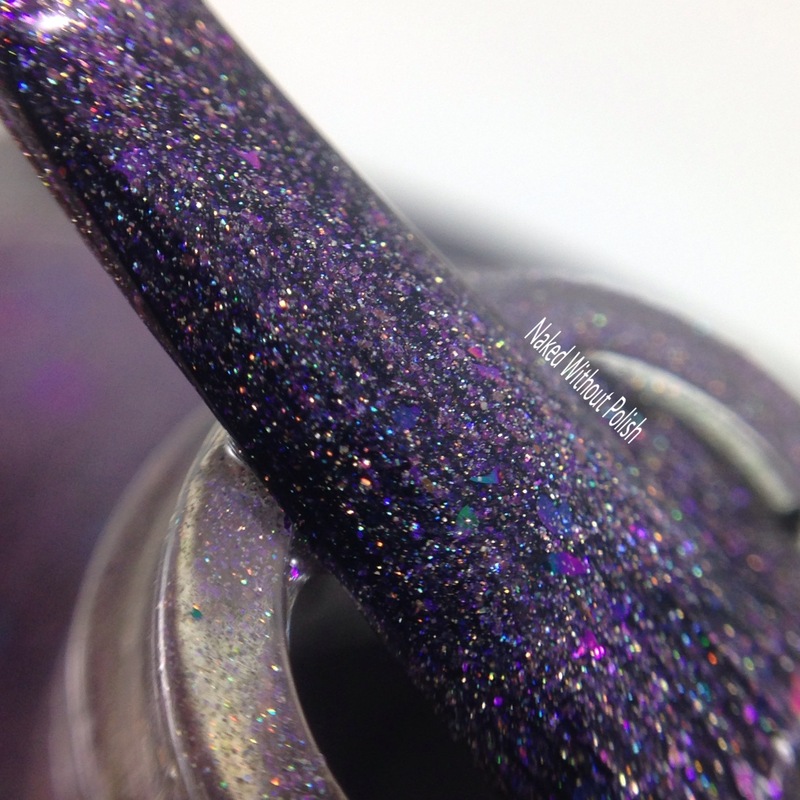 Beautiful application and formula, and only two coats for full opacity. 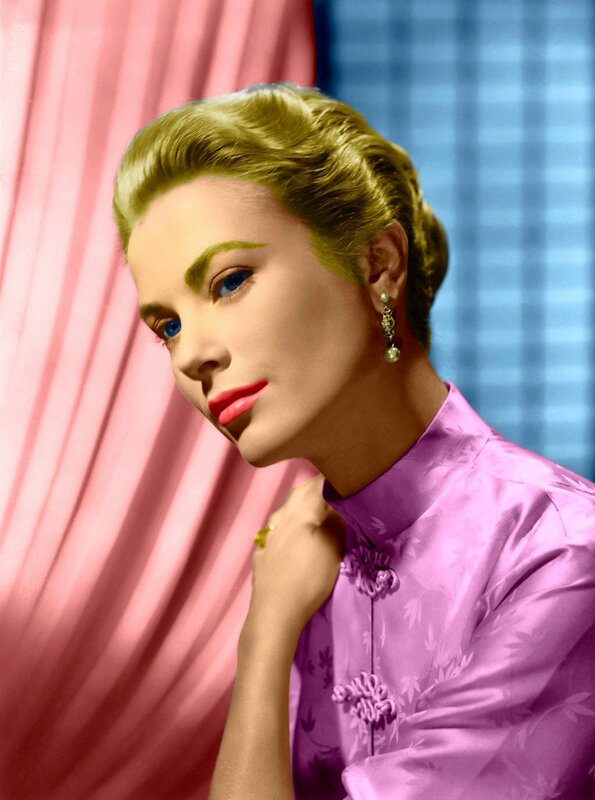 Hollywood Royalty is inspired by the actress, Grace Kelly. 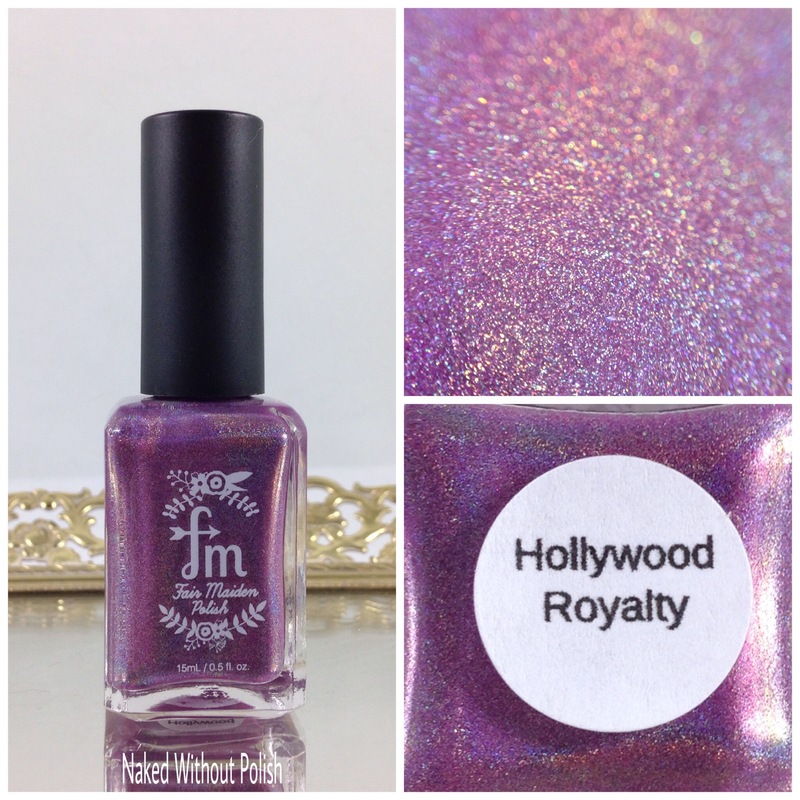 Hollywood Royalty is described as "a mauve linear holo with a magenta to gold multi chrome flame". 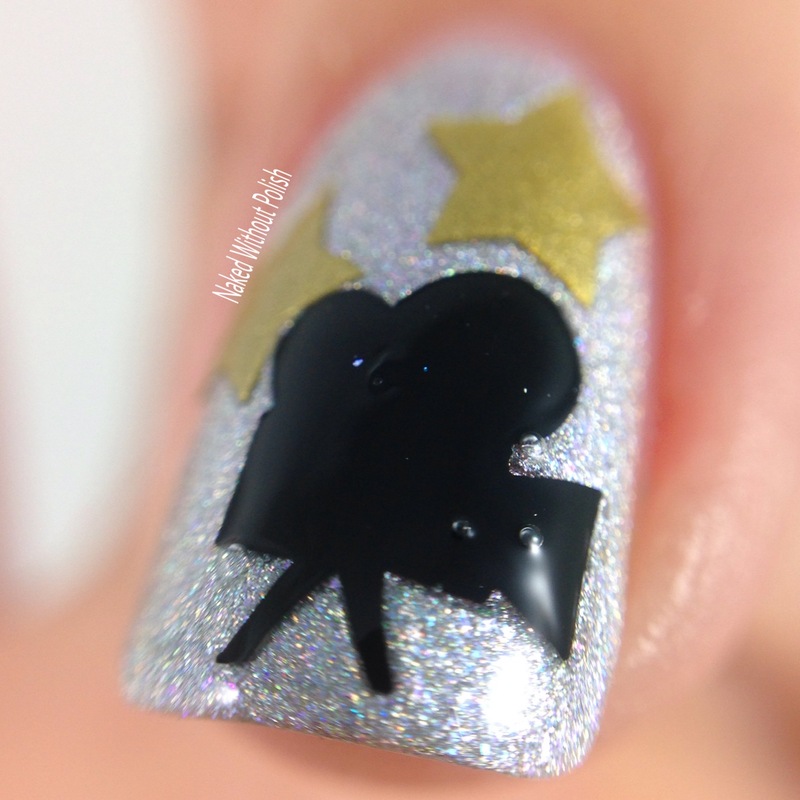 Shown is two coats of Hollywood Royalty with top coat. Hollywood Royalty is like the princess herself, incredibly memorable. The shade of this polish is like none other. You think it's pink one moment but it has purple tendencies as well. 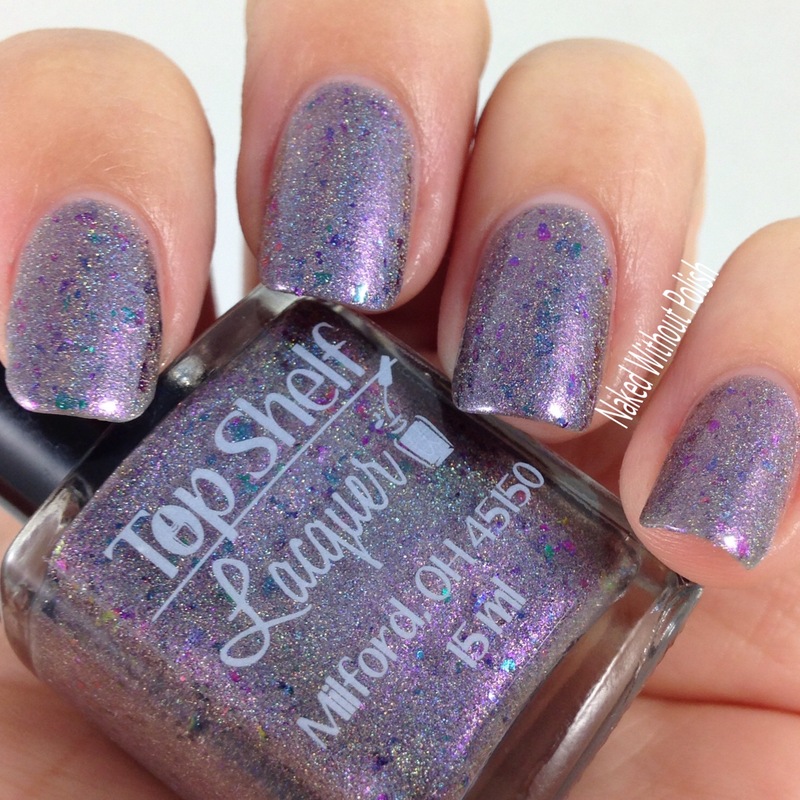 The holo and the shifty flame add so much pizzazz. 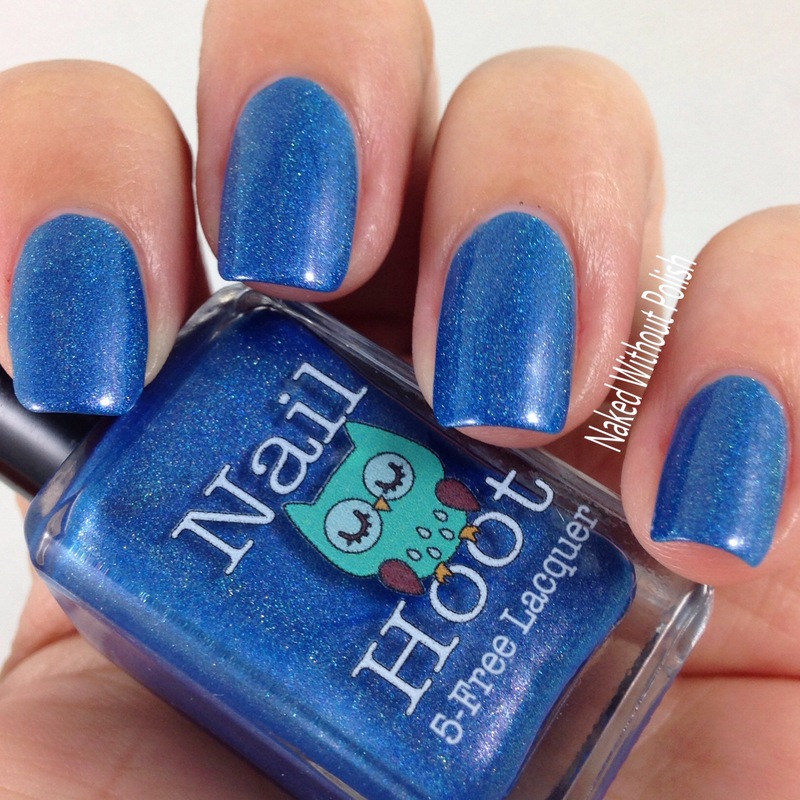 Beautiful formula and application that only requires two coats. 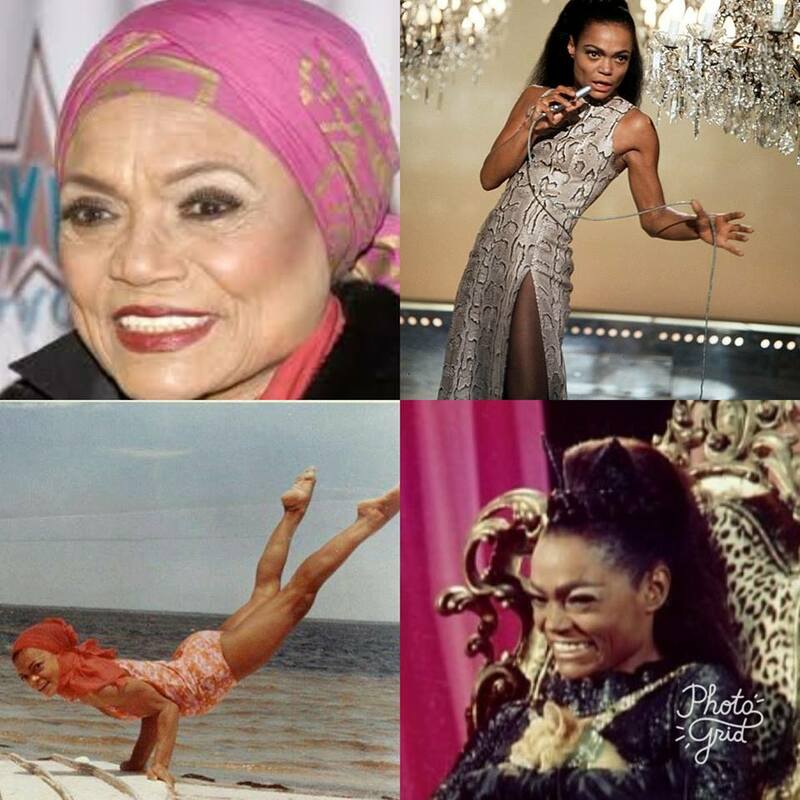 The KITT's Meow is inspired by the singer, Eartha Kitt. 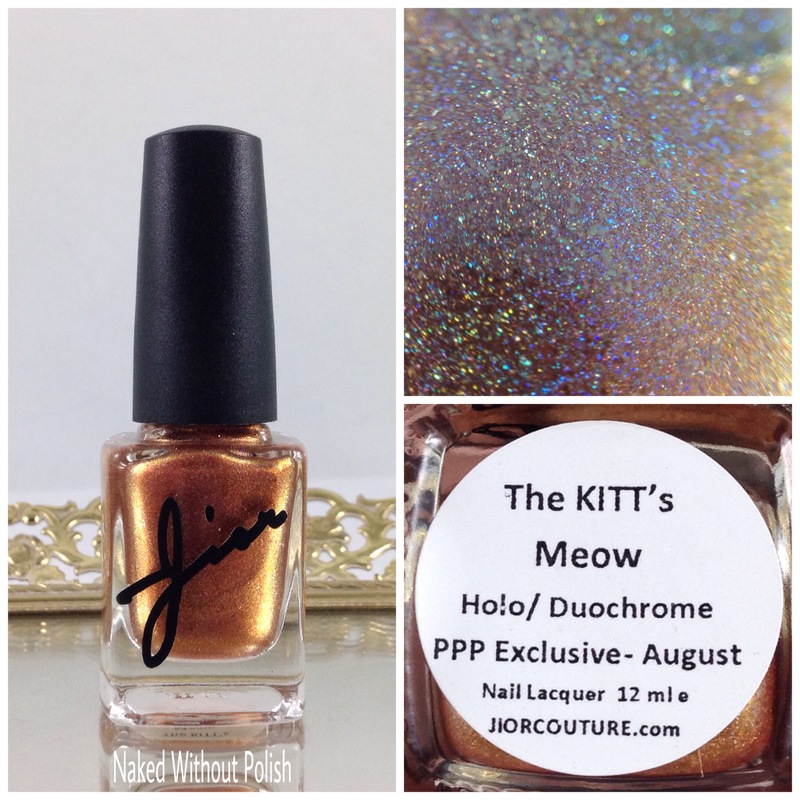 The KITT's Meow is described as "a duochrome holo with a copper to red gold shift with gold micro flakes". Shown is two coats of The KITT's Meow with top coat. The KITT's Meow is an elegant color that almost comes across antique looking. Gorgeous formula with a perfect application. 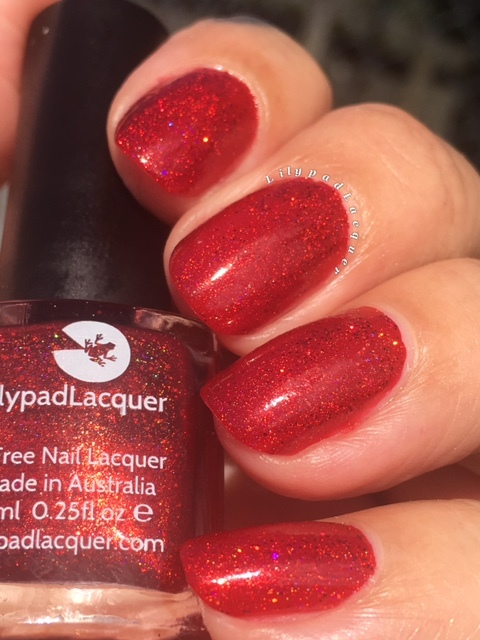 Only two coats of this absolutely stunning polish is sure to leave an impression. Hey There Delilah is inspired by the movie, Samson and Delilah. 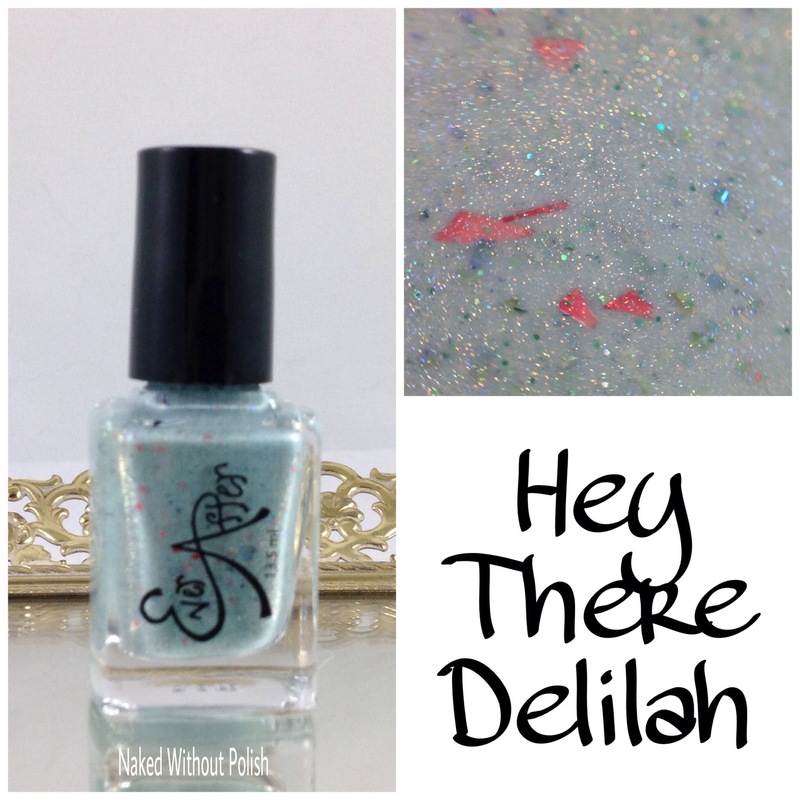 Hey There Delilah is described as "a sea foam crelly with green and blue UCC flakies, red flakes, gold sparkle, and scattered holo shimmer". Shown is two coats of Hey There Delilah with top coat. Hey There Delilah is one of those polishes you're never going to be able to get out of your head. The color is perfect, and the combination of things added to it is flawless! 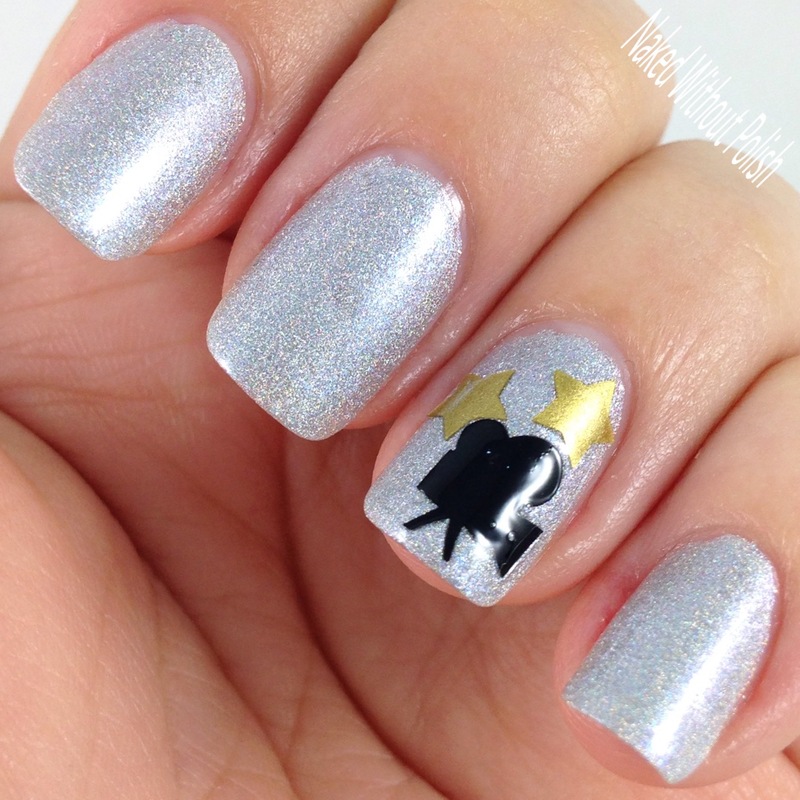 It has a buttery smooth application and you barely need two coats. Great pigmentation! Film Noir is inspired by old Hollywood thrillers and detective films of the film noir genre that were dark, moody, provocative, and seductive. 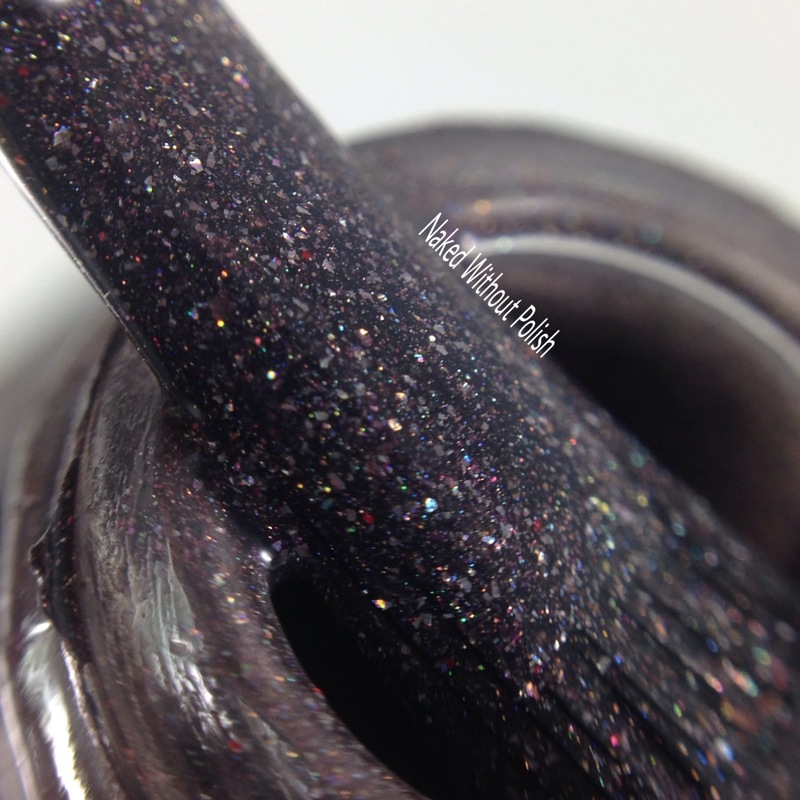 Film Noir is described as "a blackened purple multichrome base that shifts from green to purple and even a bit of gold at extreme angles, and holo copper micro glitter scattered throughout". Shown is two coats of Film Noir with top coat. 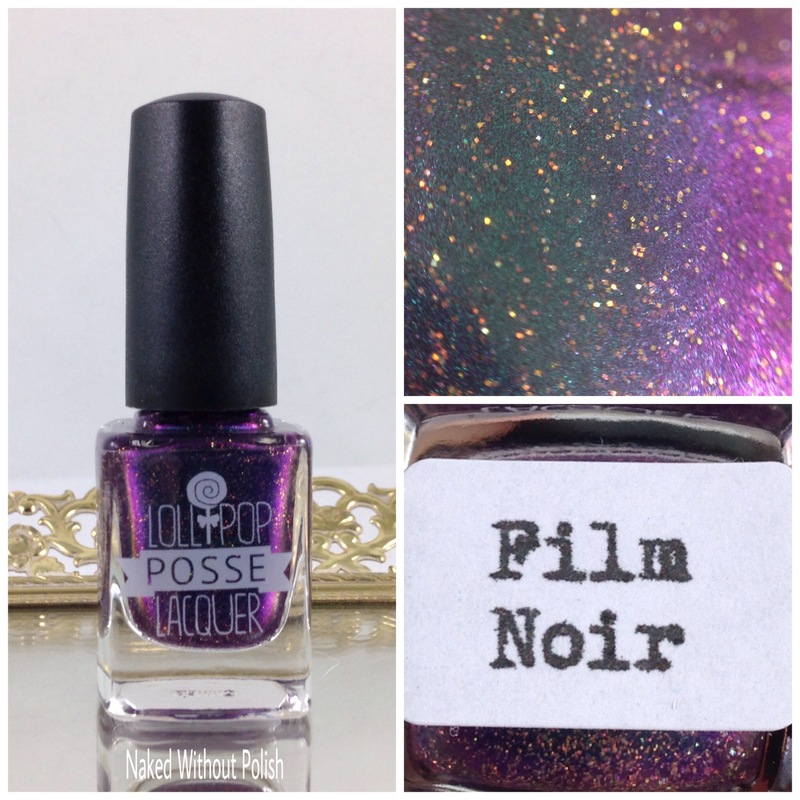 Film Noir is purple polish perfection! You won't be able to get away from the gorgeous blue flame. The same perfect formula and application you expect from this brand, and only two coats is all you'll need to get an opaque manicure. It's mysterious for sure! 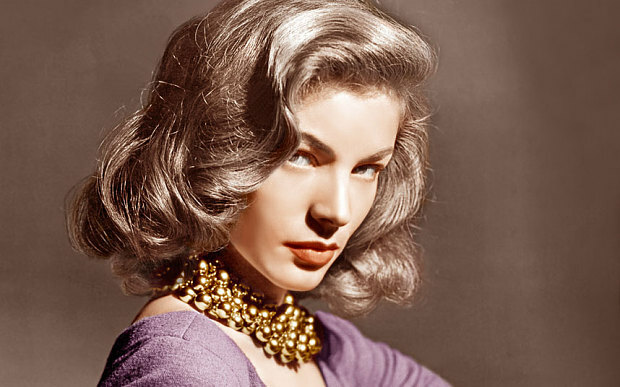 Just Whistle is inspired by the actress, Lauren Bacall. 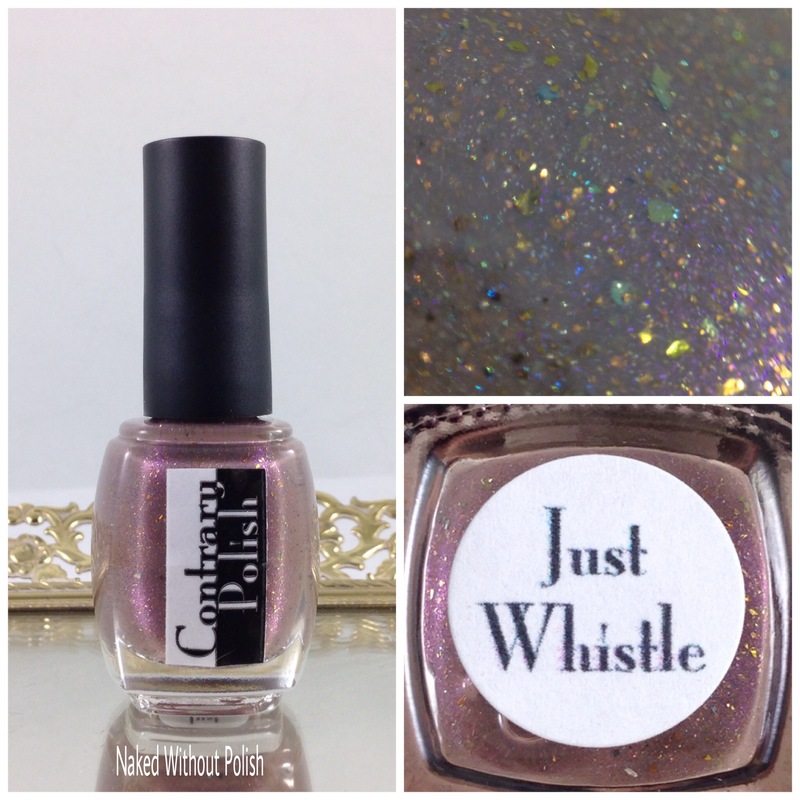 Just Whistle is described as "a slightly greyed taupe base with bronze flakes and micro glitter, a strong purple shimmer, and a bit of linear holo to add some extra sparkle". Shown is two coats of Just Whistle with top coat. Just Whistle is a fabulous work friendly neutral! I thought this one was going to end up a little sheer, but two coats were absolutely perfect. Such a wonderful formula and application. You might even find yourself whistling at your self! 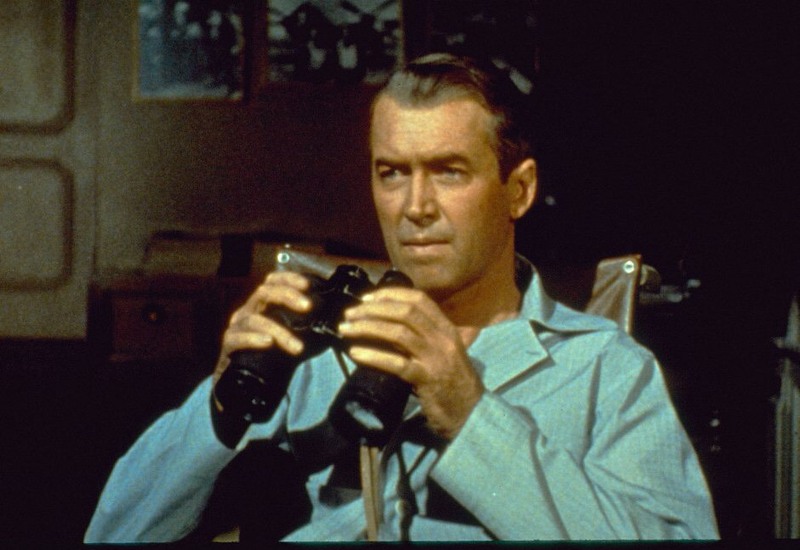 Detective Tom Peeping is inspired by the movie, Rear Window. 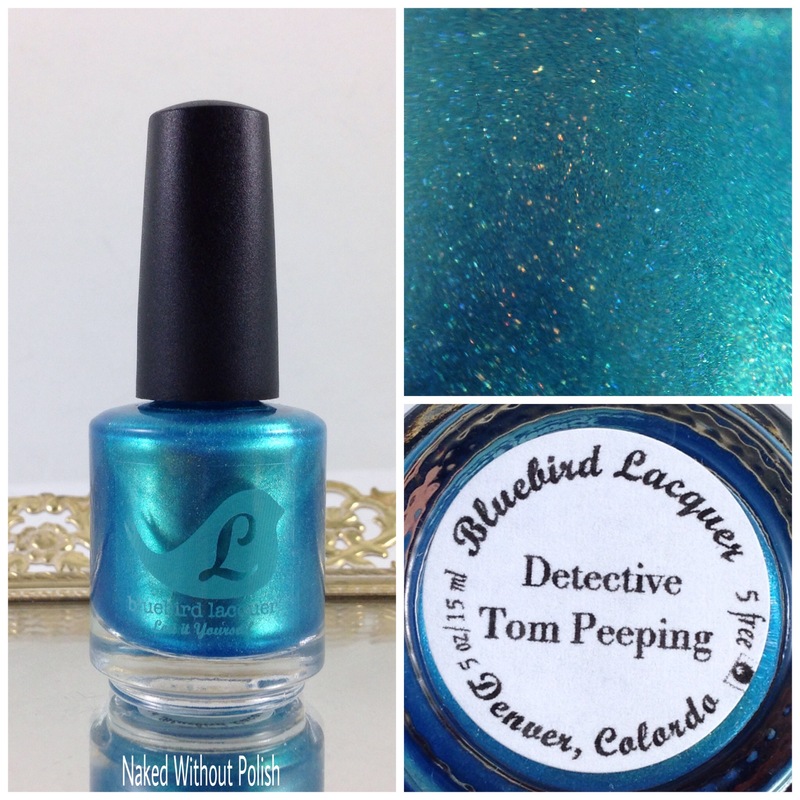 Detective Tom Peeping is described as "an aqua blue holo with golden shift". Shown is coats of Detective Tom Peeping with top coat. Detective Tom Peeping was a lovely surprise! 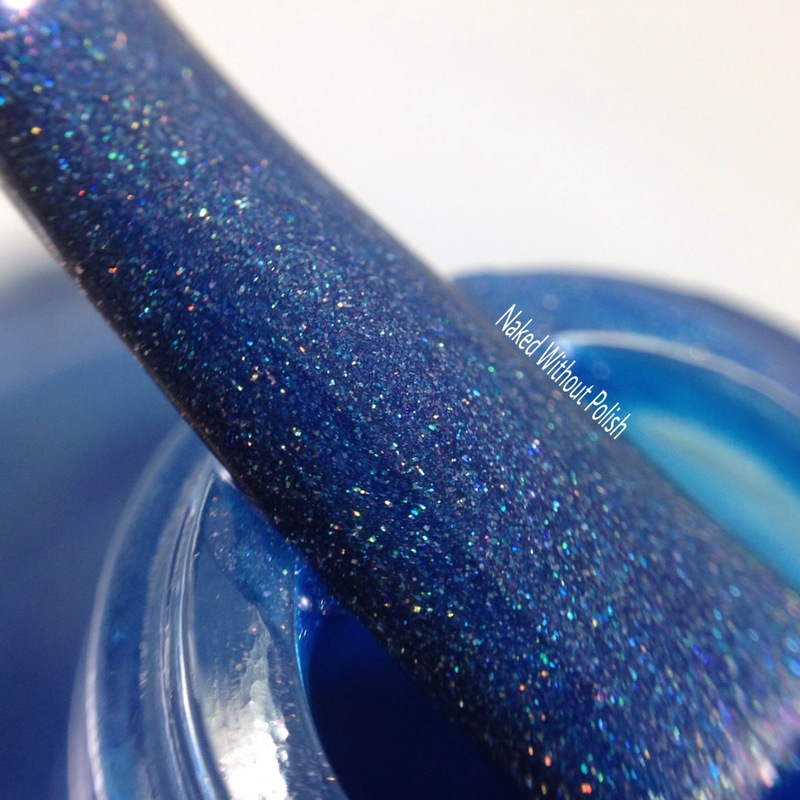 I thought it was going to be just another shimmery, almost metallic, blue, but you get this polish on your nails and your mind starts racing with ideas. It is just begging for some stamping and/or nail art to be paired with it. Incredibly smooth application from this flawless formula. 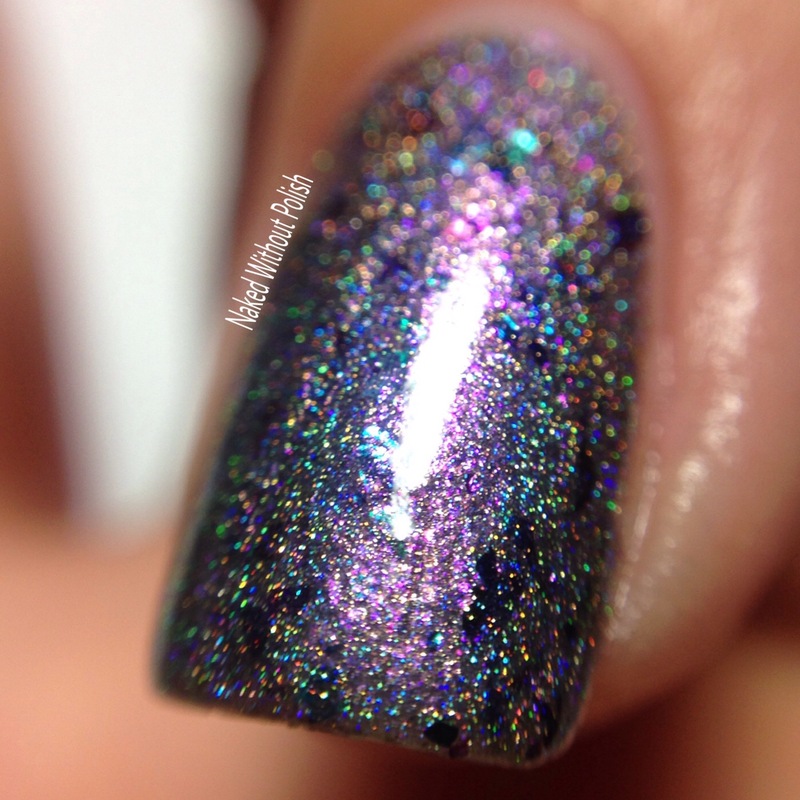 The holo is just the icing on the cake. 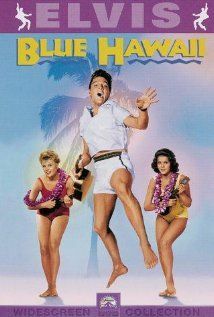 Falling in Love With...Chad is inspired by the movie, Blue Hawaii. 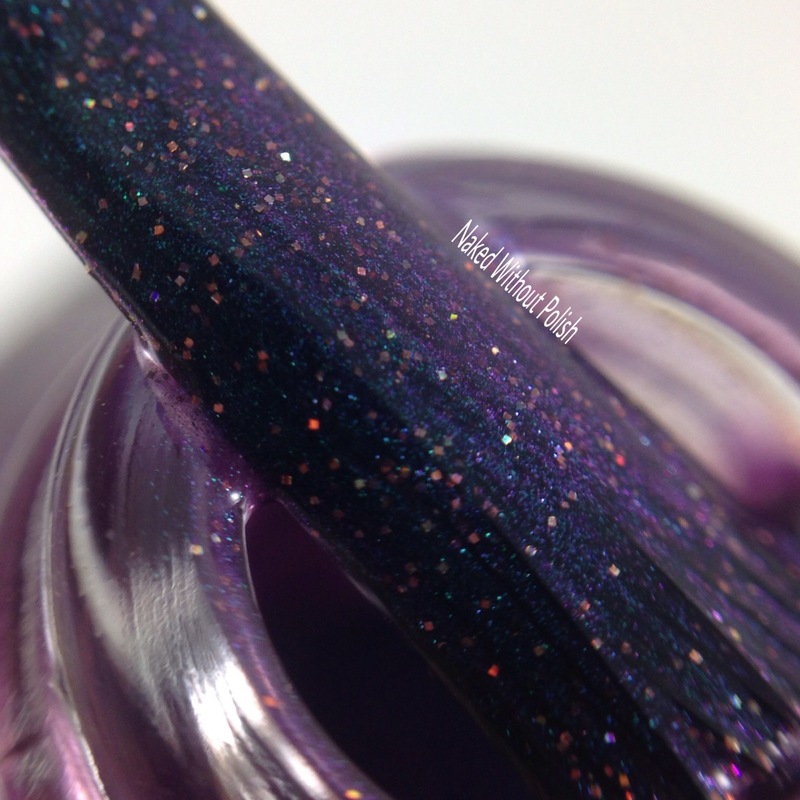 Falling in Love With...Chad is described as "a warm purple holo with blue flame, pink, purple, and blue holo micro glitter, and aqua/purple/pink and blue/green/gold iridescent shifting flakes". 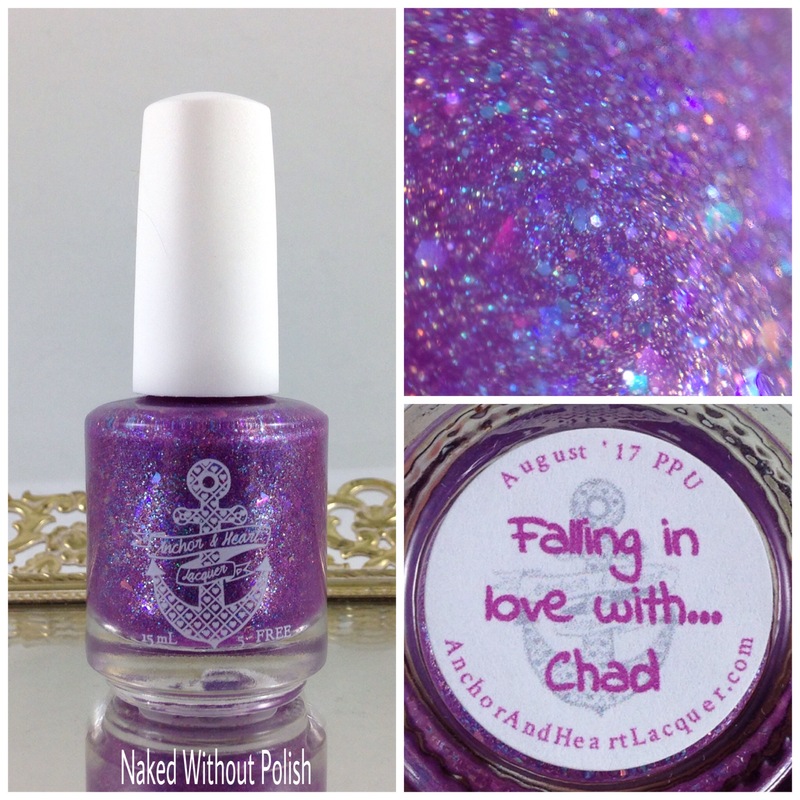 Shown is coats of Falling in Love With...Chad with top coat. Falling in Love With...Chad is a perfect representation of the movie poster! 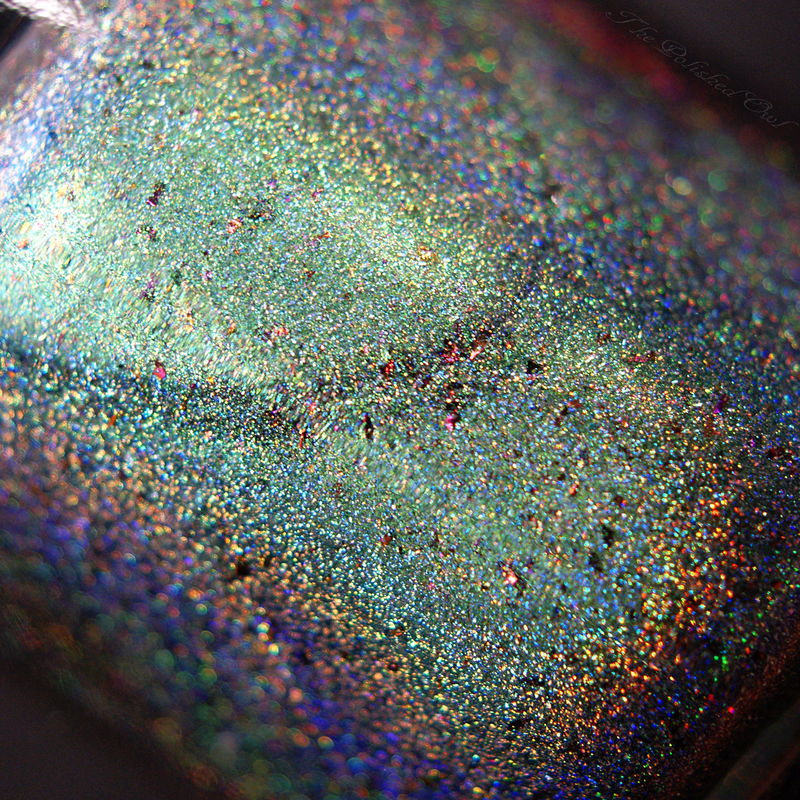 I almost did a third coat of this just to get more flakies and friends on my nails. In the bottle it looks like a lot going on, but once you get it on the nail...it just makes sense. Great application and formula. Seriously, so good! 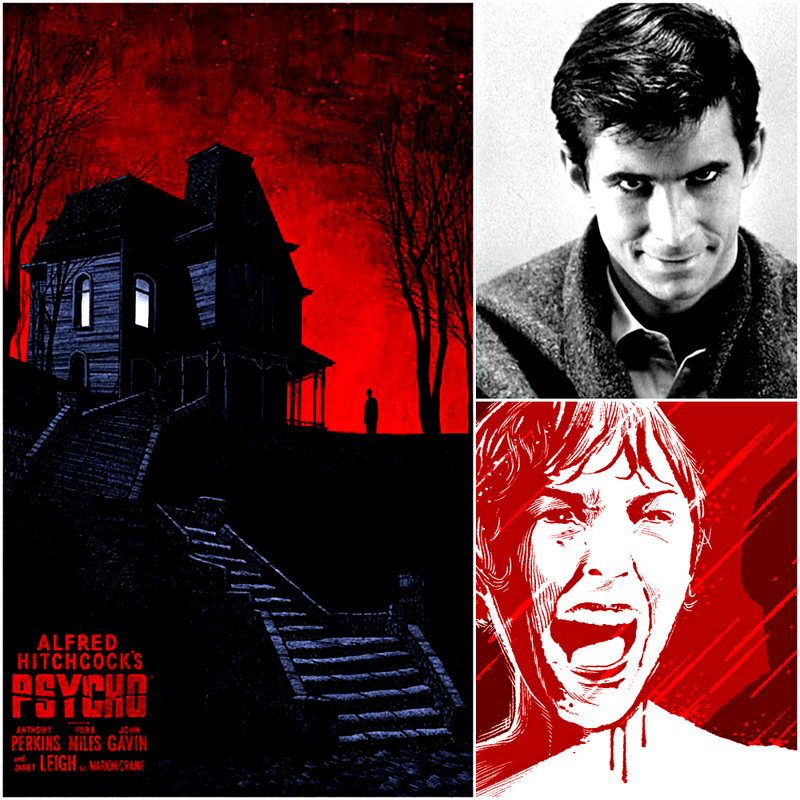 A Boy's Best Friend is inspired by the movie, Psycho. 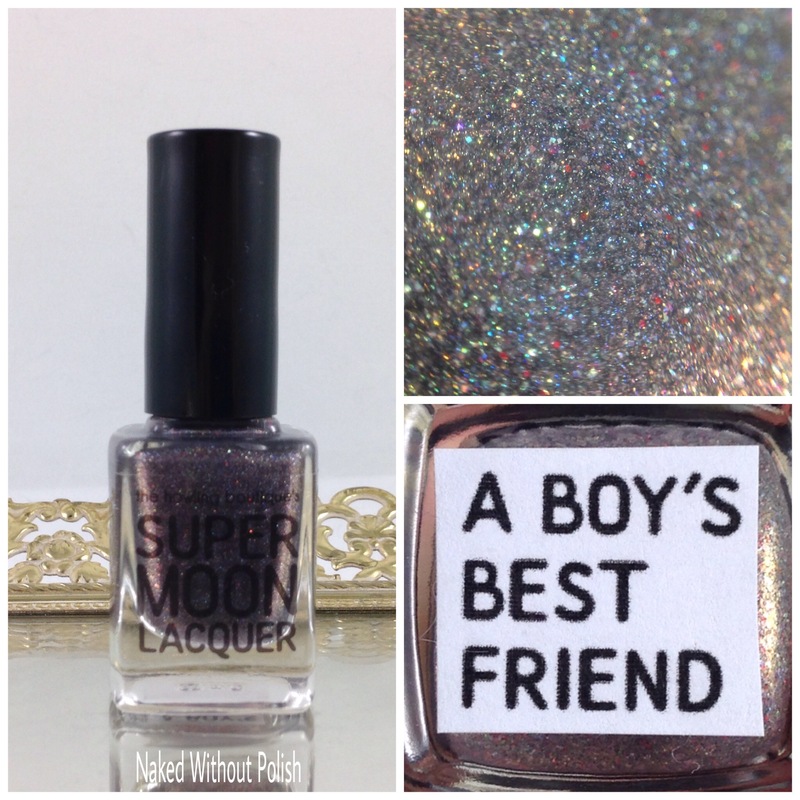 A Boy's Best Friend is described as "a dark-grey/black base that leans brownish-purple in certain lights-angles filled with red color-shifting shimmer, rose pearl flakies, red holo and metallic micro glitter, silver holo micro glitter, and silver holo flakies". 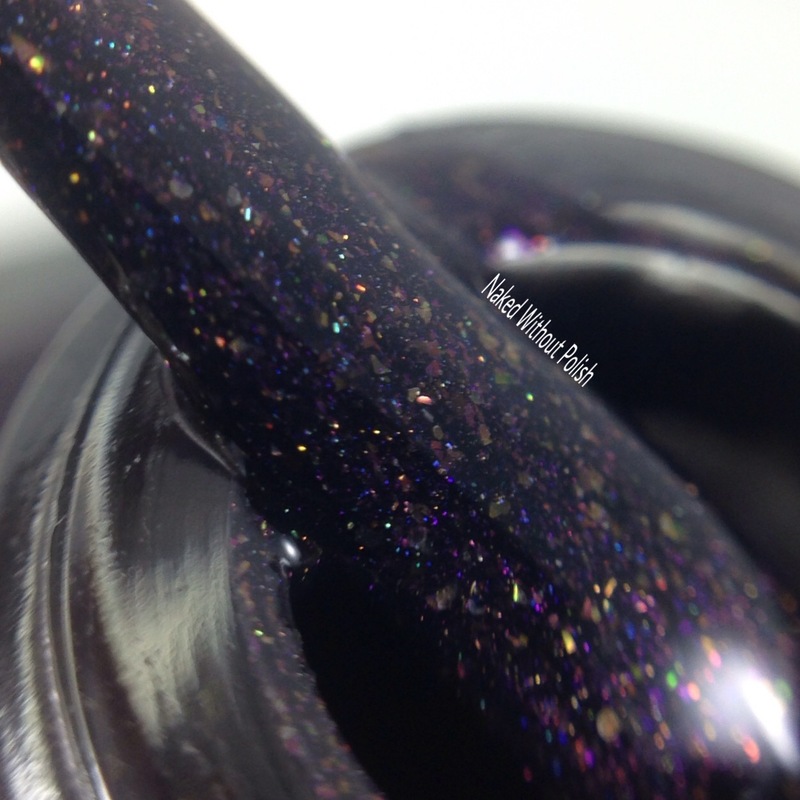 Shown is two coats of A Boy's Best Friend with top coat. A Boy's Best Friend is deep, dark, and mysterious. 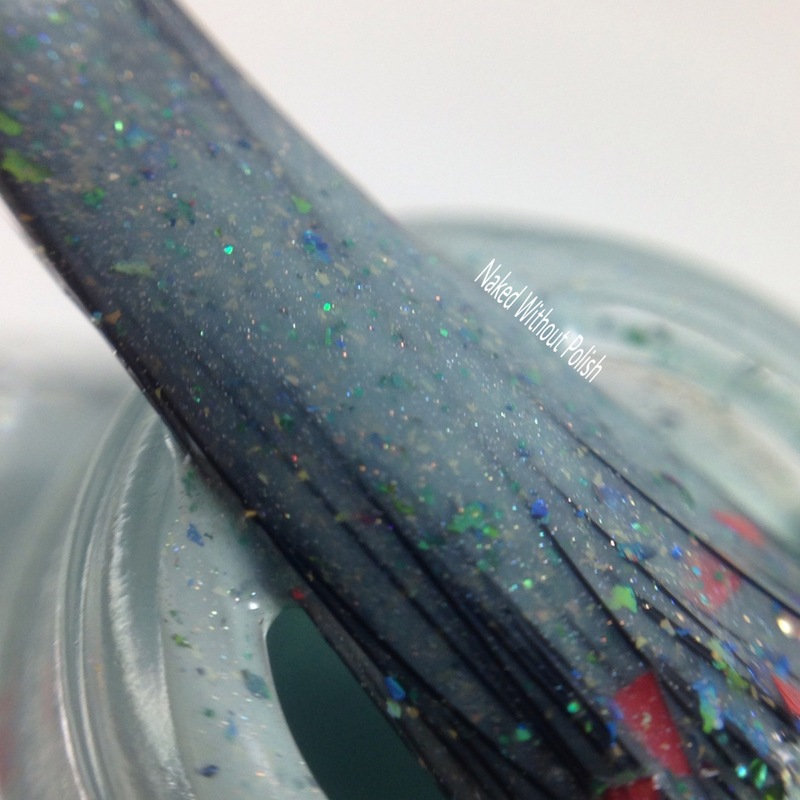 Could easily be a one coater, but you want that second coat for the extra sparkle and dimension. Fantastic formula and application. 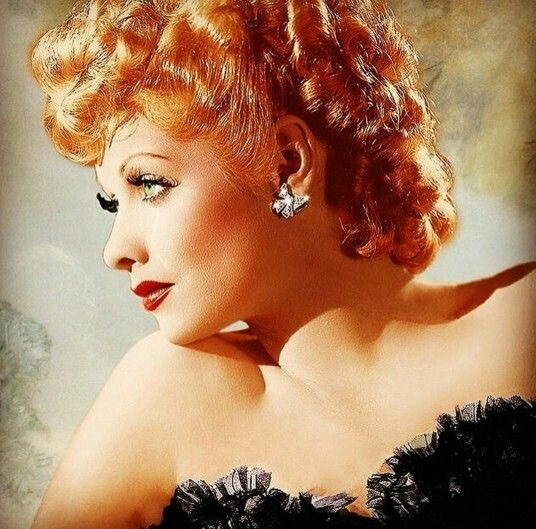 Soft Fire is inspired by the actress, Lucille Ball. 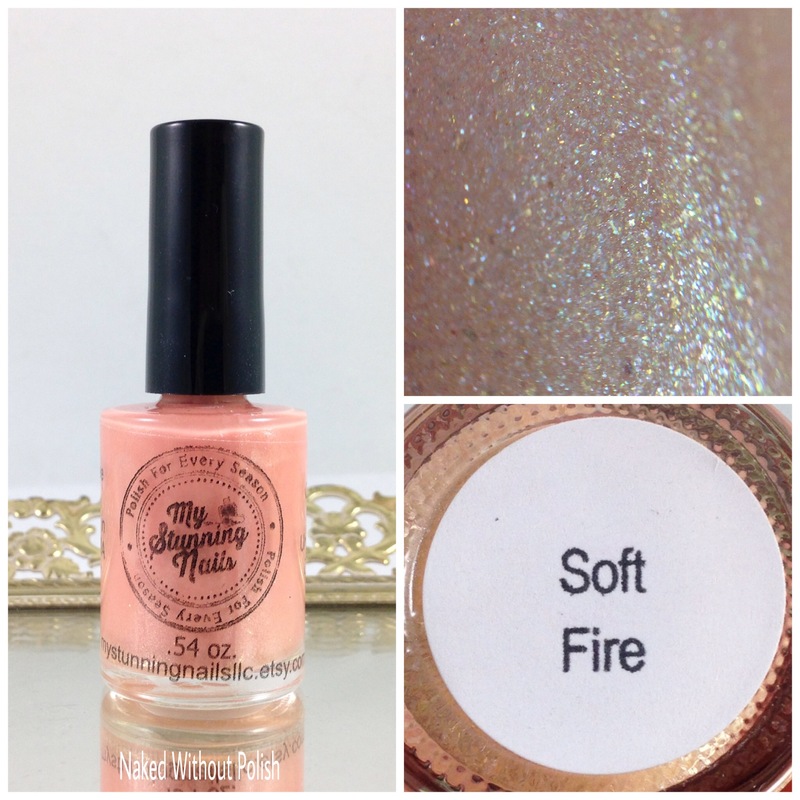 Soft Fire is described as "a lighted, holoed peach with gold reflects, and extra shimmer". Shown is three coats of Soft Fire with top coat. Soft Fire is my favorite polish this brand has made to date. 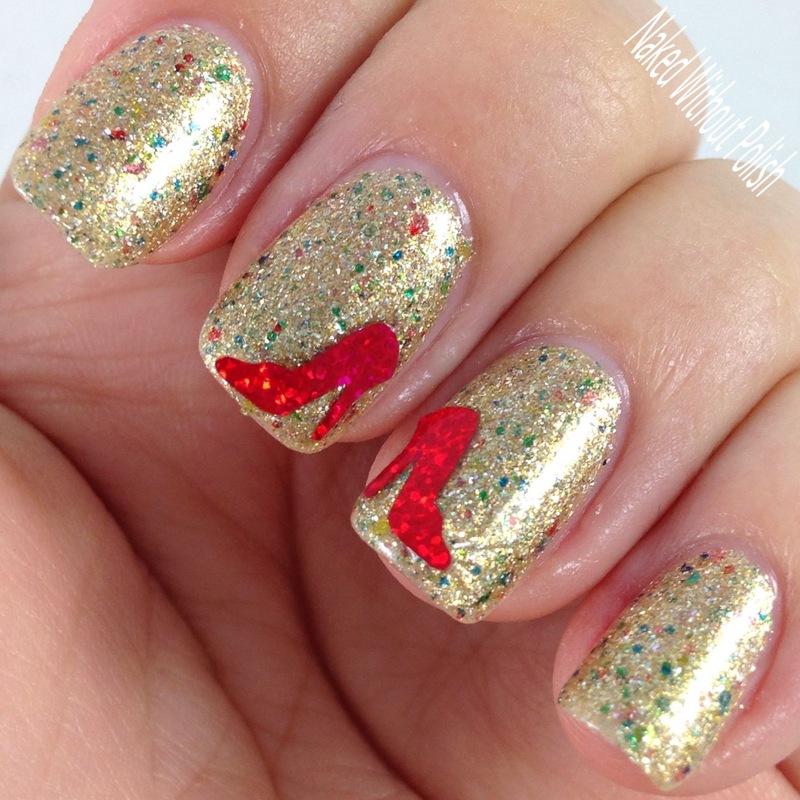 The color is delicate, and the shimmer accents it perfection. Great formula and application! You could easily only do two coats, but I messed up a nail and needed that third to fix it. Absolutely gorgeous! Where the Sky Meets the Sea is inspired by the movie, South Pacific. 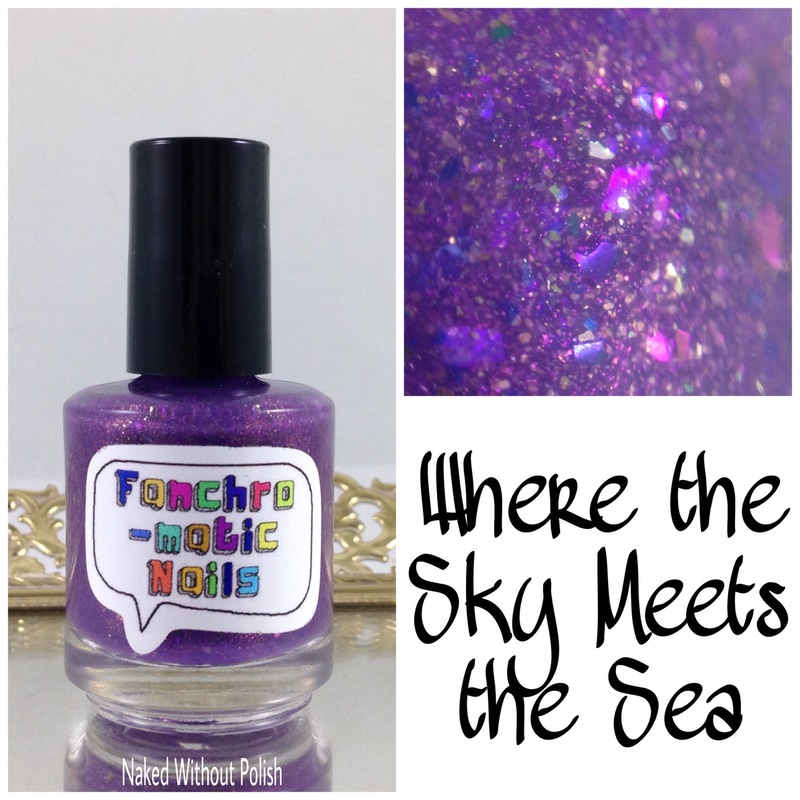 Where the Sky Meets the Sea is described as "a purple-to-pink thermalchromatic polish with a peachy gold shimmer, and iridescent and color shifting flakies in pink, purple, gold, green, and blue". 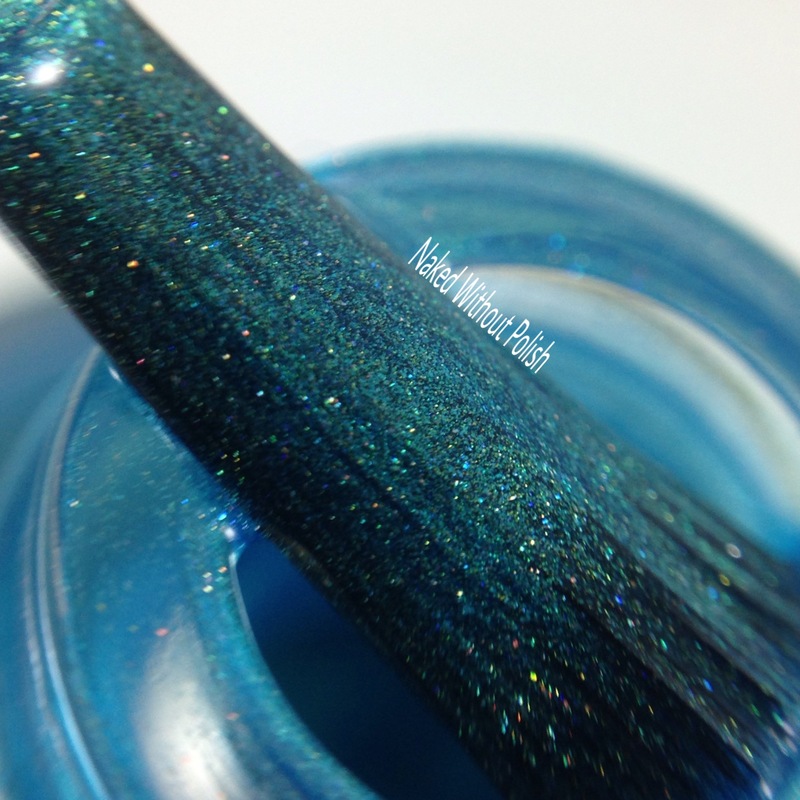 Shown is three coats of Where the Sky Meets the Sea with top coat. Where the Sky Meets the Sea is a stunning interpretation of the inspiration. A fantastic formula with a flawless application. Two coats probably would have been fine, but with thermals, I usually do three coats just to be safe. 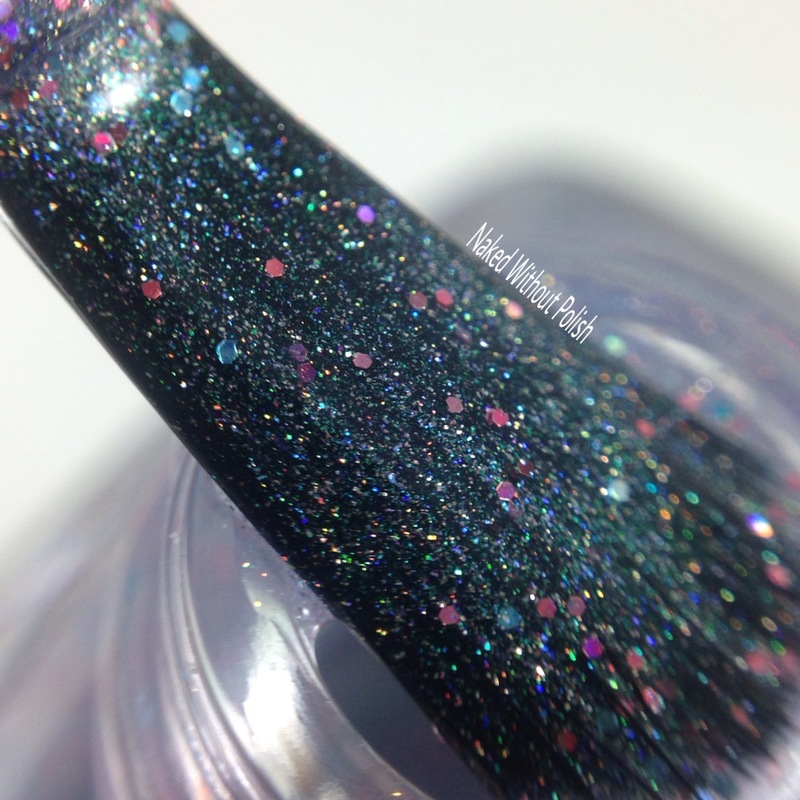 This polish has the perfect amount of flakies and sparkle...there is no fishing for anything here. 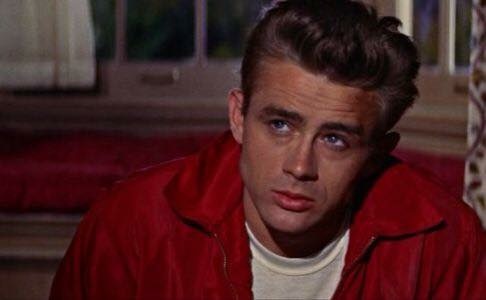 Rebel Without a Cause is inspired by the movie, Rebel Without a Cause. 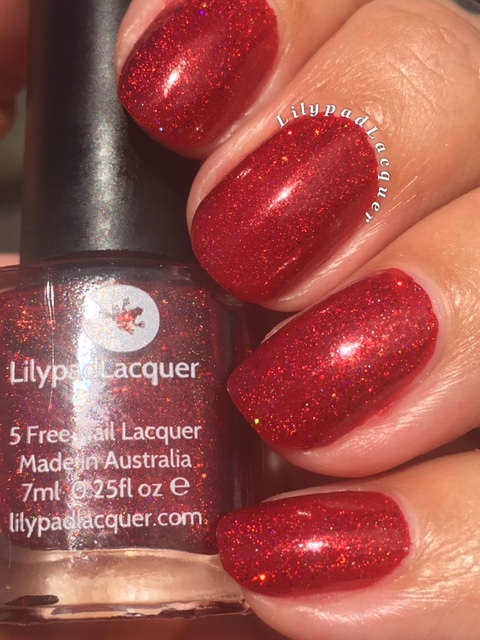 Rebel Without a Cause is described as "a bright red holo with added sparkle". Shown is two coats of Rebel Without a Cause in sunlight. 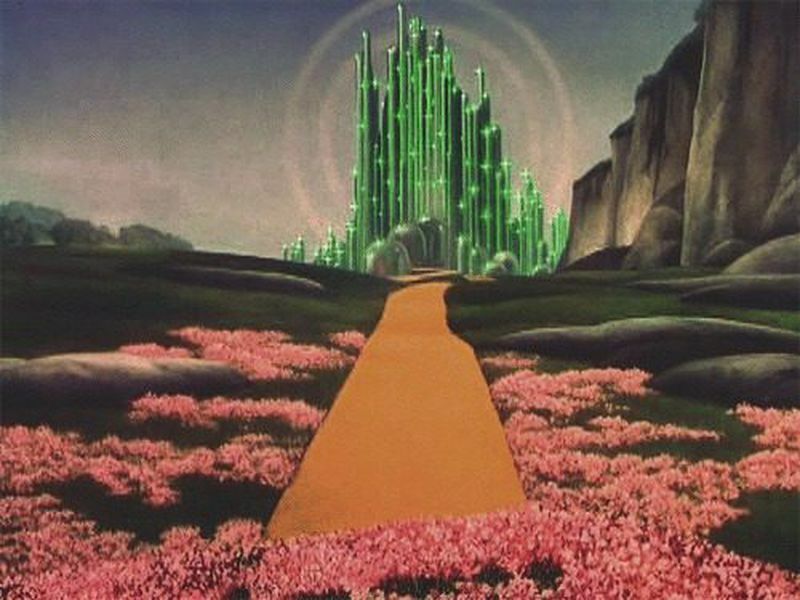 Poppy Fields of Emerald City is inspired by the movie, The Wizard of Oz. 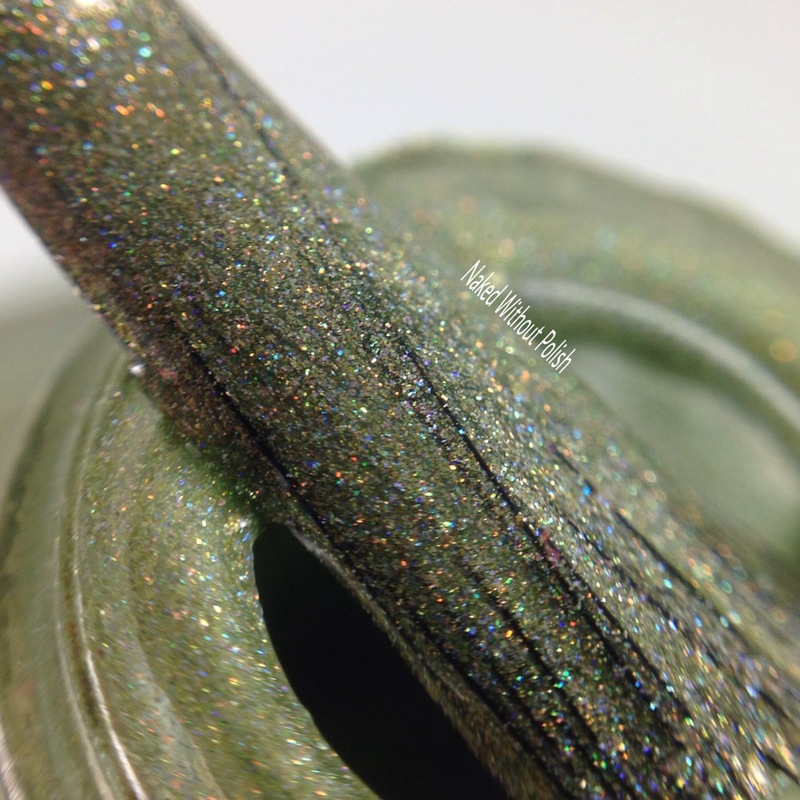 Poppy Fields of Emerald City is described as "a green/gold/blue shifting base with pink/purple/orange flakies and holo pigment". 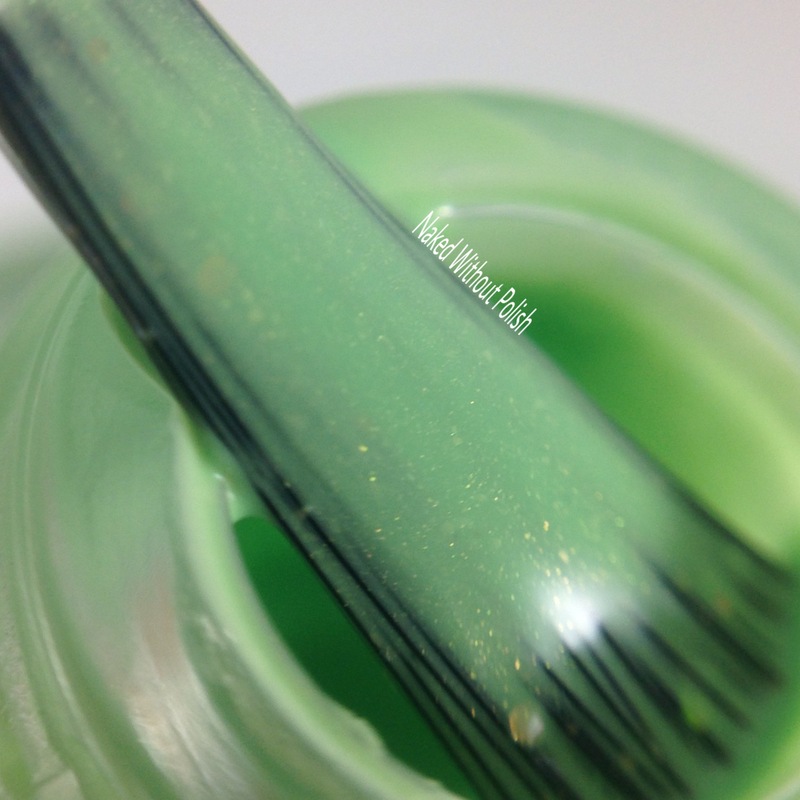 For swatches of Poppy Fields of Emerald City, please check out CDBNails blog post HERE. 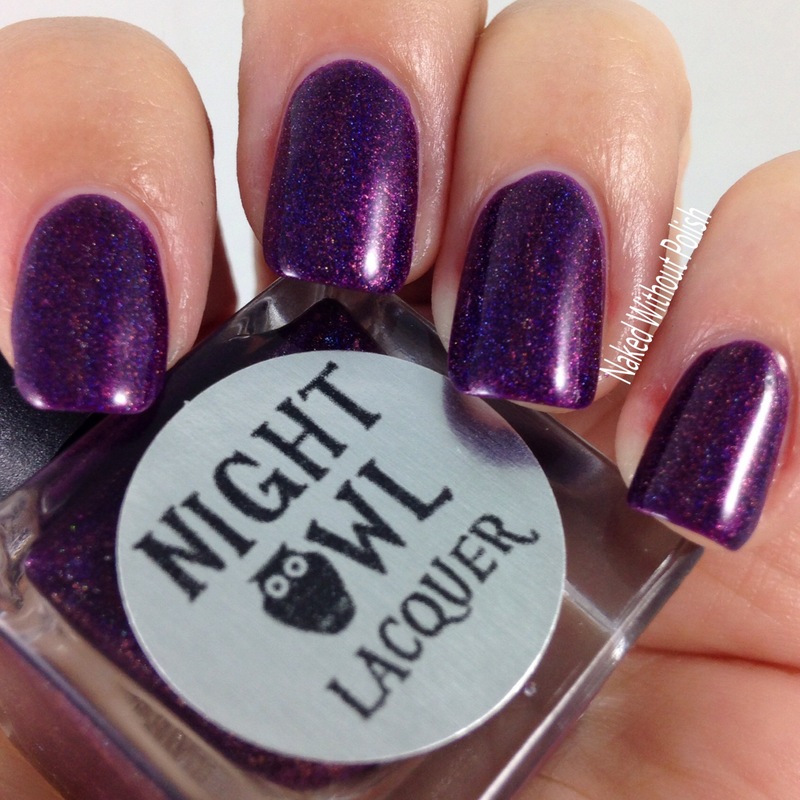 And check out ThePolishedOwl's Instagram to see her swatches. 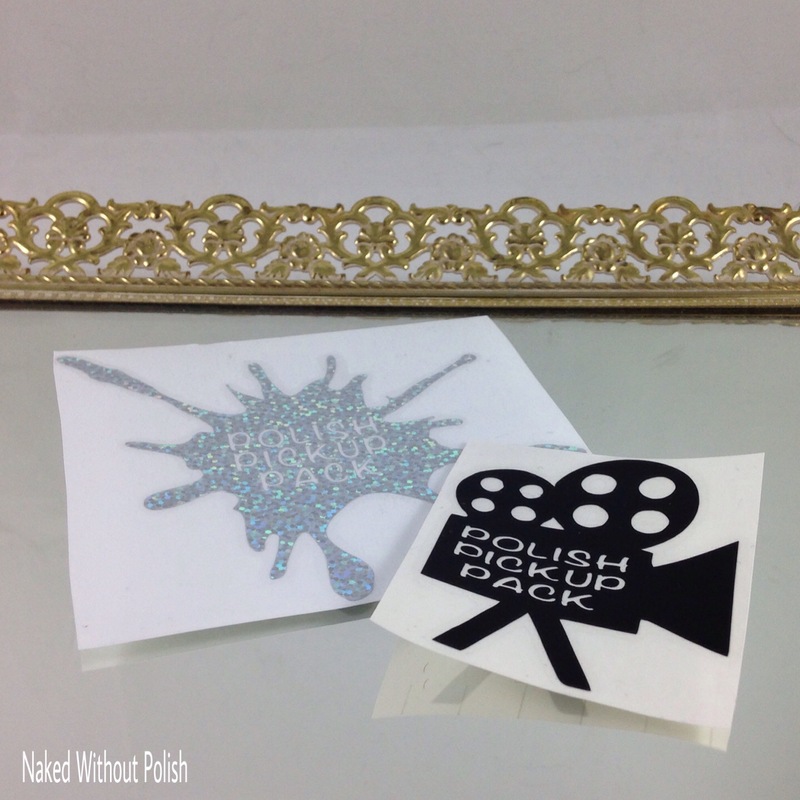 In addition to all the polishes, all these vinyl decals and stencils are available. These are super flexible and easy to use. After I had a mishap with one of the decals pulling the polish up a bit, I found that if I slightly bent them before I pulled them off the sheet they would already be slightly curved to fit on my nail a bit smoother. This turned out to work much better! 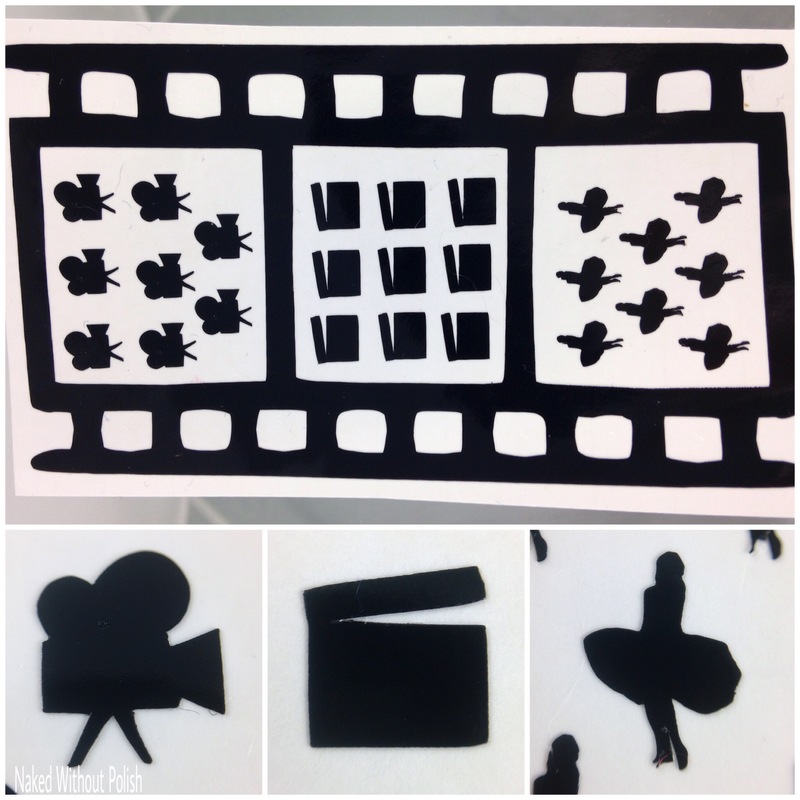 In addition to the above decals and stencils, you can get two different stickers for your Helmers. There you have it! 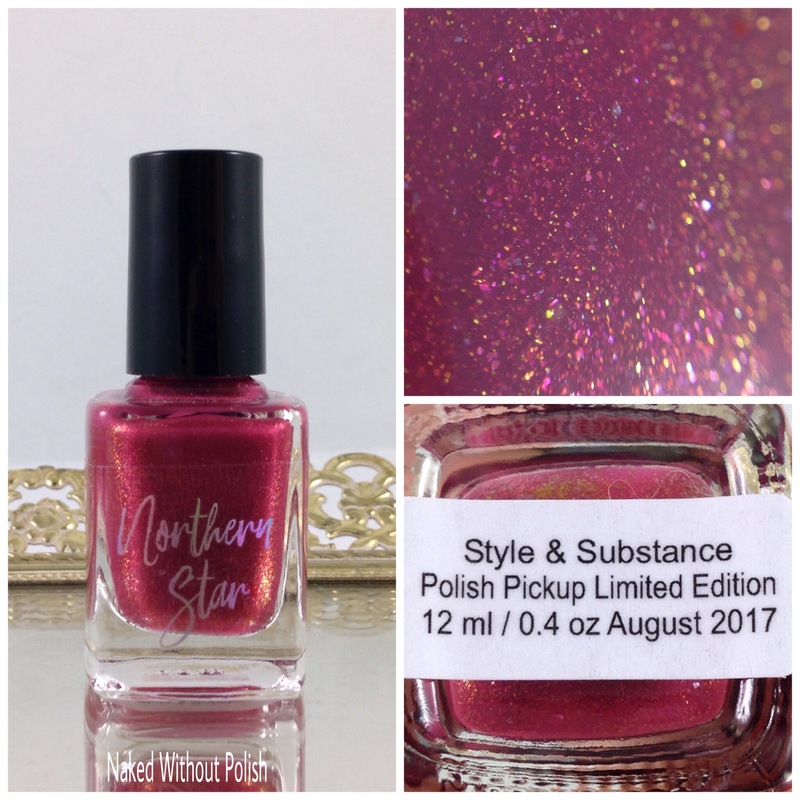 That is everything you'll be able to purchase coming up during the August Polish Pickup. Yeah, I know it was a lot, but I wanted you all to be able to have everything in one spot for referencing. Everyone did a great job with their interpretation of the Old Hollywood theme. Each one is incredibly beautiful! 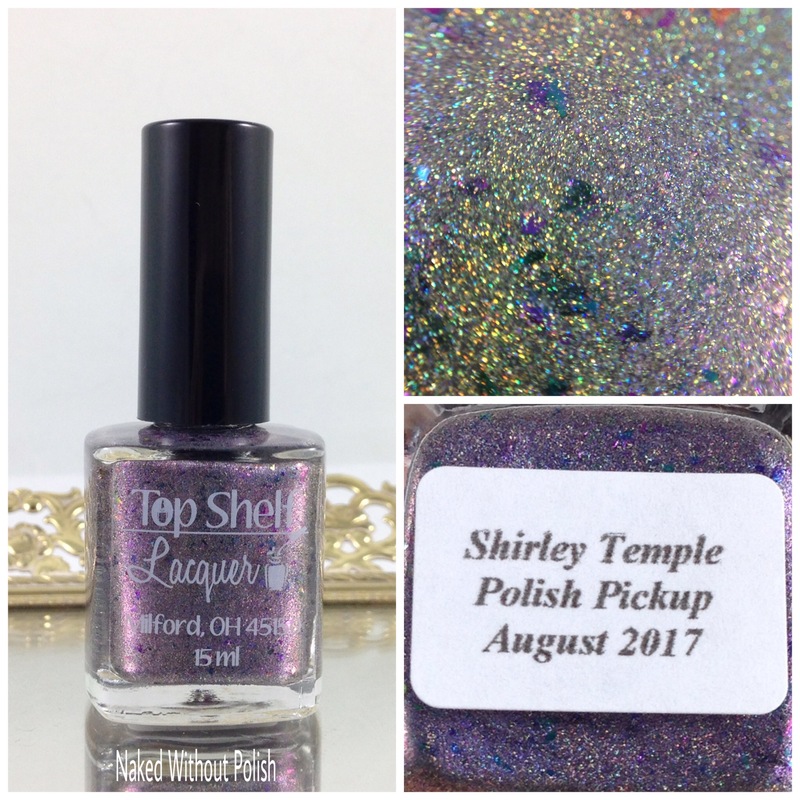 The August Polish Pickup will be open from Friday, August 4th at 11 am EST through Monday, August 7th at at 12 midnight EST. 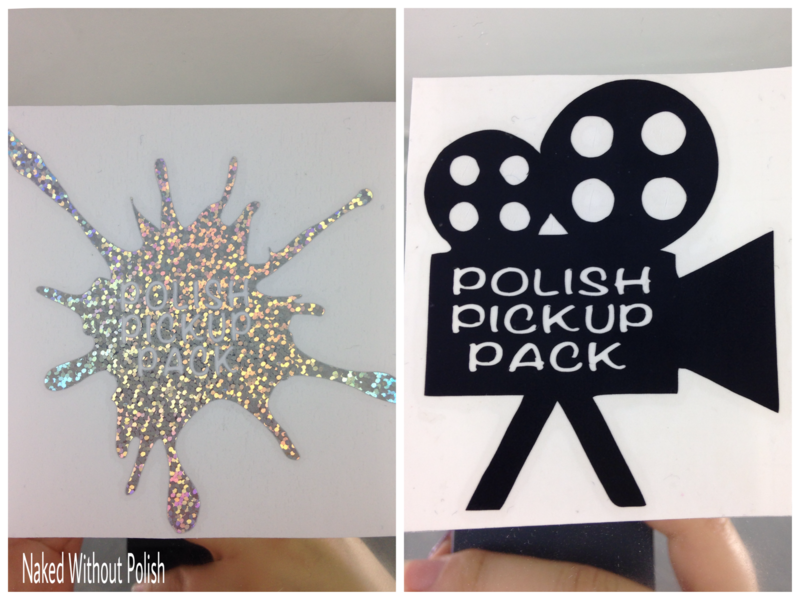 Each of these will be available at www.polishpickup.com. Each one is a different price so make sure you pay attention. I don't know how you all are going to decide! It's so difficult! Make sure you are following the Polish Pickup and all the brands on all their social media platforms (links below and throughout the post) to stay updated on news, releases, and sales. I'm looking forward to finding out what is on all of your wish lists for this upcoming weekend. So...which ones are jumping out at you?